Last Christmas when the family was all gathered for the holidays, we started tossing around places that we would like to vacation in the summer. After a lively discussion, we settled on Maine. The only state with one syllable…Maine was the winner! Anyway, we chose the coastal town of Ogunquit which means “beautiful place by the sea” and it fully lived up to its name! With 90% of its coast open to visitors and a gorgeous white beach, who could complain? The weather was a bit rainy in the beginning of the week, but that didn’t dampen our spirits. We were lucky to have some 70+ degree weather in no time and it was just lovely. And now let’s talk about food…..gluten free food! The majority of our meals was eaten out and about, but after an unfortunate incident where both Daria and I got “glutened,” Daria’s boyfriend, Andy, (a trained chef), came to our aid and cooked dinner for us a few nights. We were so lucky to have both his skills and willingness to help us and our gastrointestinal tracts that soon we were ready to take the plunge again into the restaurant scene! Breakfast made by Chef Andy and Chef Daria included her famous gluten free pancakes from Batter (her business) and his specialty of bacon and sausage. They prepared breakfast more than a few times, but I was so busy eating, I forgot to photograph all of the wonderful treats!! 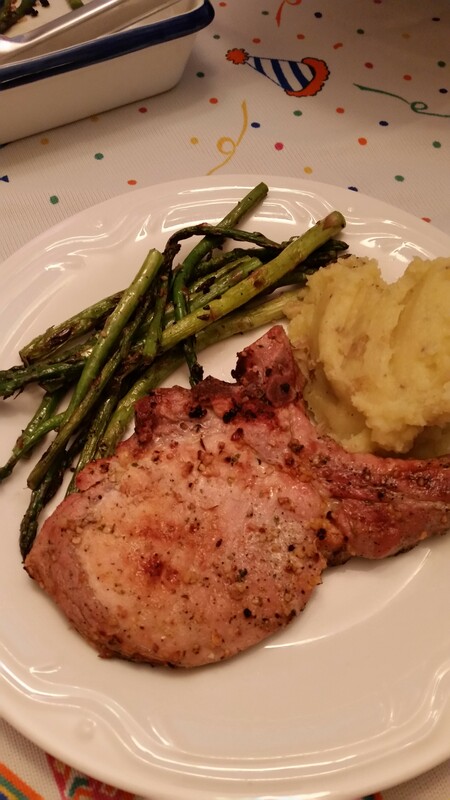 Next we enjoyed a home-cooked meal of grilled pork chops with Andy’s special rub, grilled asparagus, and mashed potatoes that I am still dreaming about! 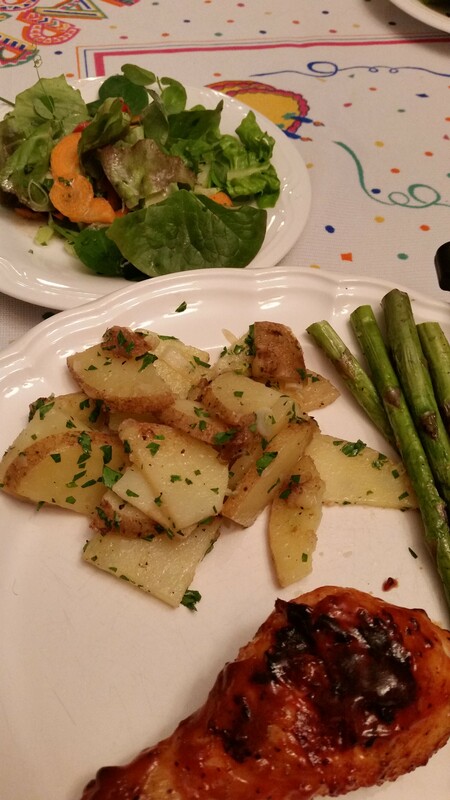 And barbequed chicken made the menu, too….yum! 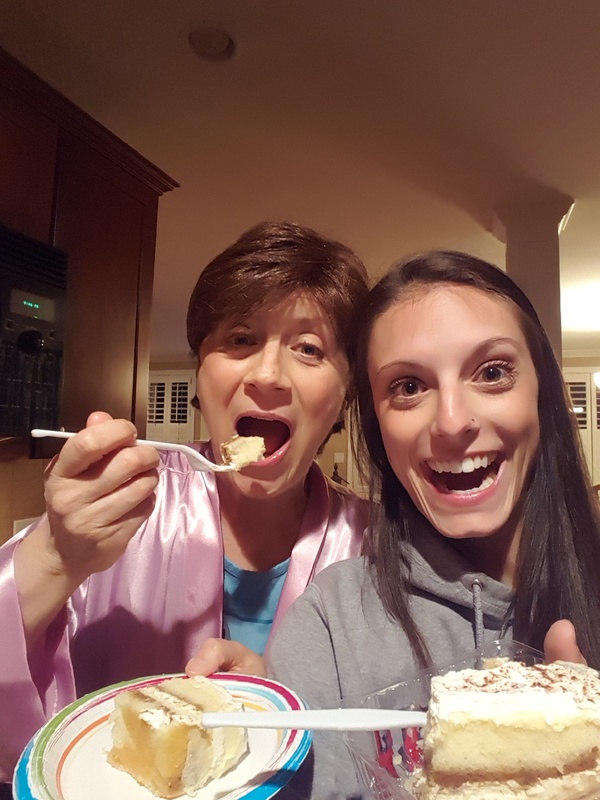 Our “Junebabies Birthday Celebration” included our baking Funfetti vanilla cupcakes and we celebrated by eating them with ice cream….we were having so much fun, that we didn’t photograph the food as much as the singing and wish making! 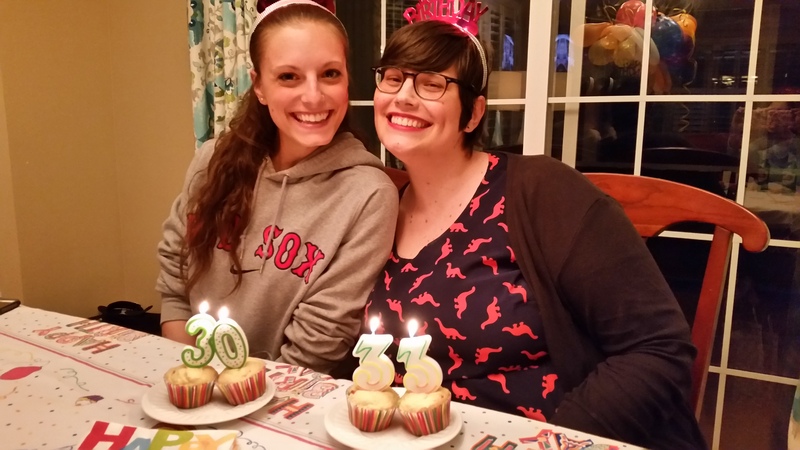 And I am so happy to be with my favorite Junebabies for our birthdays! 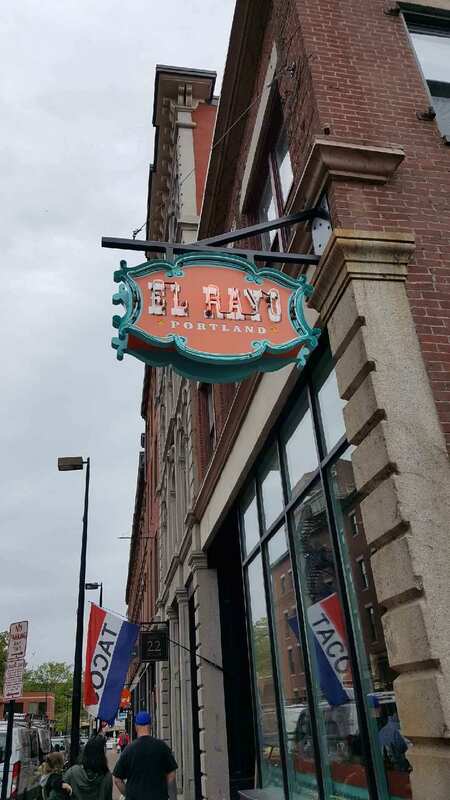 We ventured up to Portland (about 45 minutes north of Ogunquit) a few times and found some wonderful things to eat there. 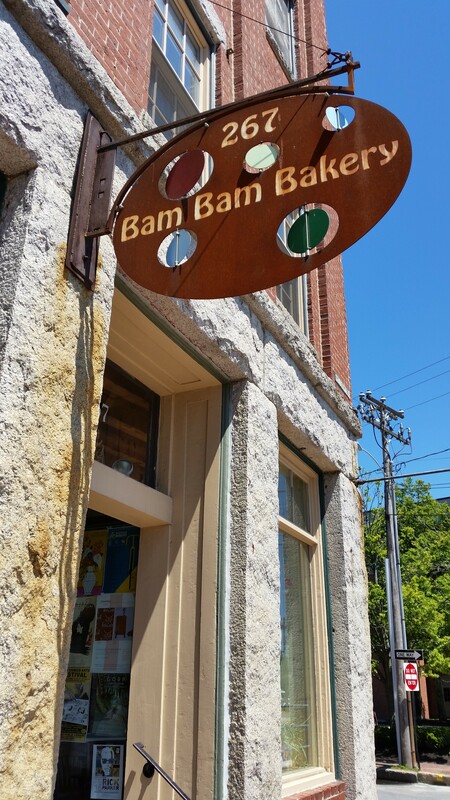 The best place, by far, was Bam Bam Bakery! 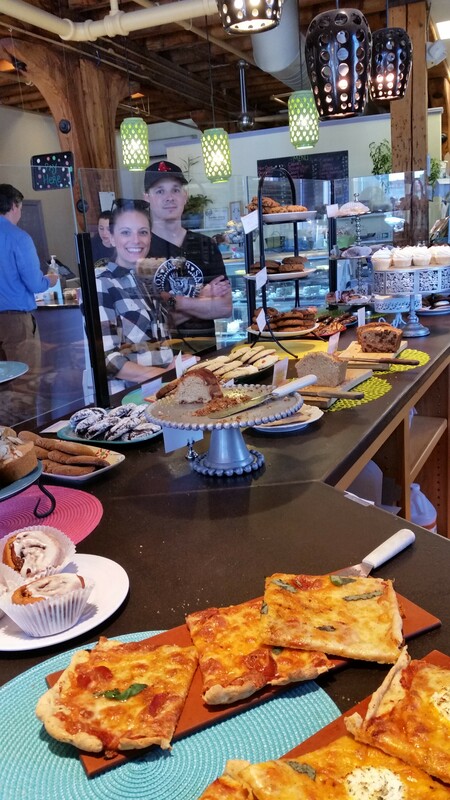 A gluten free bakery in the heart of Portland, it had just about everything we could ask for. 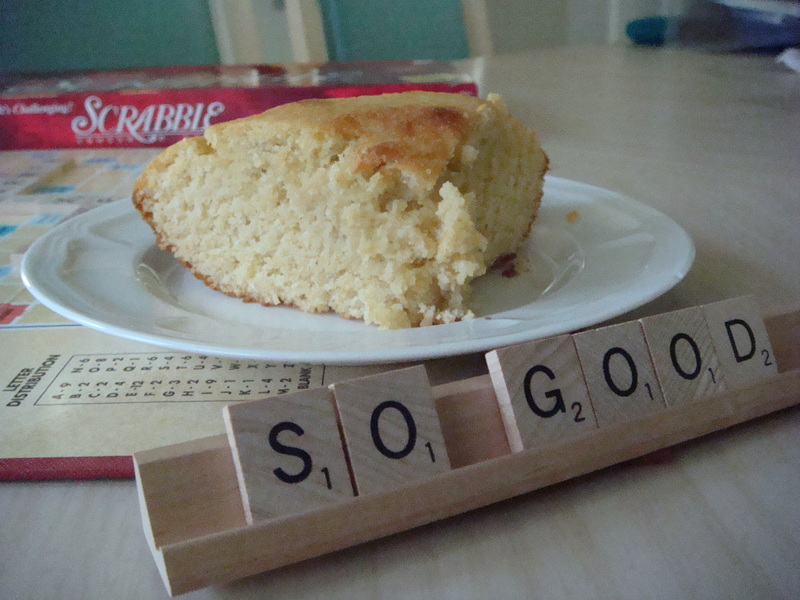 From goodies to savory items, where everything is made from scratch, this little gem had it all! Daria and I were in gluten free heaven! 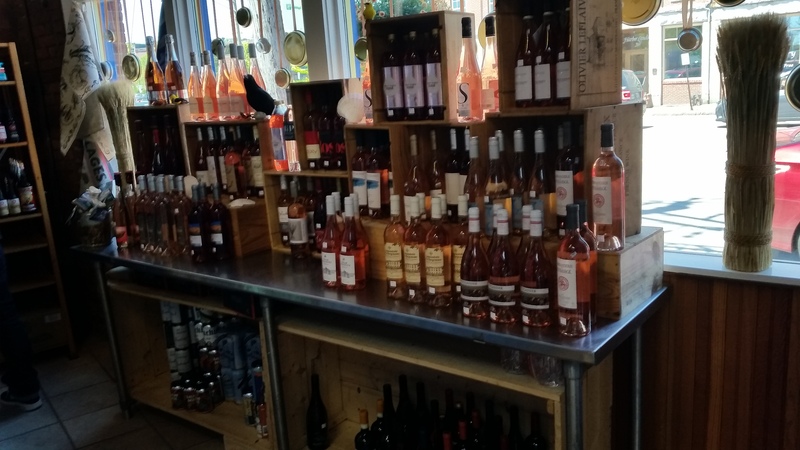 And right across the street was Browne Trading Market which had fresh fish, caviar, and smoked seafood as well as cheeses, jams, vinegars, etc., and of course, wine! 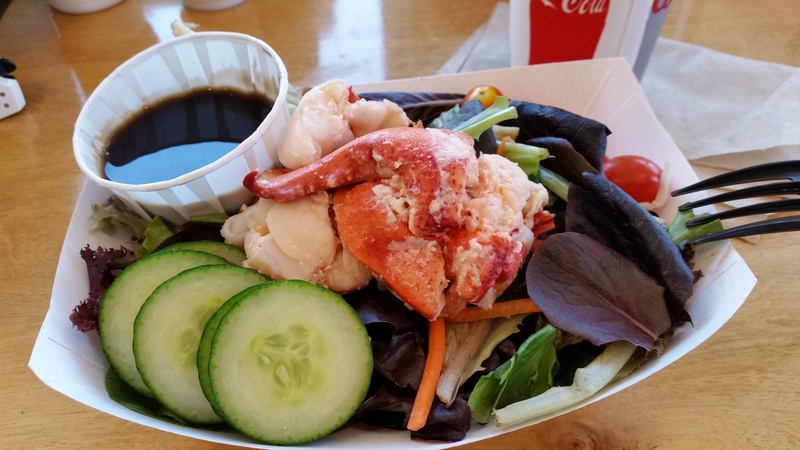 For lunch, one trip into Portland, Lewie and I stopped in The Lobster Company and I ordered a lobster salad as you can see! The problem was that upon ordering, the girl never said that there would be a 45 minute wait for our food!! 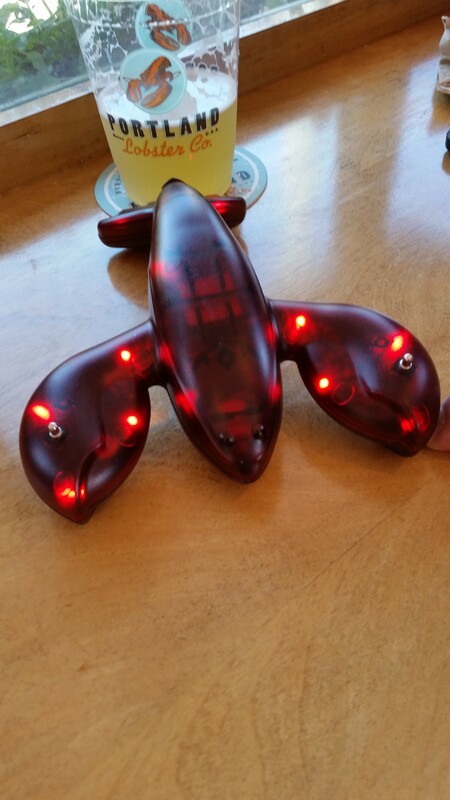 Only saving grace was that the lobster-shaped table pager, which we couldn’t wait for to vibrate, was adorable! Daria and Andy headed to El Rayo Taqueria for some much talked about tacos…they love Mexican and were super excited! Most (notice I said most) Mexican food is gluten free, so it’s good choice! 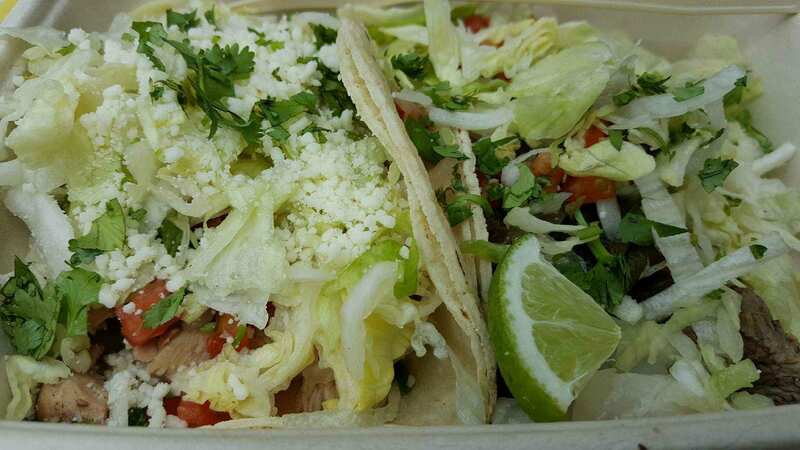 Al Carbon taco with char grilled chicken with pico de gallo salsa, cotija cheese, shredded lettuce & radish on the left and Carne Asada taco with char grilled steak with rajas, pico de gallo, shredded lettuce & lime on the right. Both delicious and gluten free, of course! Elevation Burger was another choice for a change of pace and it did not disappoint! 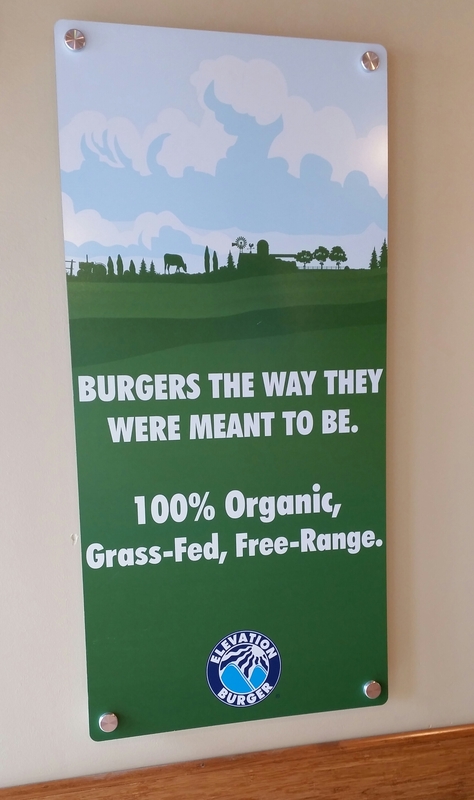 100% organic, grass-fed, free range burgers make all the difference….so fresh and tasty. All that was missing was a gluten free bun, but they had a lettuce wrap, so that’s what I got! 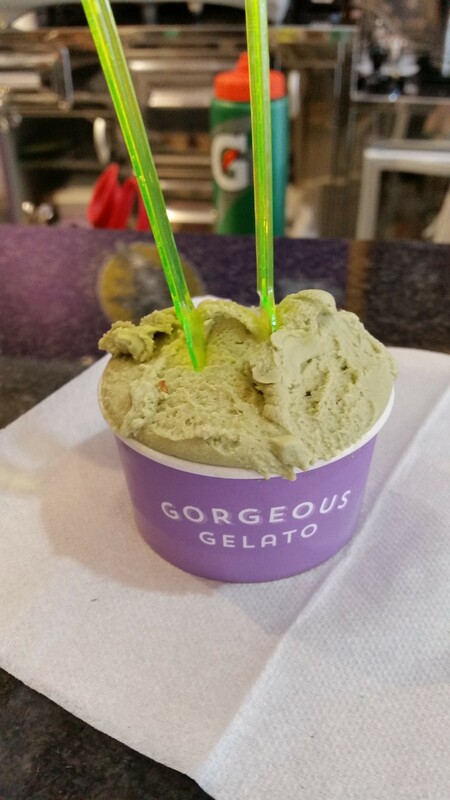 Dessert was a scrumptious cup of gelato from Gorgeous Gelato. 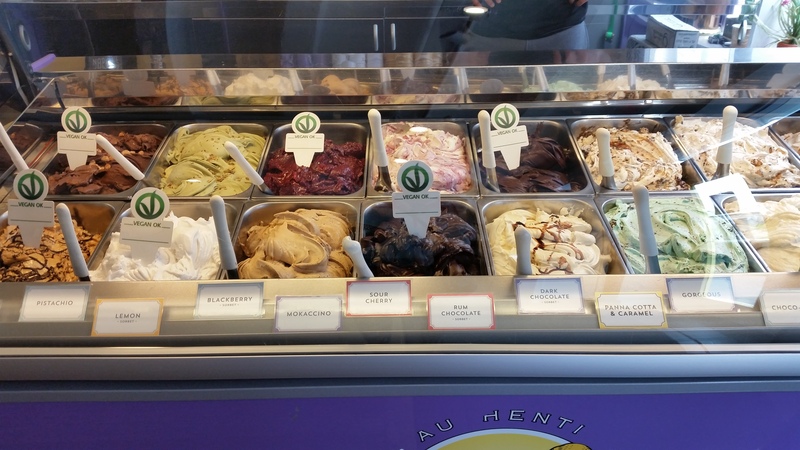 Making a selection was tough but I decided on pistachio….oh dear! So smooth and delightful! 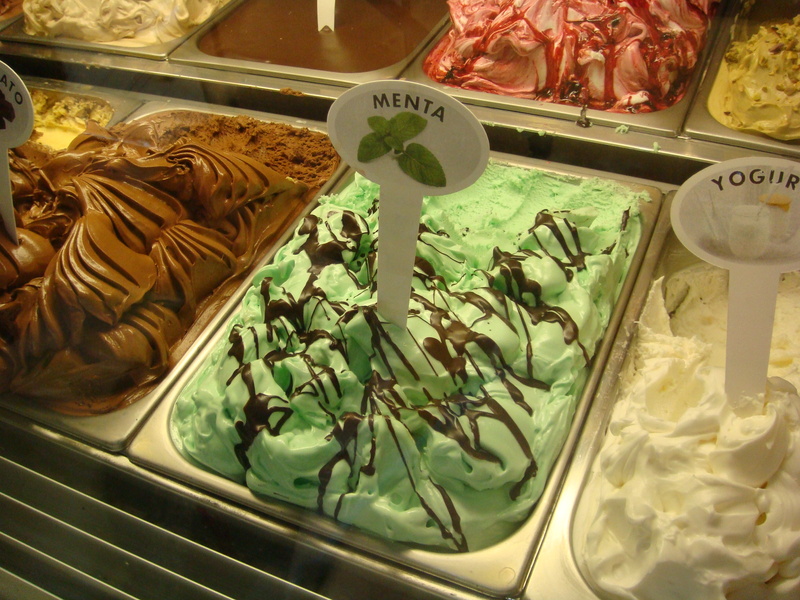 The owners are from Milan, Italy, and this gelato is true Italian gelato! Wish I had a bigger stomach! All of the live lobsters are caught by local lobstermen and are held in ocean water tanks before steaming. 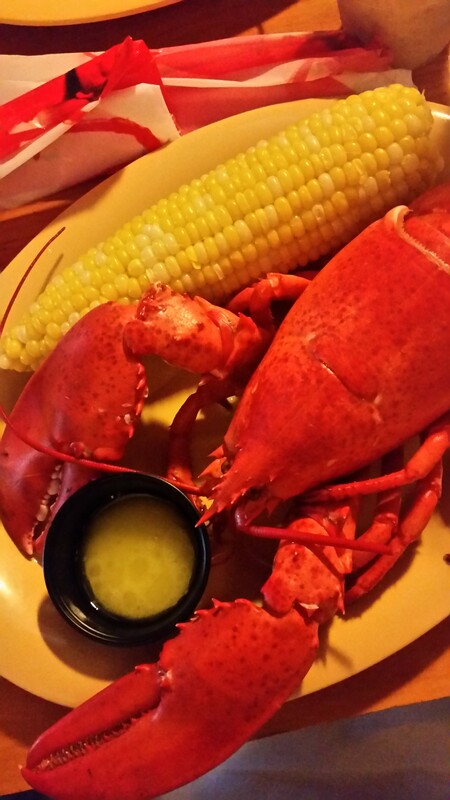 This had to be the sweetest lobster we ever ate! And the “Maine experience” included shelling the whole lobster and even though it took us a while (we are complete novices), it was very enjoyable. 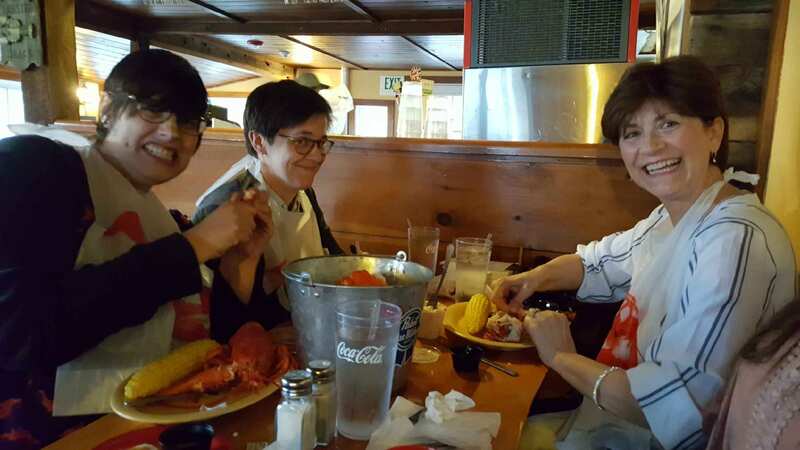 Thank goodness for the “lobster bibs”…they proved to be so necessary! Before our lobster dinners arrived, we decided to try the homemade New England clam chowder. 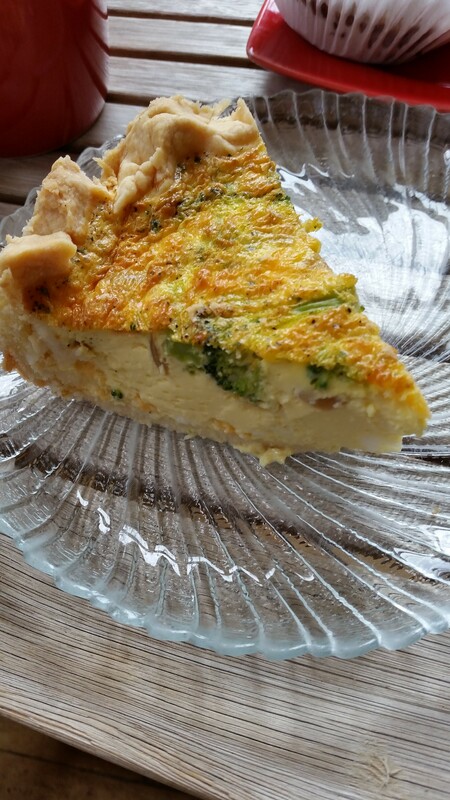 It is a family recipe that doesn’t have any thickening flour which worked with our gluten free diet! 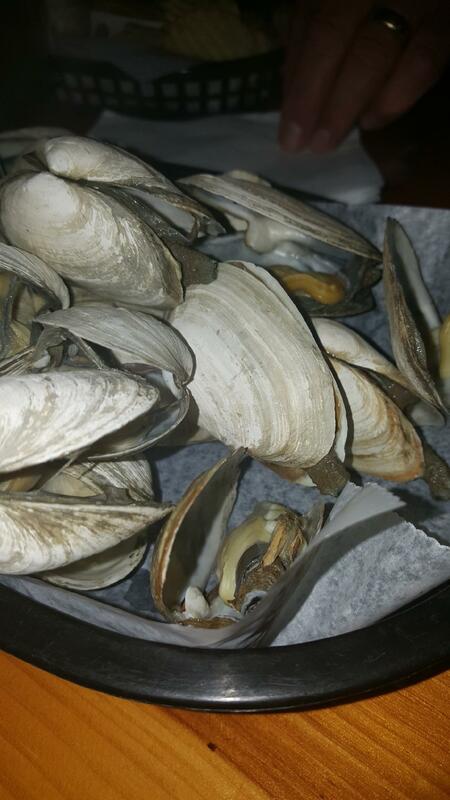 Full of clams, haddock, potatoes, onions, spices, milk and cream….oh what a delicious way to start the meal! And I can’t forget the steamers! We were a very happy table with happy bellies! Even though it wasn’t planned, we seemed to save the best restaurant for last! 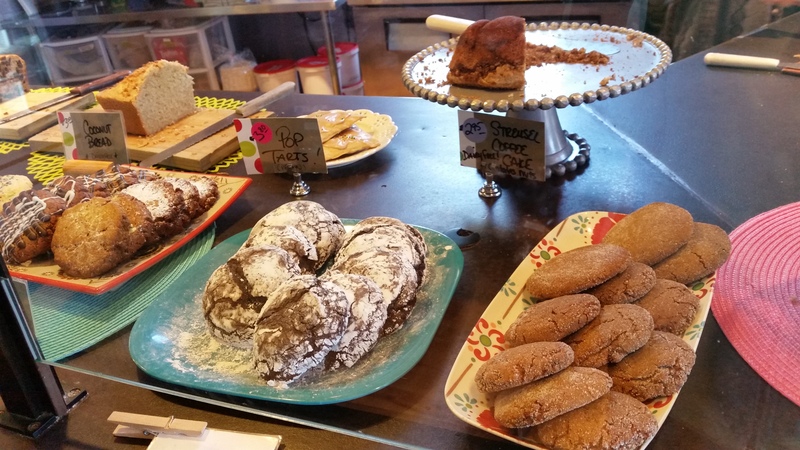 With so many gluten free options, we were thrilled to find and experience Roost Café and Bistro in Ogunquit. 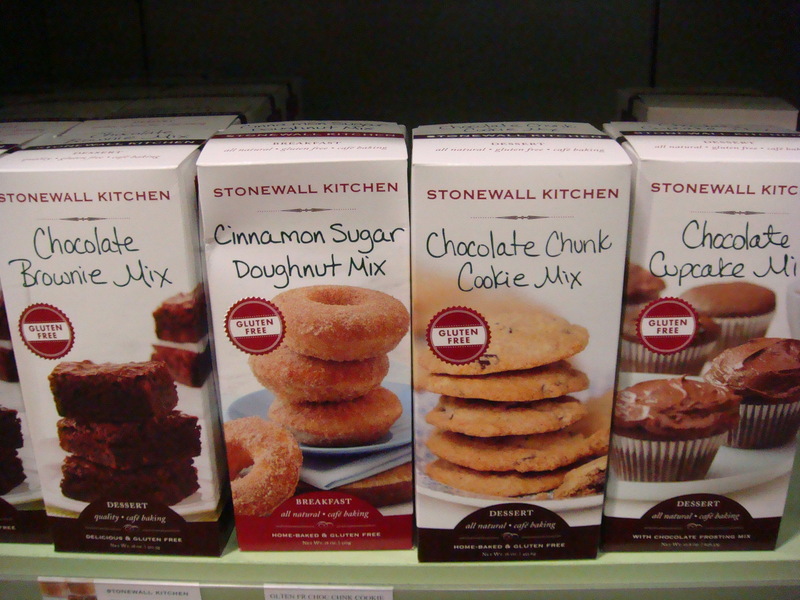 Their homemade gluten free products are made on site by their chefs and the proof is in the taste! We had gone to this wonderful eatery on Friday evening (our last night of vacation) and wish that we had discovered it sooner! Of course we wanted to try everything but settled on two gluten free appetizers. 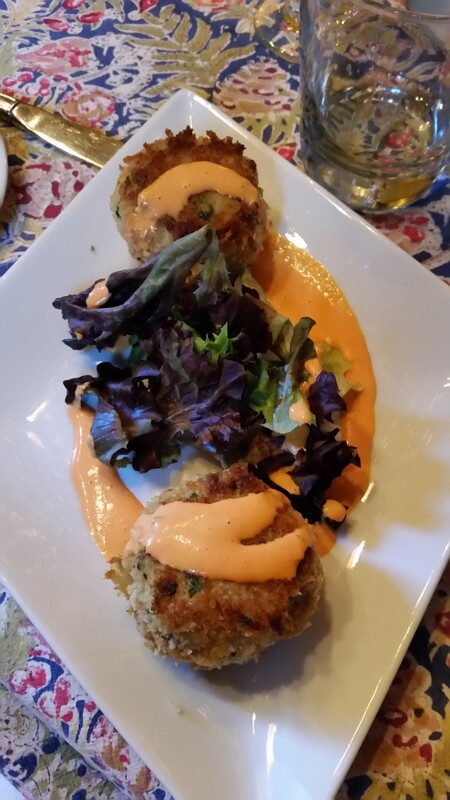 The first was the Pan Fried Crab Cakes with red pepper aioli and dressed greens. They were amazing! 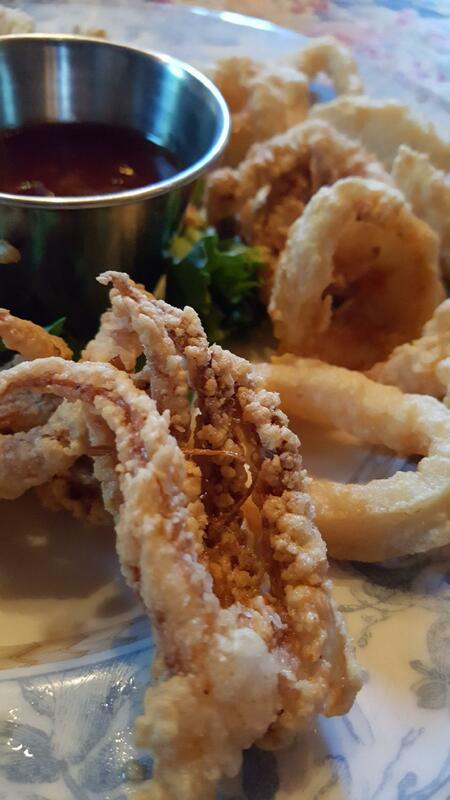 Next, was the Calamari with roasted garlic, pineapple and sweet chili sauce. This breaded and fried delight was the best ever! 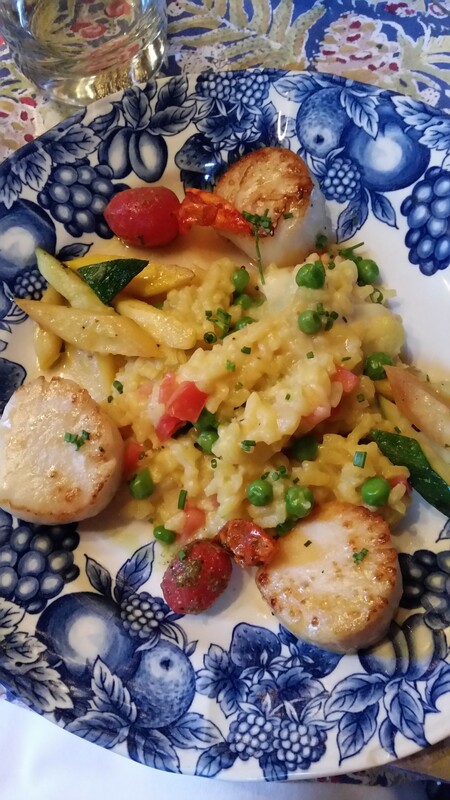 My entrée was the Seared Scallops, pan roasted with creamy sweet pea risotto, and house veggies. 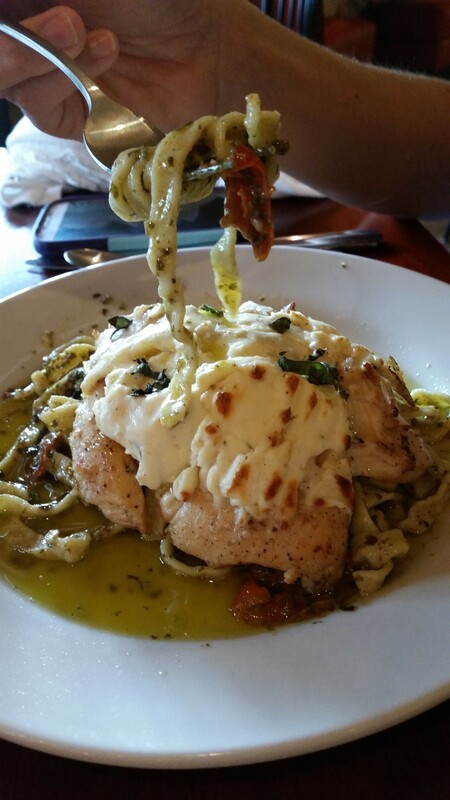 Full of flavor and so delicious! All gluten free! 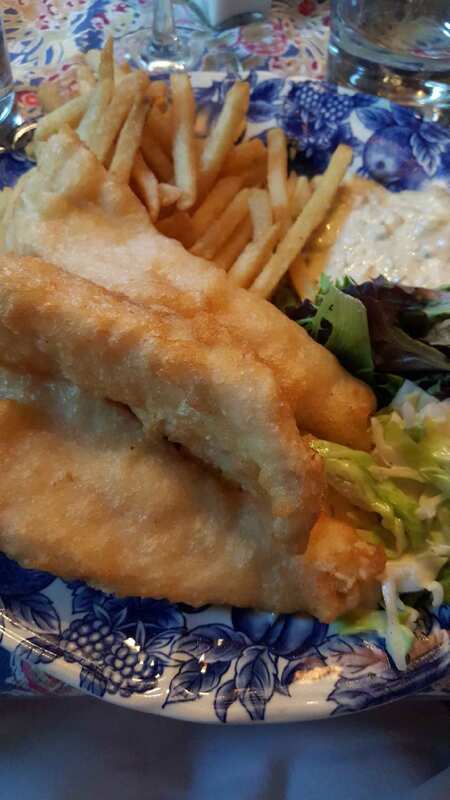 Daria chose the Fish and Chips, baked haddock with lime-cilantro slaw, and fries (made in a dedicated fryer!). She was so happy with this entrée….fried but gluten free! When does this happen in a restaurant? Almost never! We were so full at dessert time that we declined, even though the gluten free offerings sounded incredible. A few hours later, we realized that I had gotten a piece of Tiramisu from Bam Bam Bakery and we found it in the refrigerator! Here we are devouring it! After eating our dessert, Daria and Andy suggested that we go to Roost before leaving for home for their breakfast/brunch. And since it was Daria’s birthday, we couldn’t resist! As we sat down, we all were feeling the same way….we just didn’t want our vacation to come to an end. But once we ordered our breakfast food, we knew it would end on a high note! 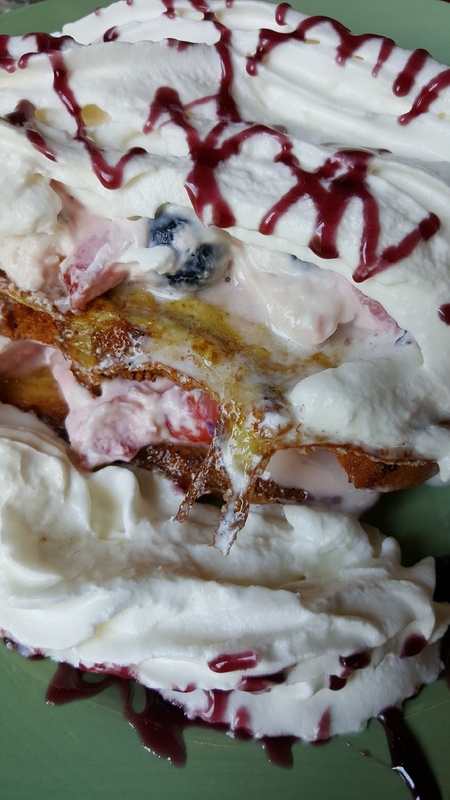 The birthday girl ordered Brioche French Toast stuffed with mascarpone, fresh berries, and whipped cream….just what she wanted! 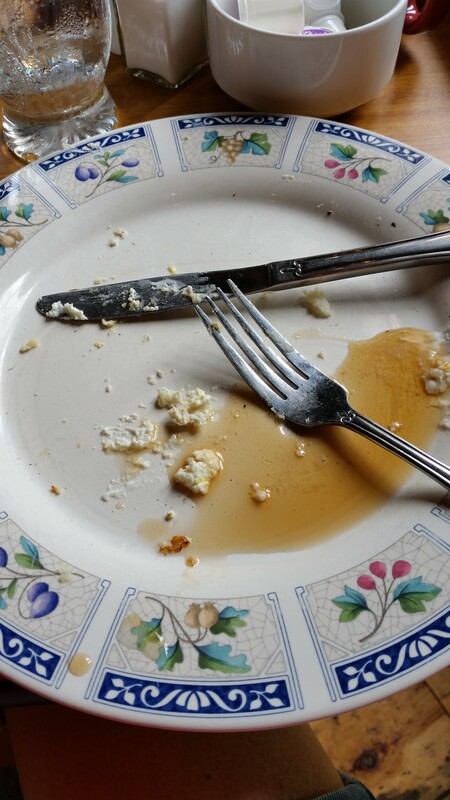 I chose the Lemon Ricotta Pancakes….which were so amazing! 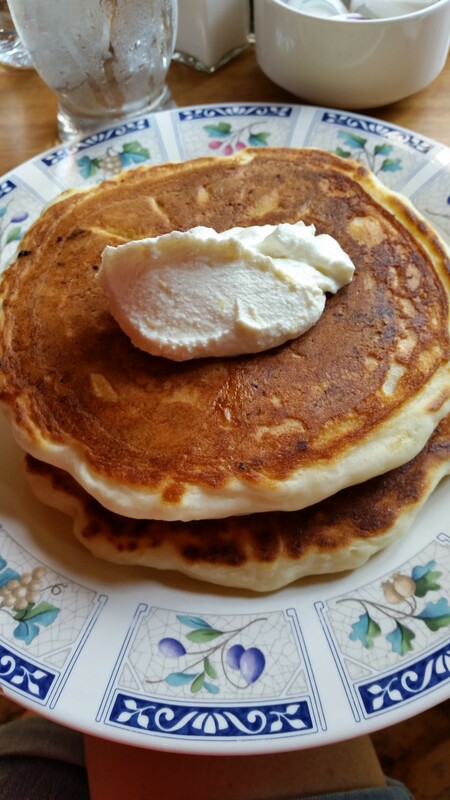 They were the fluffiest gluten free pancakes that I have ever eaten! OmG! Take a look at these beauties! I had a little help, but I would say I did good, yes? 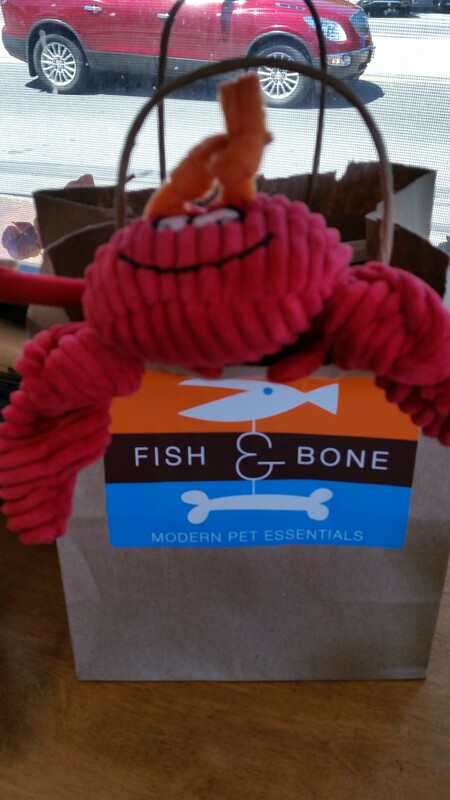 And since our puppy daughter, Molly, wasn’t able to come with us to the beautiful state of Maine, she had to have some lobster, too….okay, it’s not edible, but cute, huh? 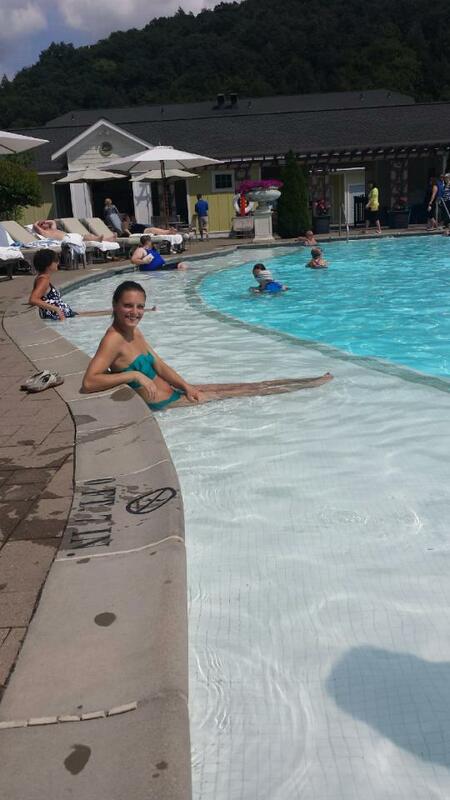 Some day we hope to return to Maine…..such a gorgeous place with some great gluten free food! And next time, we hope to see a moose! But for now, we brought home the next best thing! 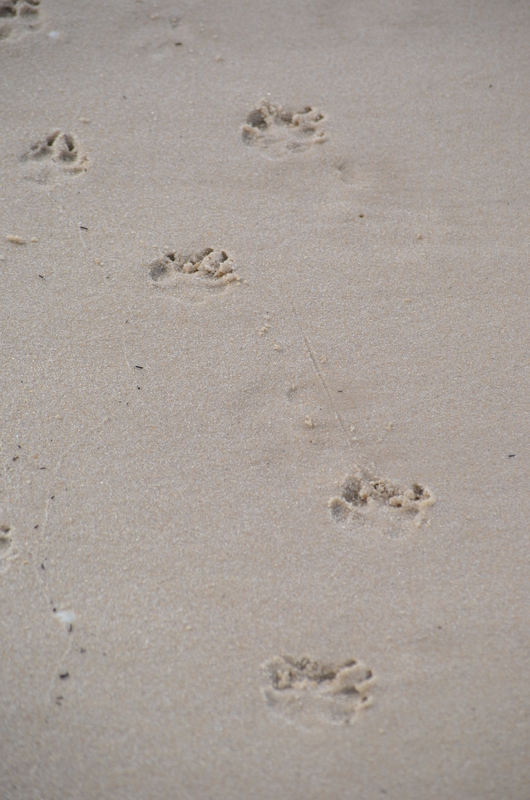 Oh how we LOVE the beach! And if you’ve never visited there in September, you really need to plan a trip! It’s much less crowded; it’s still lovely (weather-wise); it’s more affordable for accommodations! 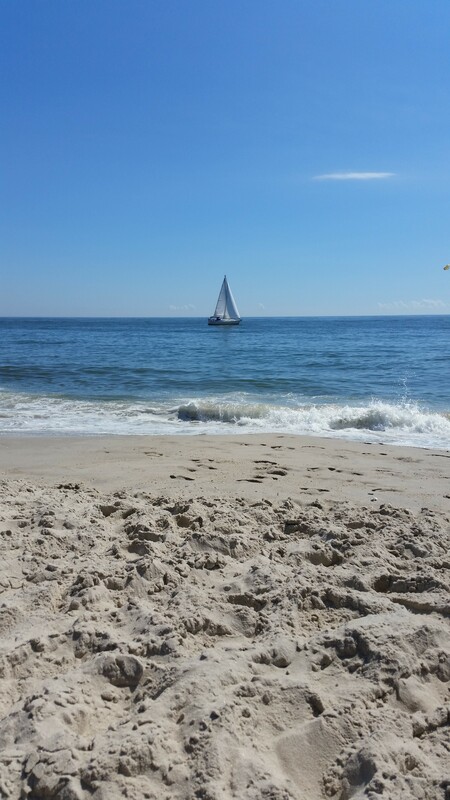 Since we live on the East coast, we have our choice of Maryland, Delaware, New York, and New Jersey beaches. 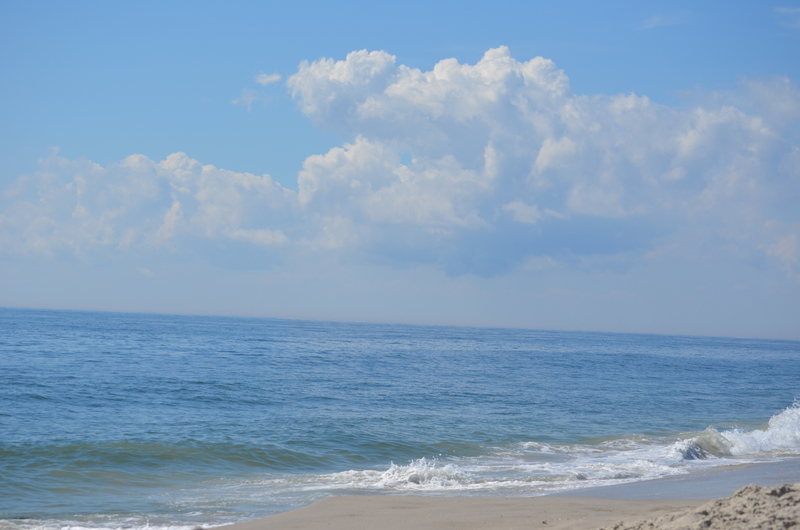 And while all of them are wonderful in their own unique way, somehow we always gravitate to the “Jersey Shore” and our favorite place is Cape May. Yes, all the way down at the southern-most tip…Exit 0. 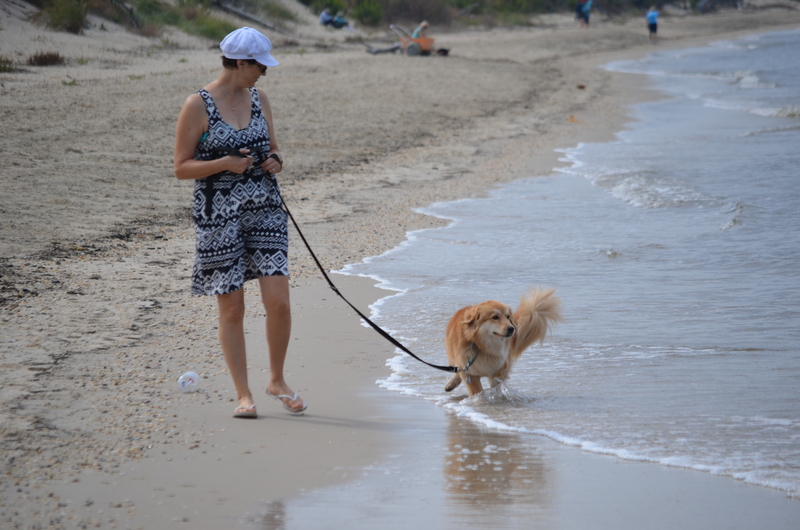 Two Christmas seasons ago, we brought our Golden/Corgi mix puppy daughter, Molly, with us for a quick little getaway to Cape May. She was a great little traveler, but since it was December and very rainy that year, we couldn’t introduce her to the Atlantic Ocean. This time we knew we wanted to include Molly on our trip so we booked a pet-friendly hotel (with a kitchenette for gluten-free goodies from home*) and we were off! *GF goodies included Gluten free Cheerios, Udi’s GF Granola, Gratify GF Pretzels, homemade chicken salad, homemade brown rice salad with scallions, dried cranberries, slivered almonds and broccoli, Gratify GF Everything Baked Bites, Popcorn Indiana Organic Himalayan Pink Salt Popcorn, Schar Honeygrams, fresh blueberries and grapes, and lots of bottled water! Our eating policy when we are on vacation is to try new places each time we visit. We absolutely have favorite eateries, too and sometimes, we just have to go back and enjoy a favorite meal there. Our first stop was the Lobster House for a quick take-out since we were beat from our long ride! We were so tired that I forgot to take a picture of my broiled scallops, lobster, and shrimp with baked potato…oh well! But trust me, it was delicious! 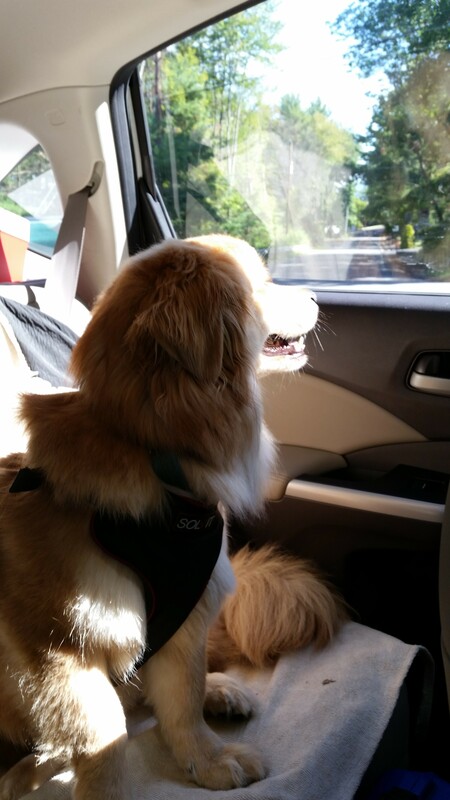 The next morning we were up early and off to let Molly explore pet-friendly Higbee Beach. 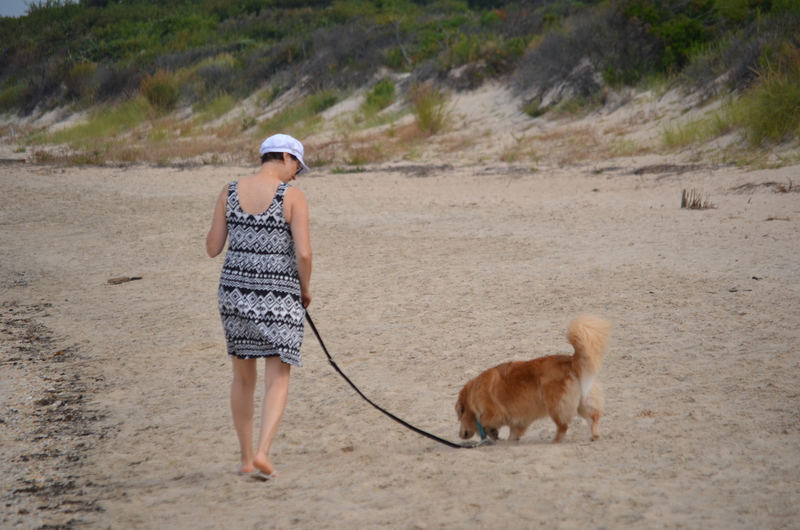 Her tail wagged continuously as we walked the sandy access path to the beach area. Her nose got quite the workout! She sniffed here and there and everywhere! It was so much fun to experience this with my little cutie! She wasn’t too impressed with the water and in fact, couldn’t really be bothered with it! 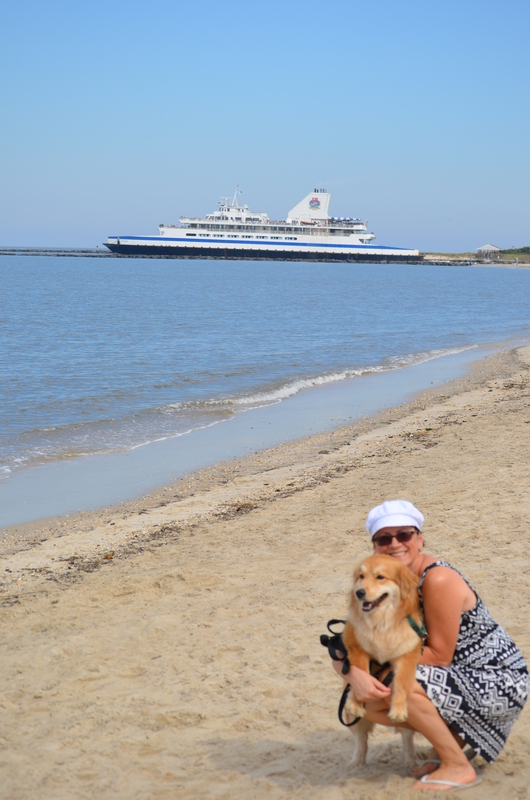 The Cape May – Lewes Ferry behind us in this photo is a car and passenger ferry that crosses the Delaware Bay and connects NJ with Delaware. 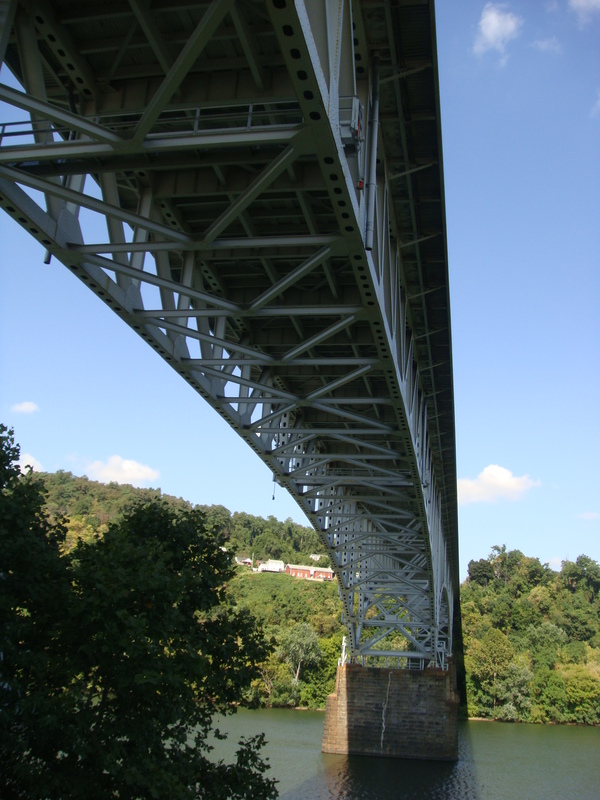 We’ve used this wonderful ferry service and it’s an easy and fun experience! 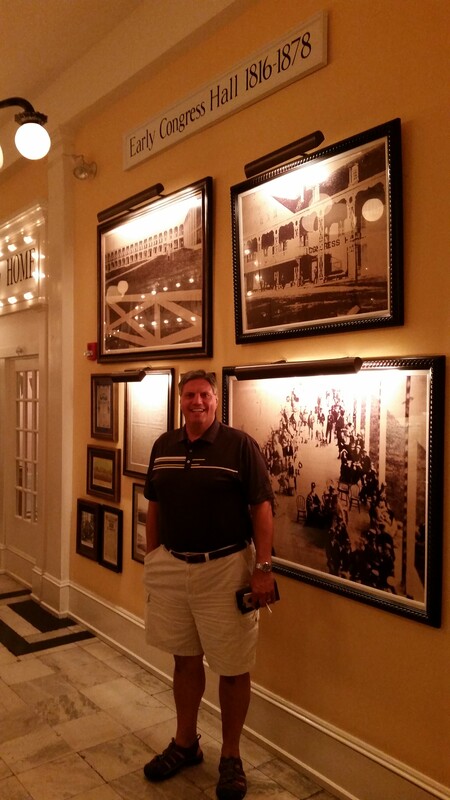 Later in the day, we decided to dine at the Cape May Fish Market which is smack in the center of Washington Square Mall in the historic part of Cape May. Our server, who was familiar with celiac disease (since both of her parents have it! 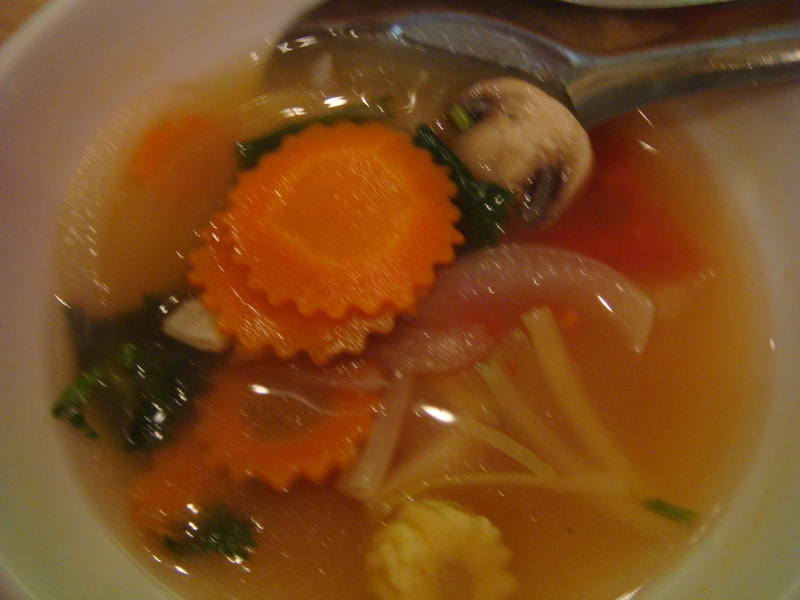 ), explained a few of the menu items that would be gluten-free. 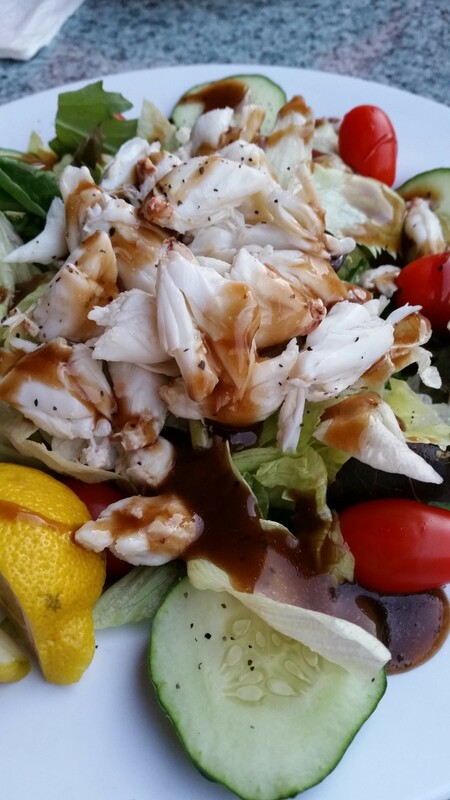 I decided on a fresh salad of iceberg lettuce with mixed greens, cucumbers, and tomatoes with fresh jumbo lump crab meat. So fresh and delightful! Can’t you just taste this??? Spending our days going for long walks with Molly and enjoying the beach, we were really ready for great food at dinnertime. 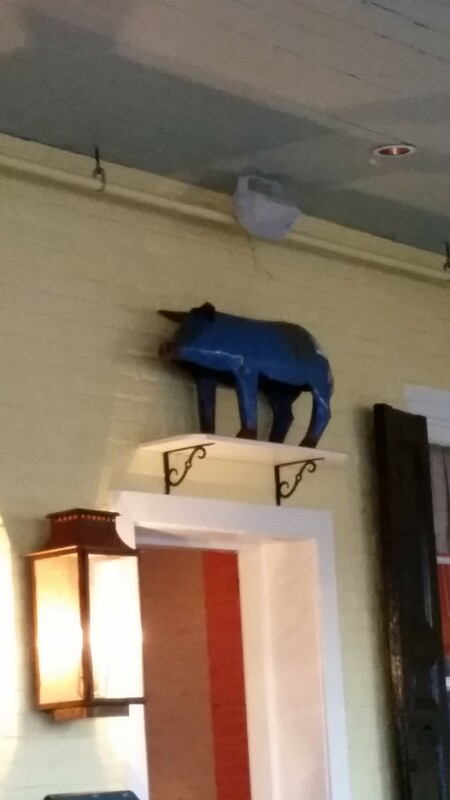 Our new favorite place is The Blue Pig Tavern, which is located within Congress Hall. This amazing place was recommended to us by our darling daughter and my blogging partner, Daria! 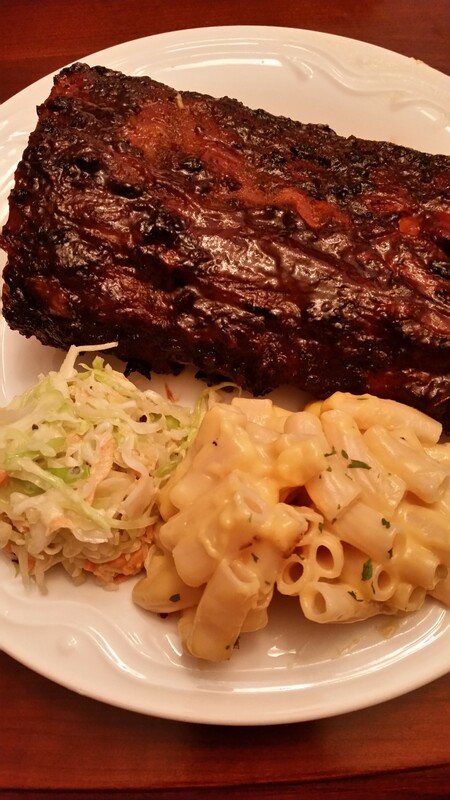 She had eaten there earlier this summer and she raved about it….now we know why! First, let’s talk about ambience. This place has it! 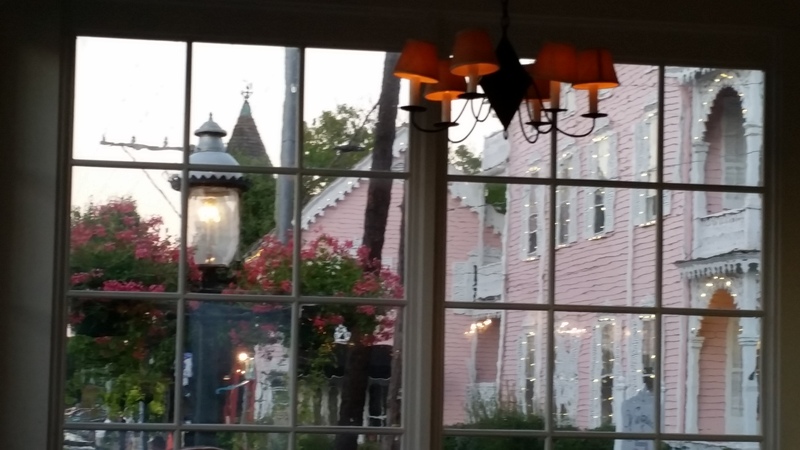 Tucked in the corner of America’s oldest seaside resort, the tavern is just magical. Second, let’s talk about service. Our server was well versed about celiac disease and checked with the kitchen several times to make sure that I was taken care of. 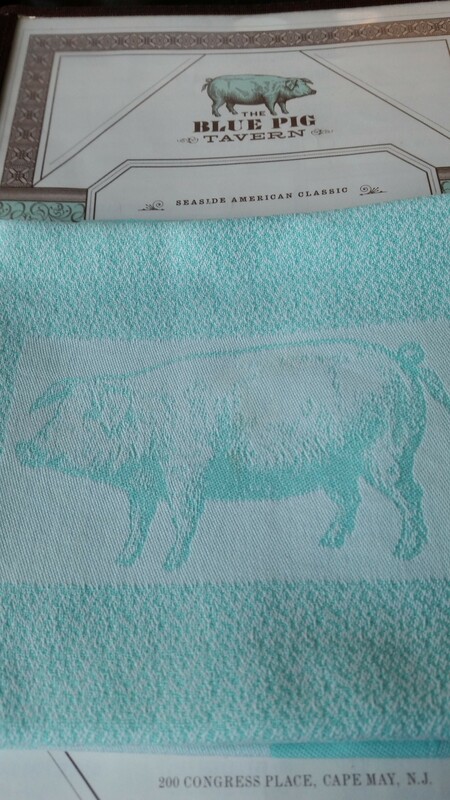 And, how about these adorable napkins? And, of course, my favorite color, too! Third, let’s talk about the food. The Blue Pig Tavern features American comfort food and uses fresh produce, herbs, and eggs from their own farm, Beach Plum Farm, which is two miles from the restaurant. Oh my! Everything was wonderful! 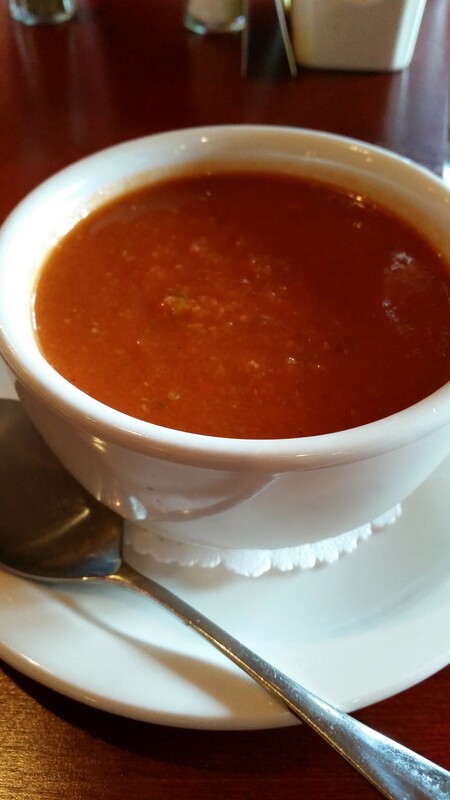 My appetizer was the Beach Plum Farm Gazpacho. 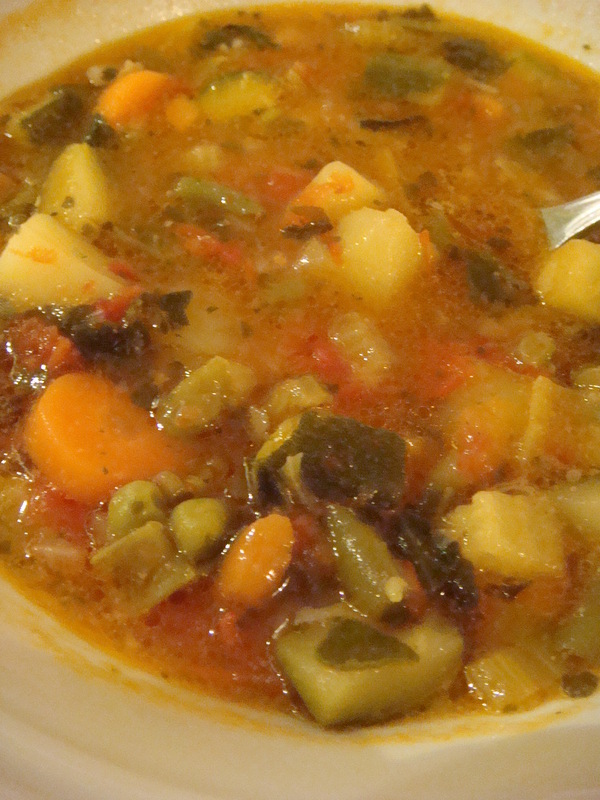 This tangy cold soup featured tomatoes, cucumbers, sweet and hot peppers, garlic, cilantro, and olive oil. 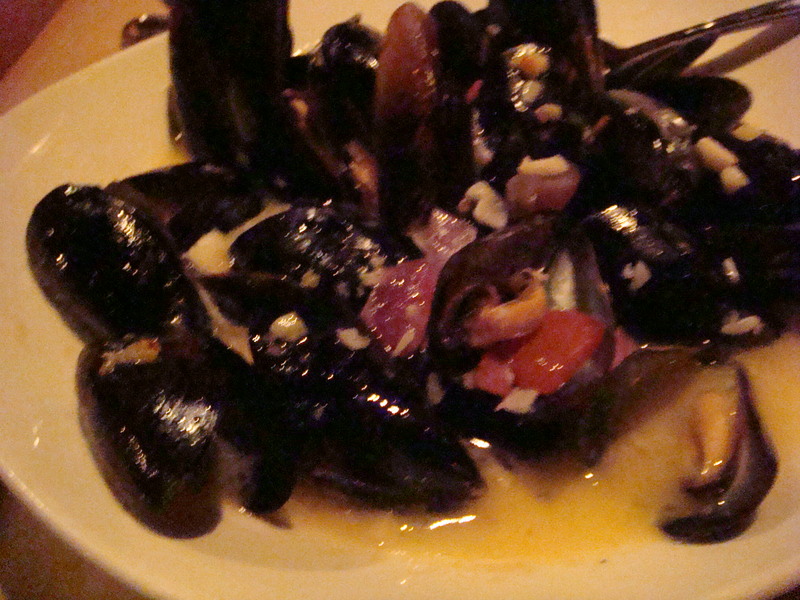 My husband Lewie’s appetizer was PIE (Prince Edward Island) Mussels. 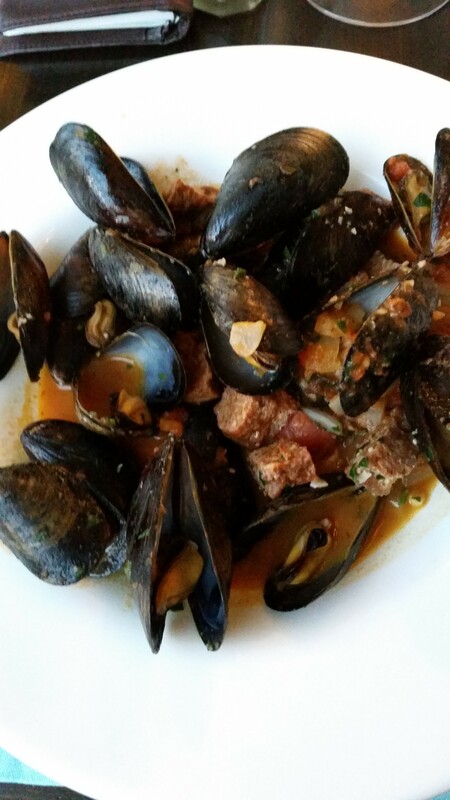 The mussels were accented with spicy chorizo and cilantro, in a spicy tomato broth. These made us so happy! My entrée was a culinary delight! 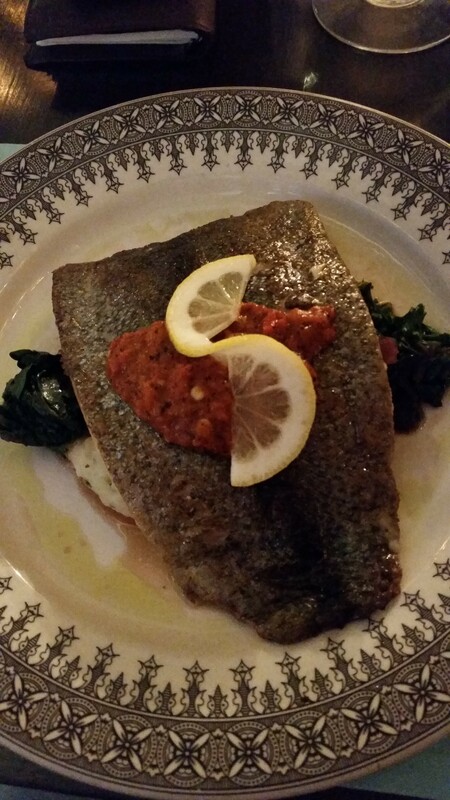 I chose the Seared Rainbow Trout which was served with truffle and chive smashed potatoes, roasted red pepper coulis, and sautéed Swiss chard. Perfectly prepared and perfectly devoured by me! We always try to save a little bit of room for dessert! After all, we raised a pastry chef! We know from personal experience that pastry chefs put their heart and soul into their desserts. Our Daria certainly does! So proud of that girl! 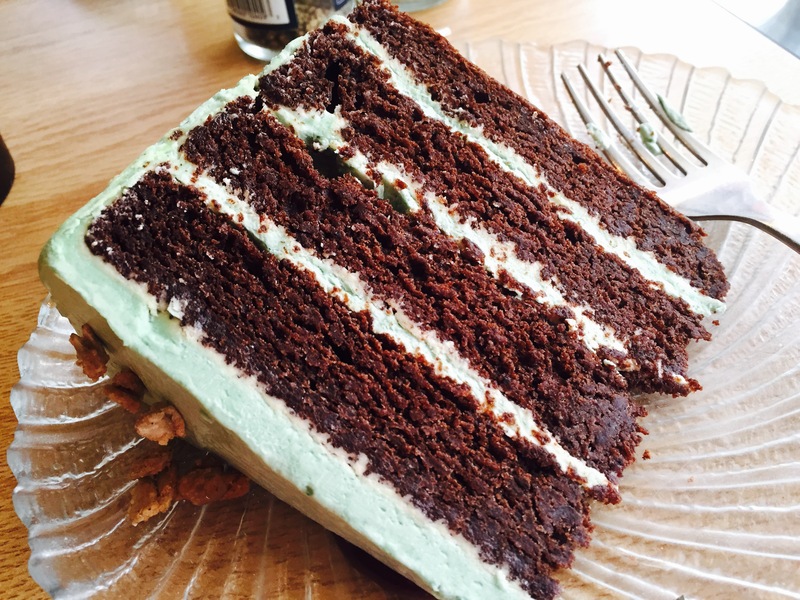 The gluten-free choice at The Blue Pig Tavern was a flourless chocolate cake…so exciting! 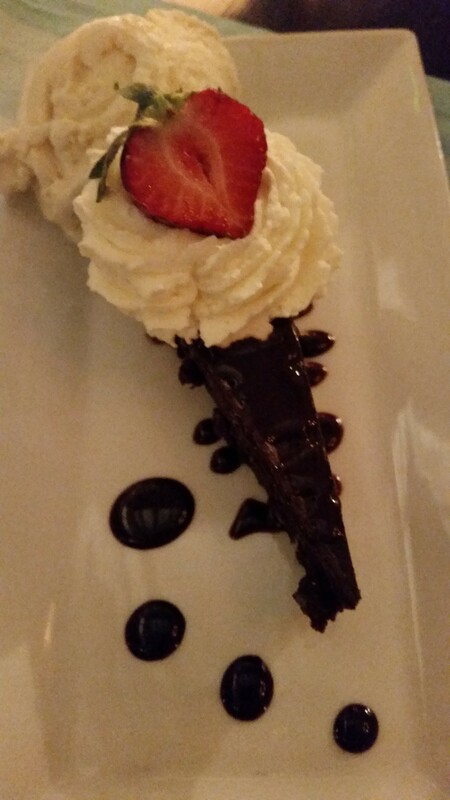 This rich and dense chocolate cake was covered in chocolate ganache and served with vanilla ice cream and whipped cream with a strawberry…so scrumptious! 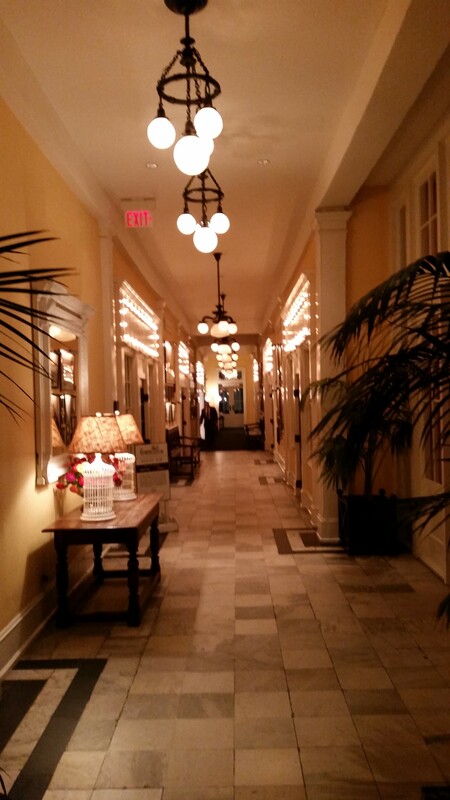 We wandered around Congress Hall a bit after dinner and I was so impressed with this resort. 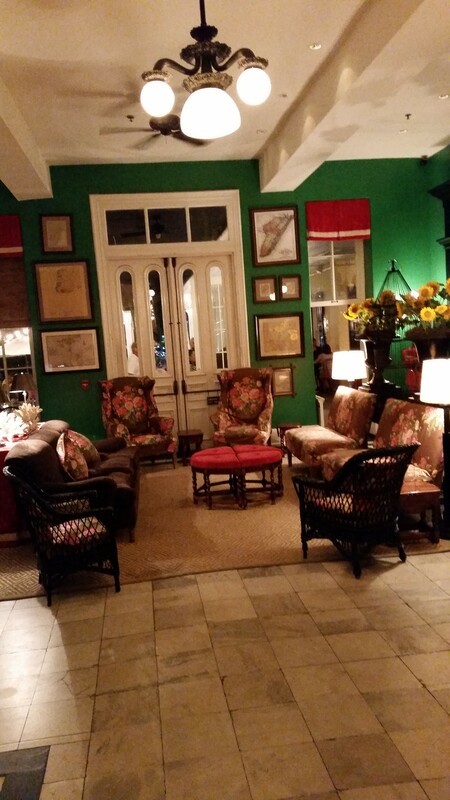 It reminds me of Bedford Springs as both have such rich histories. We are so NOT GOOD at selfies! But we try! Our last beach day had another early beginning and late ending! 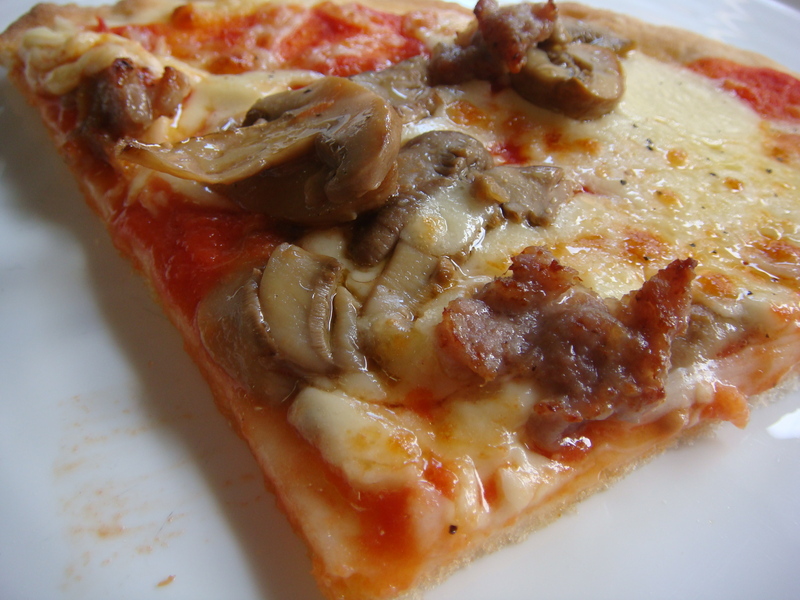 And of course, it had to include something Italian…and it had to be gluten-free pizza! 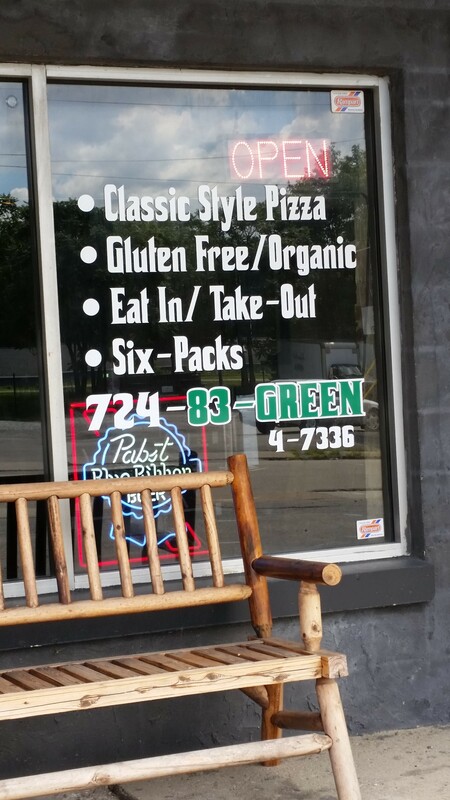 We had noticed a few days prior that Blue Moon Pizza had a sign for “GF Pizza and Wraps” in the window. So we decided to check it out! Please NOTE: the link to Blue Moon does not clarify that they have GF pizza available; don’t know why they don’t publicize this! 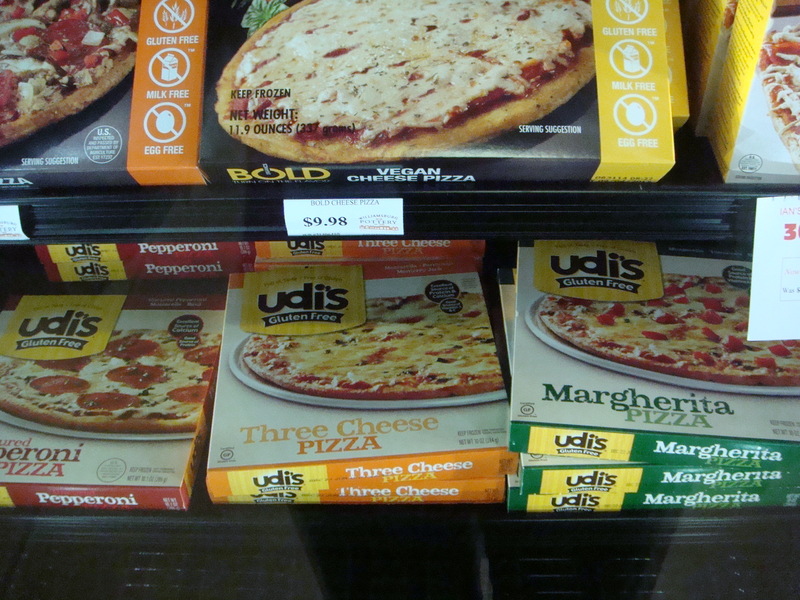 The young man at the counter told me that the GF pizza is made in a dedicated oven with its own utensils and bakeware. 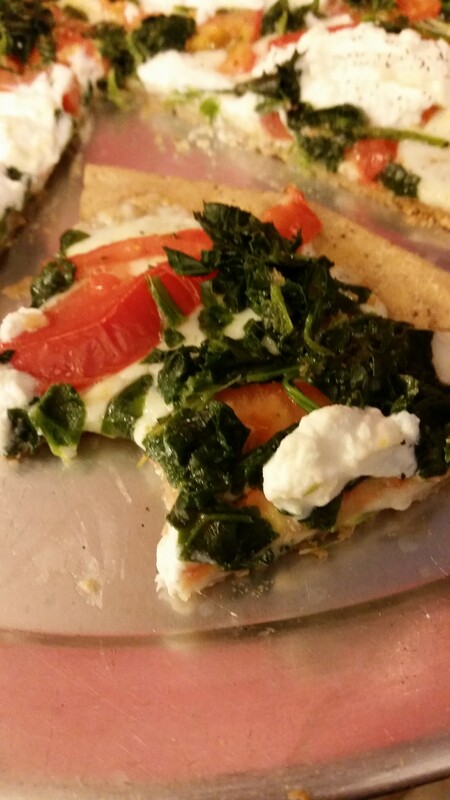 So, I ordered a personal pan-size gluten-free pizza with a crust covered with fresh ricotta, fresh sliced tomatoes, and spinach. 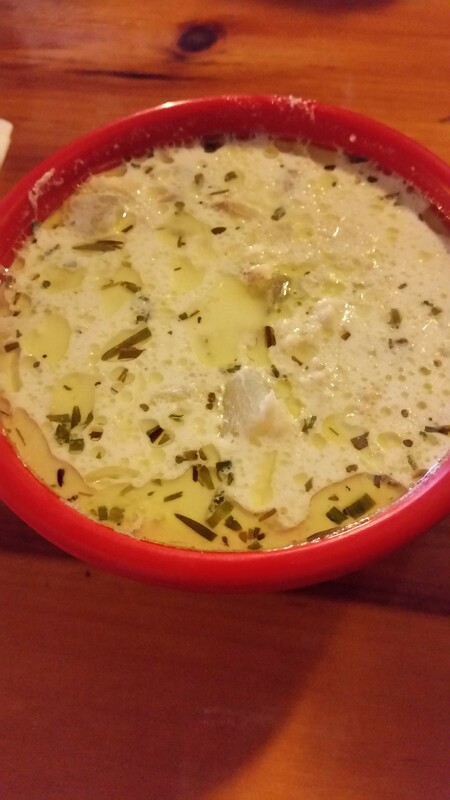 Of course, mozzarella, garlic, and olive oil rounded out the taste! It was so tasty and mouthwatering! My husband ate his meatball hoagie and helped me finish the pizza! Yum! Our last day was Sunday and after early Mass, we went to one of our favorite places in West Cape May that we discovered several years ago. It’s a small café that seems to expand every year. 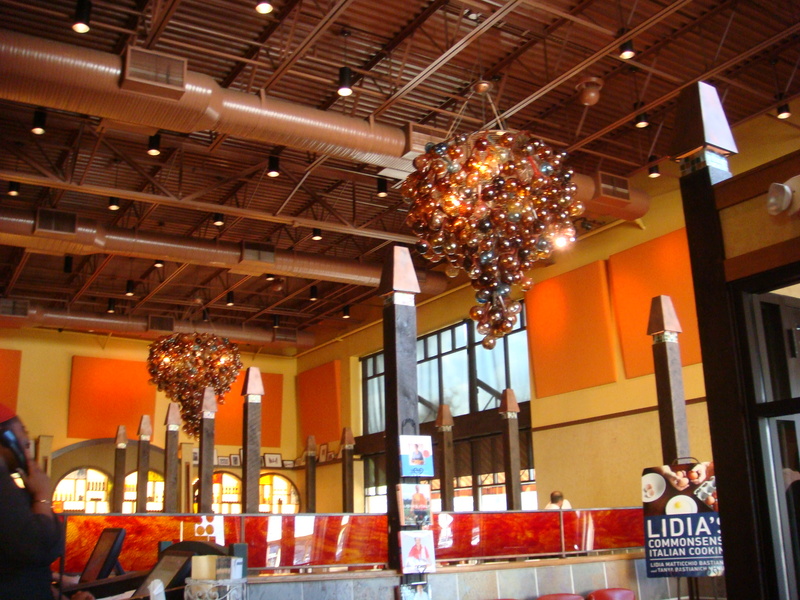 Bella Vida, which means “Beautiful Life” offers many vegetarian, vegan, and gluten-free options. Please NOTE: If you click on the MENU tab from the link above and then click on Vegetarian/Gluten Free you will see a pdf that talks about these options. They DO explain that they do NOT have a gluten free kitchen. They stress that it is very important you let your server know the extent of your allergy. Here is my “million calorie” breakfast that lasted me most of the day! I usually wake up starving and I can only tell you that this really hit the spot! 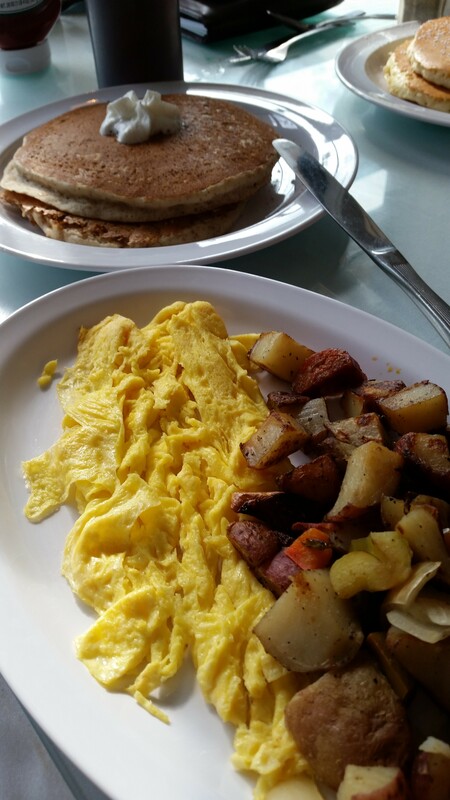 I ordered the Double Header which featured two eggs, two gluten-free pancakes, and homefries with peppers and onions. And, I had to have a cup of caffeine free Lively Lemon tea! Doesn’t it look so appealing? You should have tasted it! Wow! 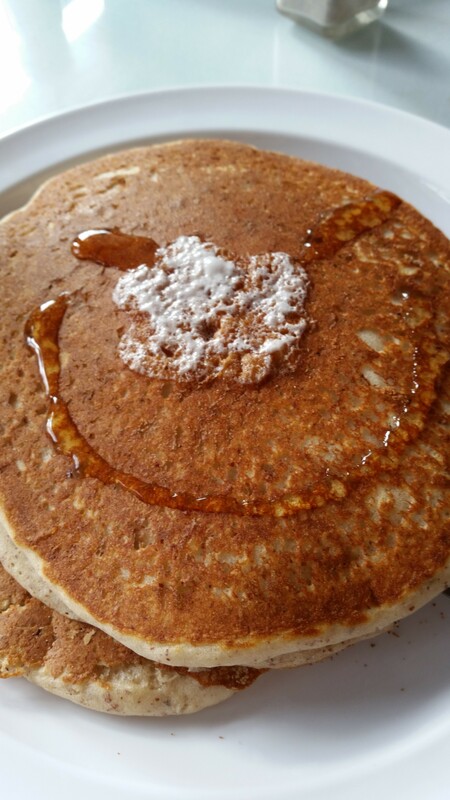 My pancakes look so happy, don’t they? They were so fluffy…I need to know the secret to the fluffiness! 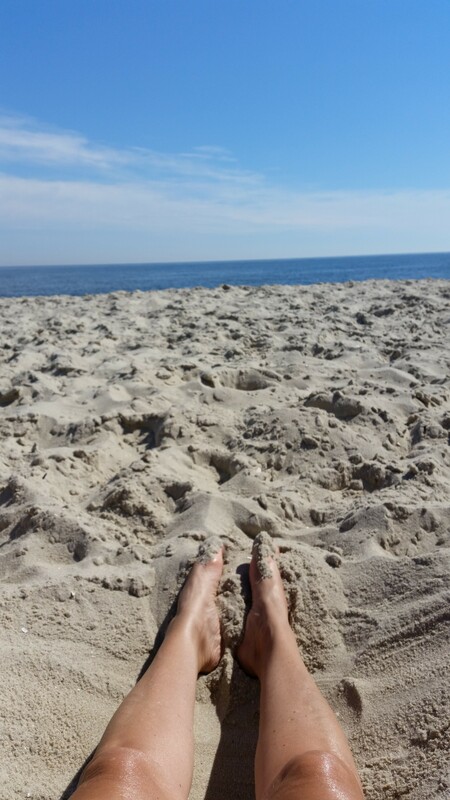 So sad to say goodbye to the Jersey shore…one of my favorite places on earth! 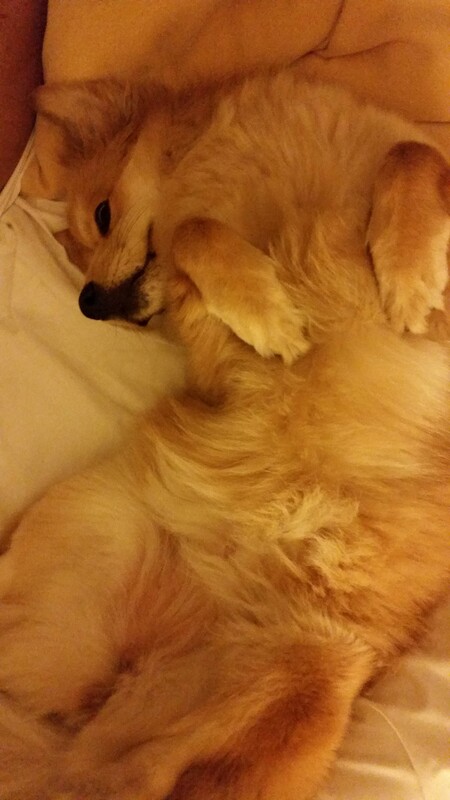 Needless to say, Molly really enjoyed her “vacay” and had a relaxing time! 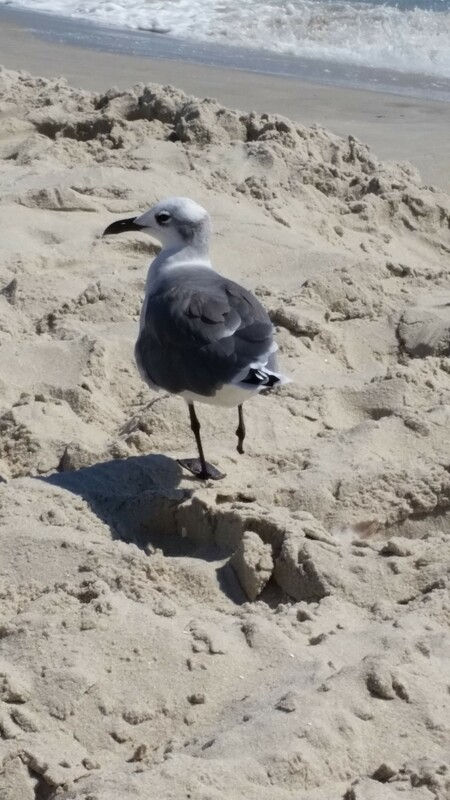 Special goodbye to this little guy who lost his foot but had so much spirit! Oh how we love the end of July! 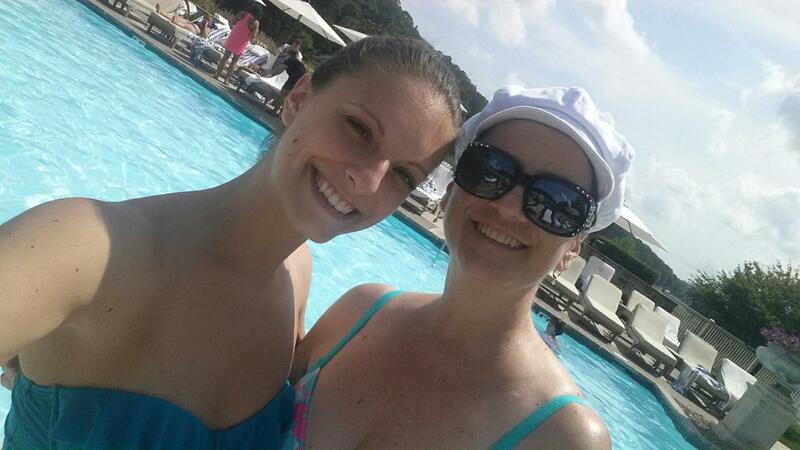 Well, maybe two words…Bedford Springs! Lewie (hubby and daddy) always attends a conference here and he is so nice to invite us to tag along! 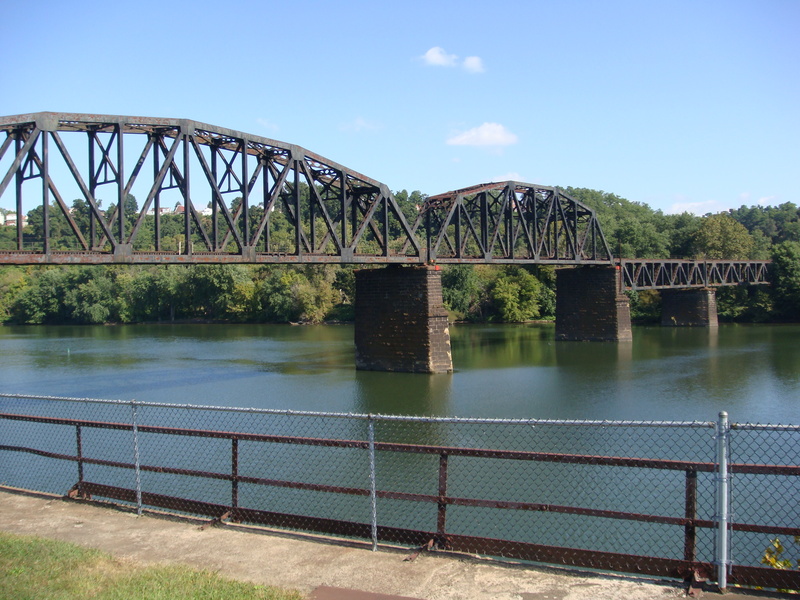 He is busy during the day with meeting people from around the state of Pennsylvania, and we busy ourselves with leisure activities…..swimming, reading, antiquing, etc. Is it any wonder that we look forward to this conference??? This year we couldn’t have asked for any better weather, either. The days were hot and sunny and even though I, (Monica), am not into tanning, reading under the umbrella and sipping something yummy was simply delightful! Daria gets enough sun for both of us!! 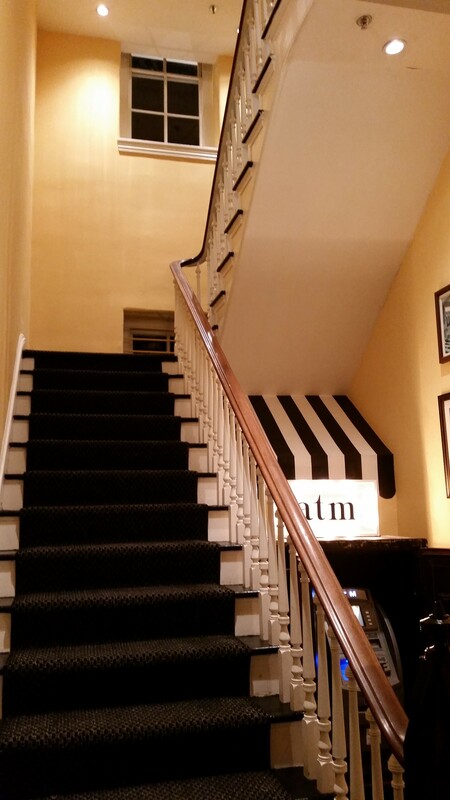 Even though this is the fifth year that we’ve accompanied Lewie to Bedford Springs and have gotten to know the area quite well, we always look online for any new restaurants (before we leave) that may have opened since our last visit. And to our surprise, we usually find something! 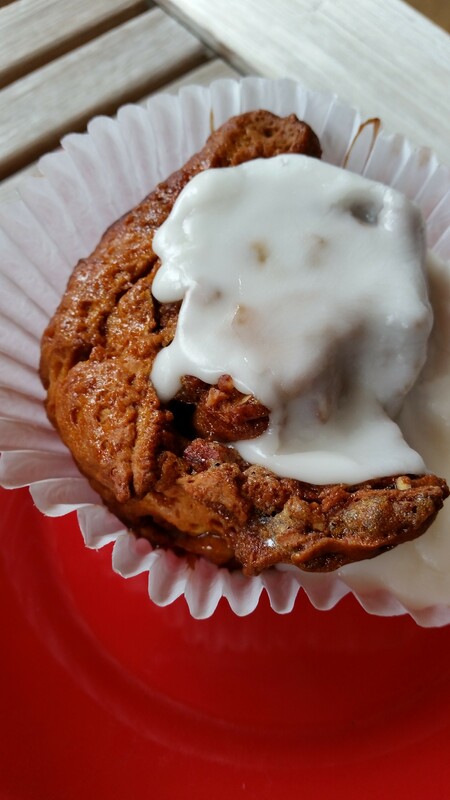 This year we investigated via findmeglutenfree.com and were not disappointed! What a great resource for people who need to eat gluten-free! This web site offers the user an insight into gluten-free friendly businesses in cities around the United States and even some cities in Canada! You can go online from your computer or download the free app to your cell so that you are connected wherever you go! For those places that we had eaten at in previous years and wanted to dine there again, we made a reservation using Open Table. For the new places, we stored the information (address, phone, hours and days of operation) in a memo on our cell and were we happy we did! This info was right at our fingertips when making inquiries and reservations when we arrived. We didn’t have to take any extra time to look anything up a second or third time! What a timesaver! Here are our new favorite places! Our dinner at Eat2Live Bistro was perfection! 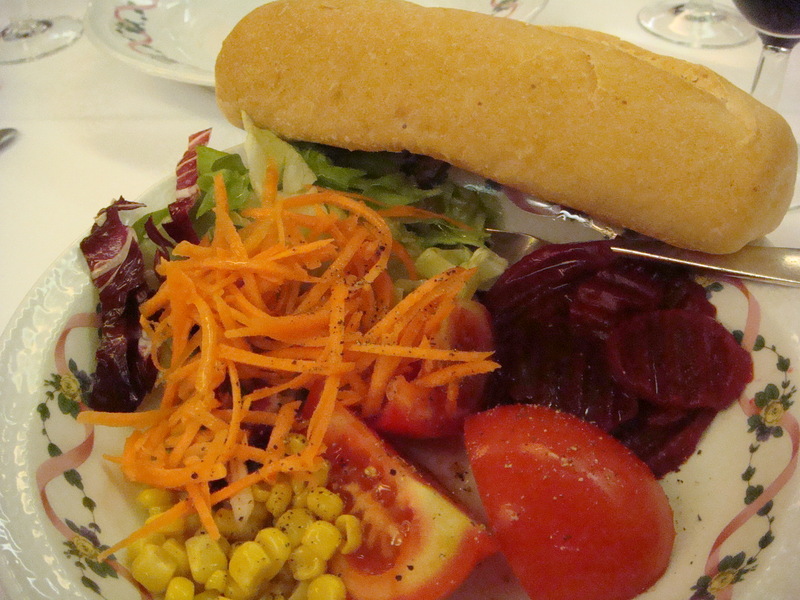 This wonderful little place in New Paris, is a dream come true for gluten-free diners! 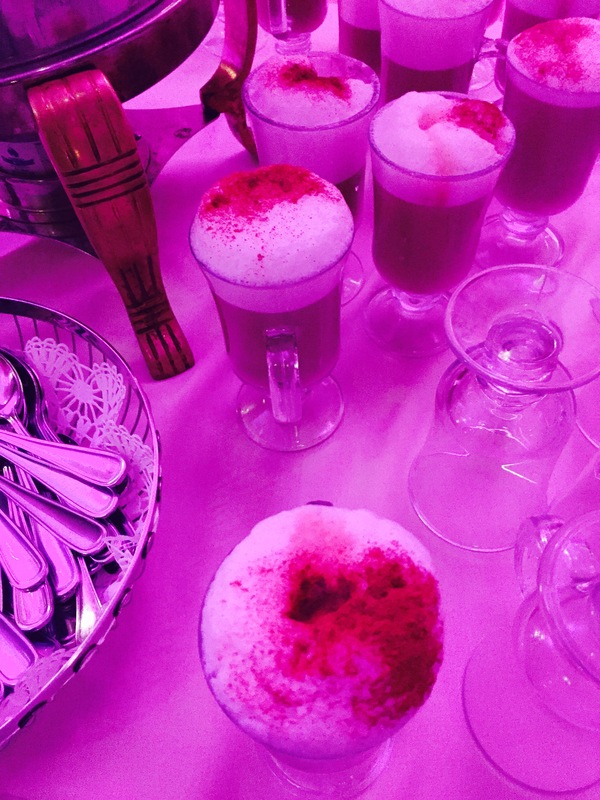 From soup to dessert(s)…we enjoyed every second! 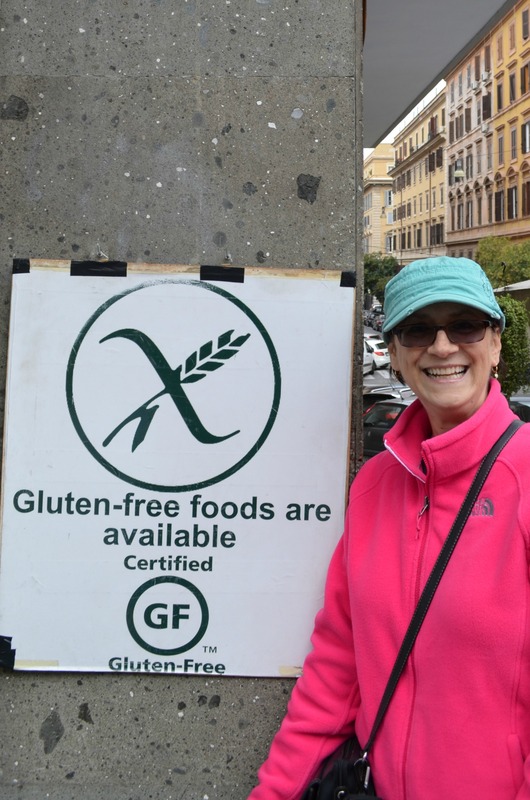 Our server Tina was so friendly and knowledgeable about eating gluten-free; she truly added to our dining experience! 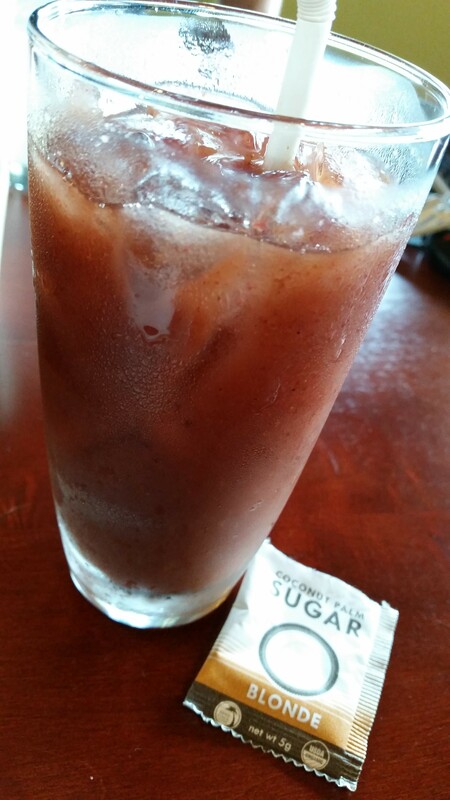 We started off with fresh blackberry infused water….Daria chose to add some coconut palm sugar to sweeten it a bit! Then we looked over the extensive menu! Daria enjoyed the chilled Gazpacho which consisted of local tomatoes, peppers, onions, cucumbers, and watermelon…so refreshing! 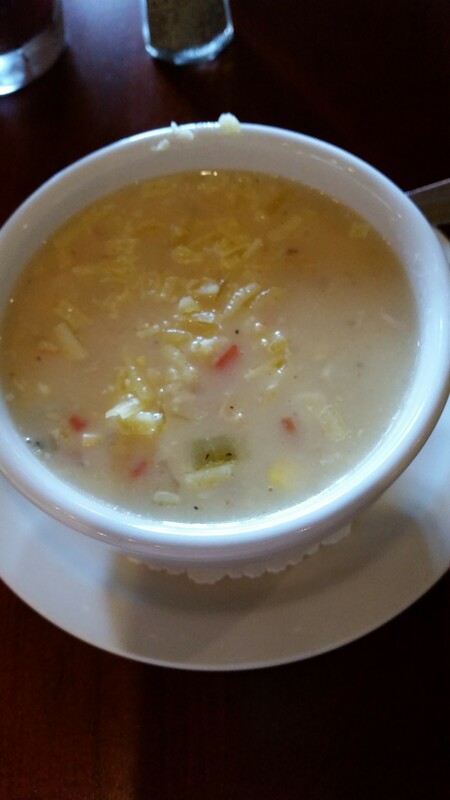 Monica and Lewie had the Roasted Corn and Red Pepper Chowder which boasted creamy, roasted sweet corn and red bell peppers with potatoes and nitrate-free bacon! Amazing! We each ordered a different entrée and had so much fun tasting each other’s. That’s what families do! 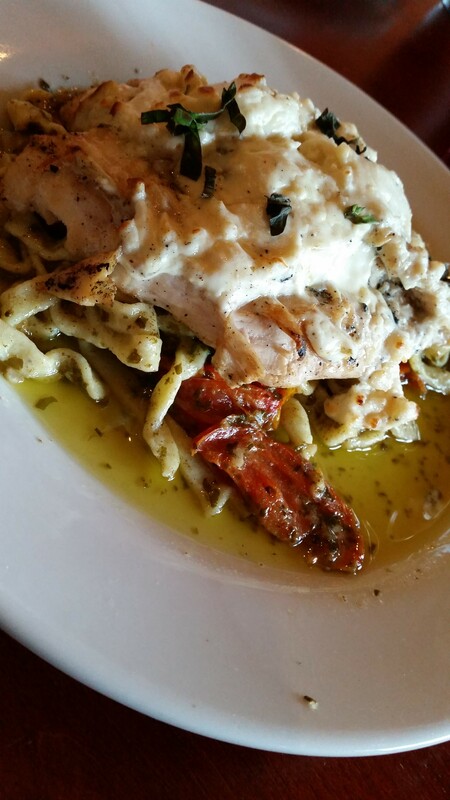 Daria had the Chicken ‘n Pesto which featured seasoned, grilled chicken breast topped with a roasted garlic and herb feta. It was served over house made quinoa pasta tossed with marinated local tomatoes and butter pesto sauce. Look at that quinoa pasta! Monica chose the Roasted Pineapple Pork Chop. 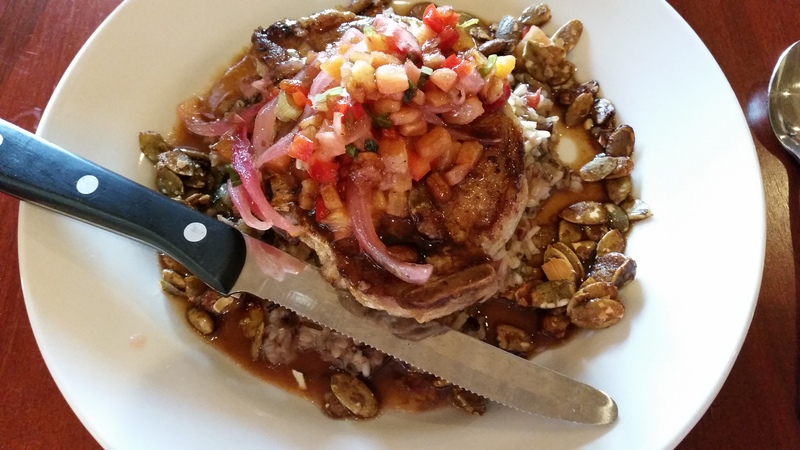 This local pasture raised pork chop was topped with roasted pineapple salsa and served over a creamy mushroom wild rice risotto. Lewie decided on the Trout Almondine (a local spring water fed trout, of course) which was presented on a creamy mushroom wild rice risotto, with seasonal veggies and toasted almond butter. Tina’s suggestions were spot-on and we were delighted to have found such a great eatery. 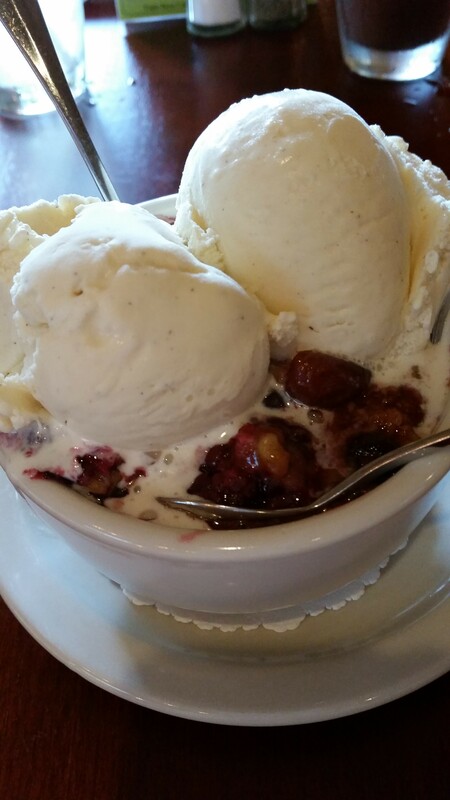 We were so full after our dinners, but managed to share the Three-Berry Cobbler with house made ice cream….gluten-free of course! 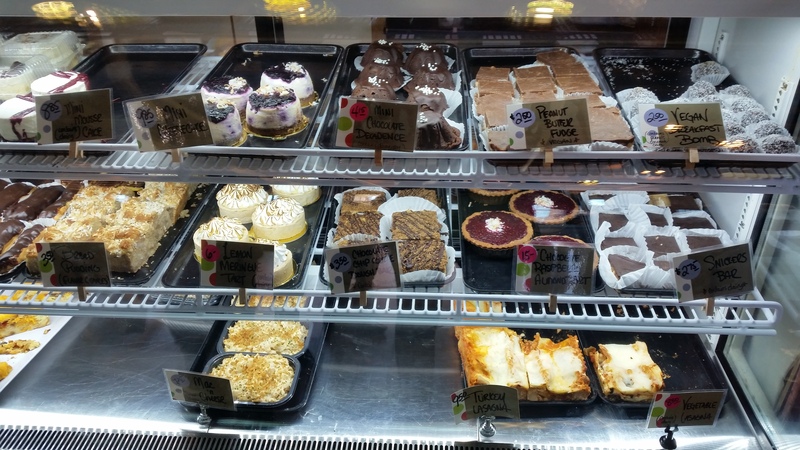 Since we rarely ever find an establishment that has ALL gluten-free desserts, we decided to take home the other selections….it’s so nice to have a refrigerator in the hotel room! 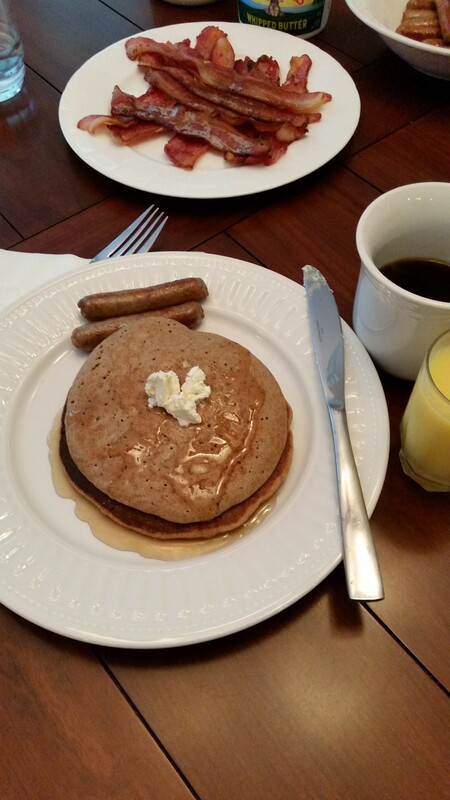 And when you are on vacation…dessert is breakfast! 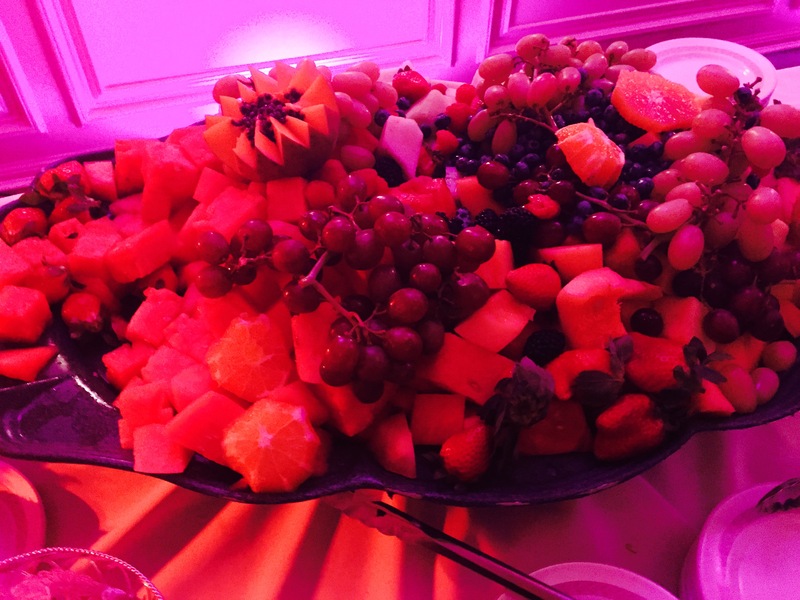 So here are the other desserts…. 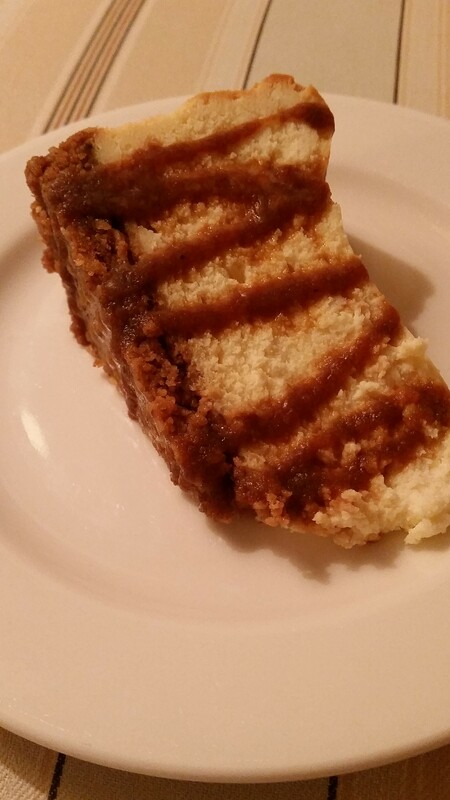 A delicious Cheesecake….so creamy on an oatmeal walnut crust…we chose the caramel drizzle! 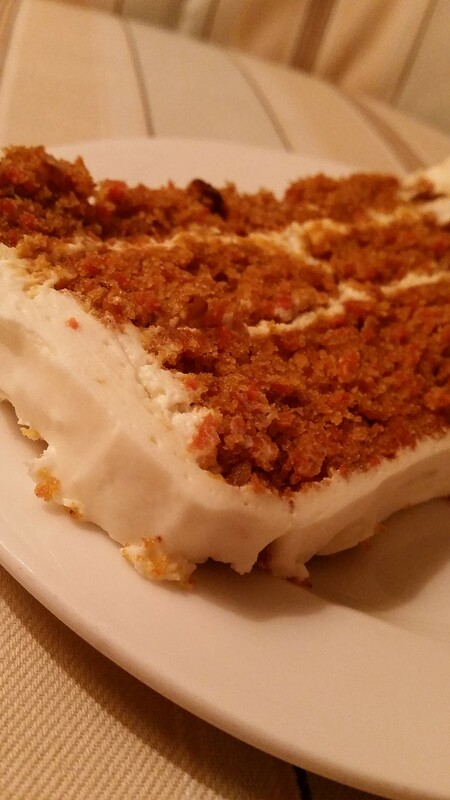 Spring Carrot Cake…moist and delicious with cinnamon and walnuts, this cake had a house made lemon cream cheese frosting! Yum! 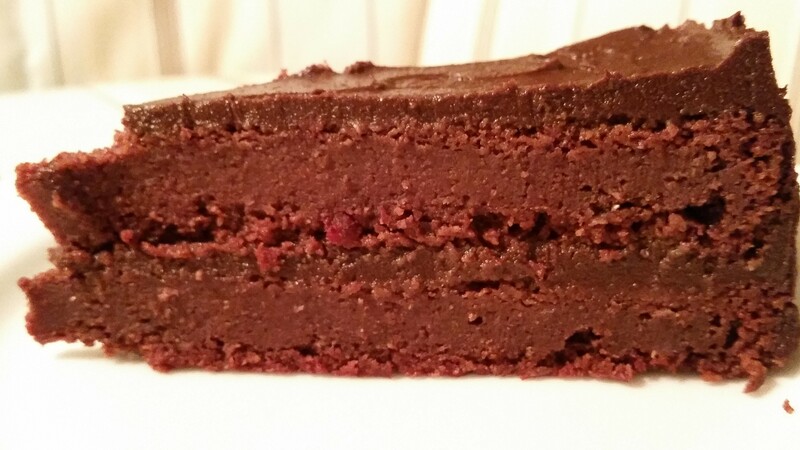 Chocolate Truffle Cake…a decadent two-layer cacao (dark chocolate) beet cake with cacao avocado truffle icing. Just the right amount of sweetness and definitely chocolatey! We ended the evening with some sangria on the porch of the Bedford Springs Omni just chatting and reminiscing about vacationing together! Lunch at the Bedford Springs Omni was great, too! 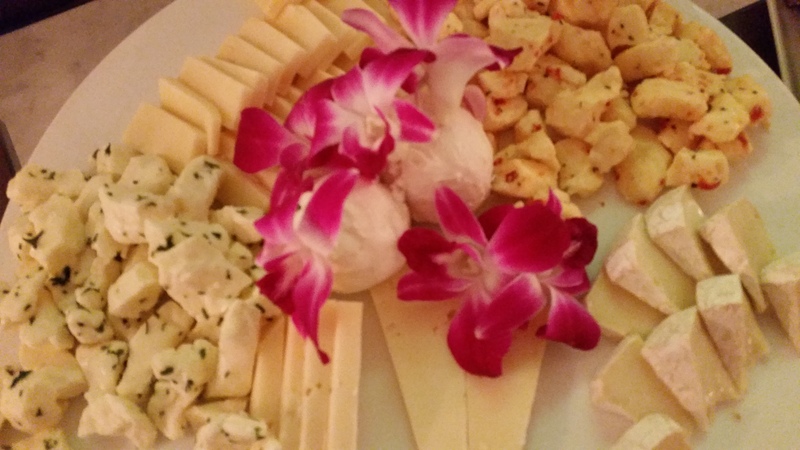 Cheese plates, fruit plates to start! A gluten-free Rachel sandwich (which is a variation on a Reuben) with turkey, and coleslaw along with some gluten-free veggie pizza hit the spot! 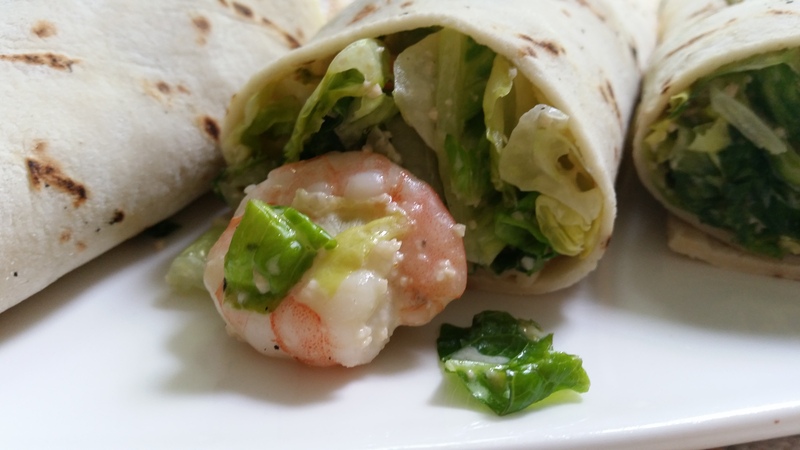 And here are some gluten-free shrimp rolls that were so good! 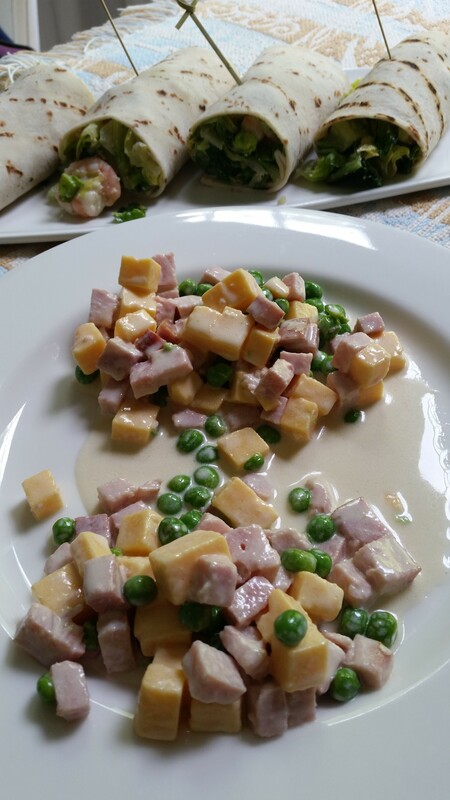 The rolls were accompanied by a ham, cheese, and pea salad that is a local favorite. Not one of ours though…sorry! 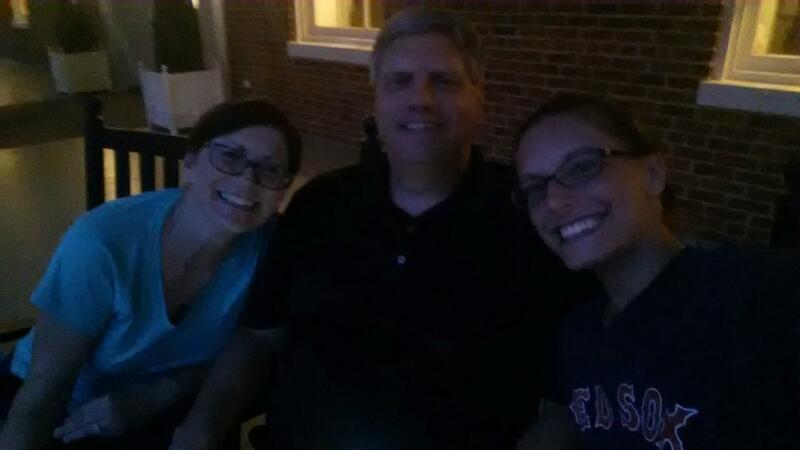 SO happy that we were able to spend a little time together! 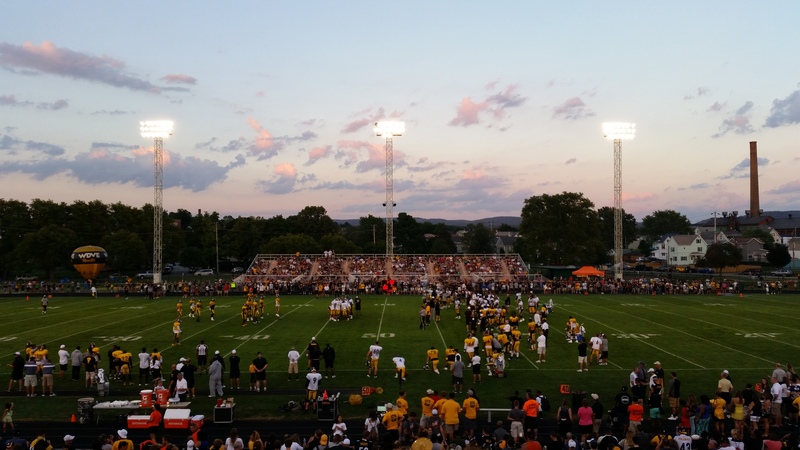 While Daria couldn’t continue on the way with us to Greensburg to attend the Pittsburgh Steelers Training Camp, we really wish she could have, because she missed some GREAT gluten-free food! On the evening of our first day there, we found a great little place called Noviello’s Sunset Café. What a fabulous Italian restaurant! As soon as we walked in and smelled the Italian sauce, we knew we were in for a treat! Since most Italian restaurants serve bread and dipping oil immediately upon ordering, I was so happy when our waiter brought me this little veggie plate! He even apologized that they didn’t have any gluten-free bread and hoped that this would make up for it! 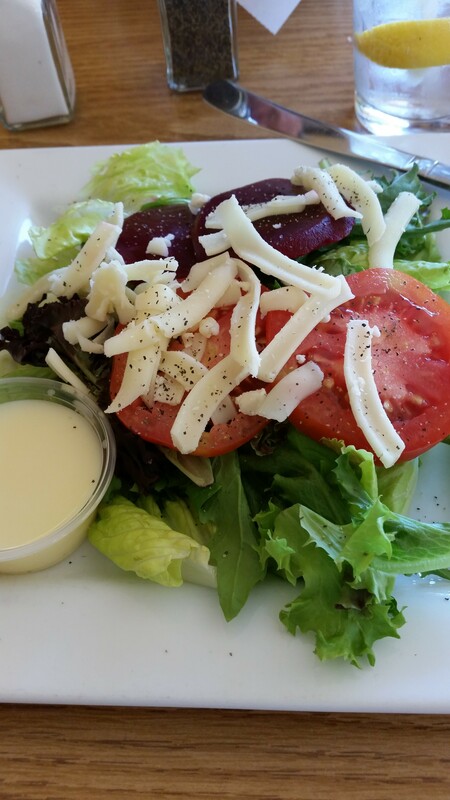 The house salad featured red beets, fresh grated mozzarella, and a house dressing that was a white wine concoction. Very good! 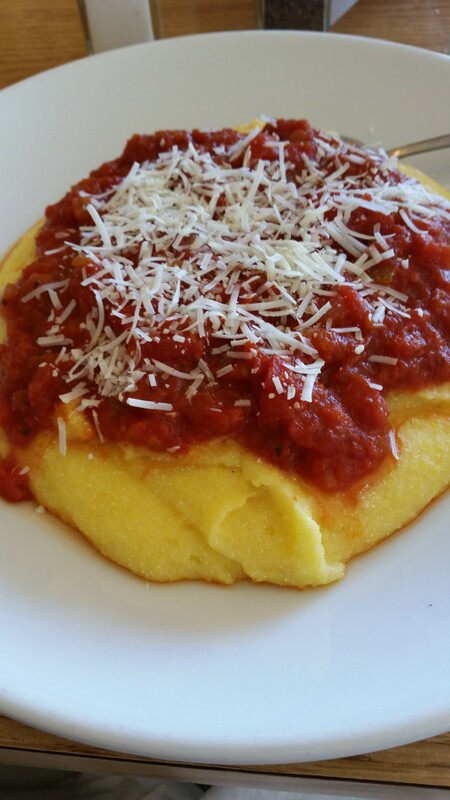 I ordered the polenta with marinara sauce and it may have been the fluffiest polenta I ever ate! It seriously melted in my mouth! Add your grated cheese and that’s it! 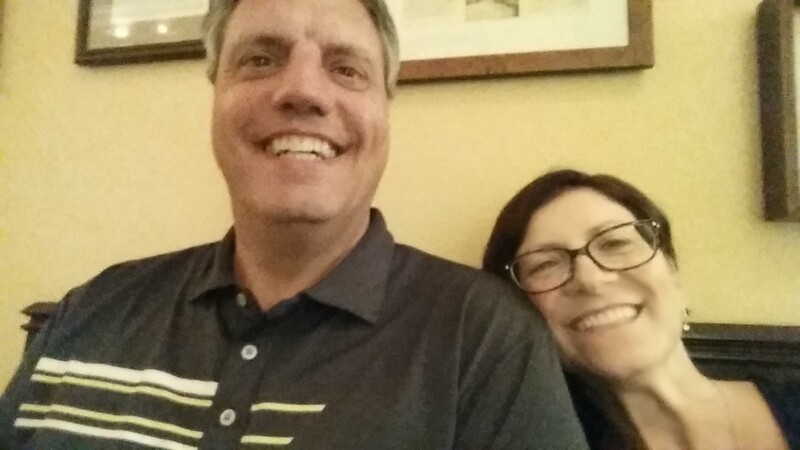 While we were eating the evening before at Noviello’s a gentleman at the next table was talking about being gluten-free….well, one thing led to another and he suggested a pizza place for me to try! Before we went to the Steelers’ Friday Night Lights practice in LaTrobe, we found Little E’s Pizzeria…and my day was made! I had to take a picture of the window….so exciting! Organic and gluten-free selections were so numerous I couldn’t even believe it! 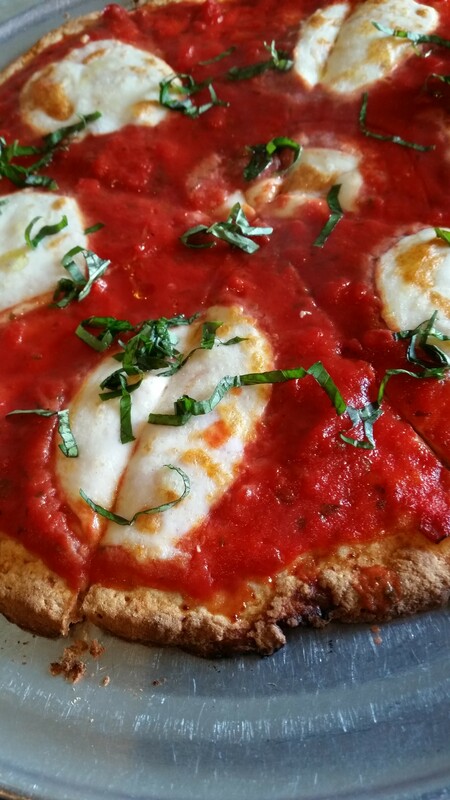 I settled on a Margherita pizza with red pizza sauce, fresh mozzarella, drizzled with extra virgin oil and fresh basil. 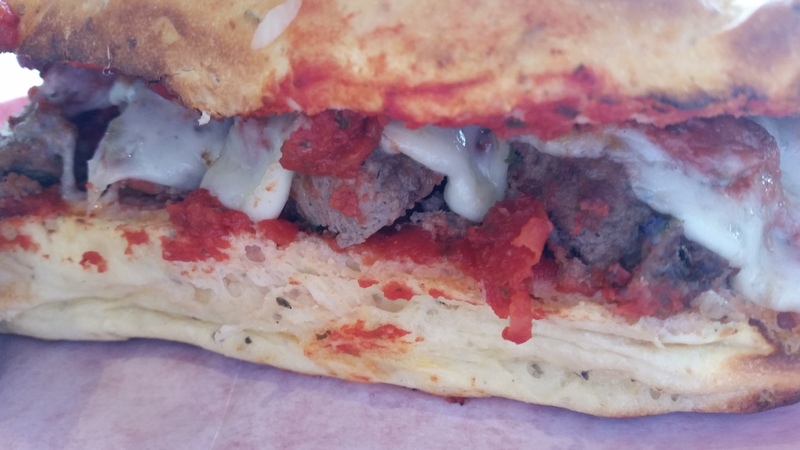 Lewie decided on a gluten-free meatball hoagie that was made with homemade grass-fed Texas Longhorn meatballs, provolone cheese and red sauce. We were so shocked and delighted that the meatballs were gluten-free!! While we waited for our selections to be made, we had some Woodchuck Amber on tap….the flavor was so much crisper than the bottled! 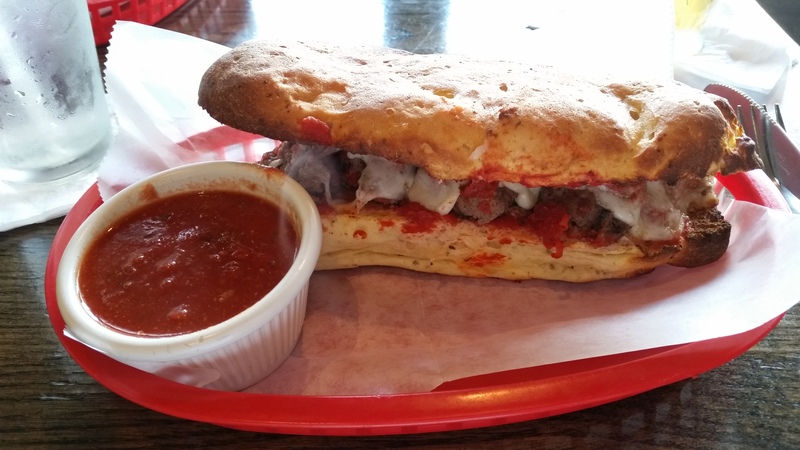 The meatball hoagie came out first…two huge pieces and with extra dipping sauce! 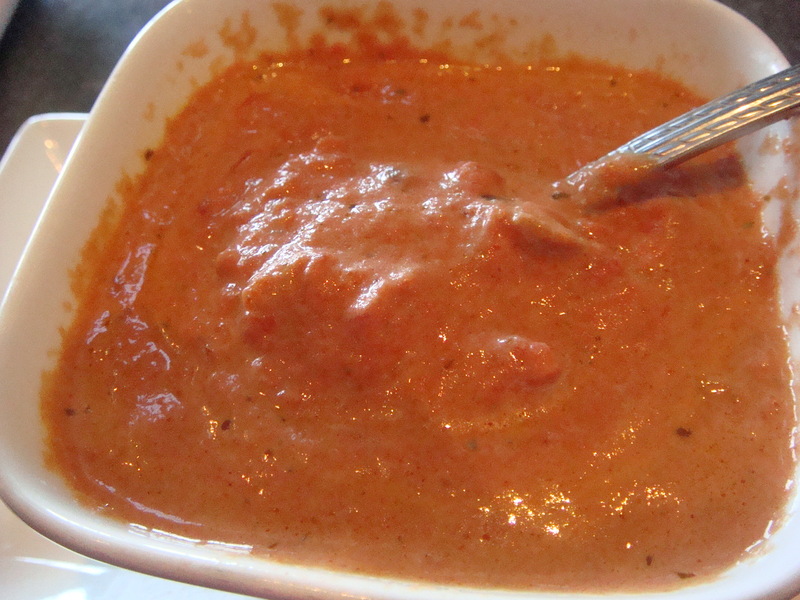 Can you see the steam from the sauce? 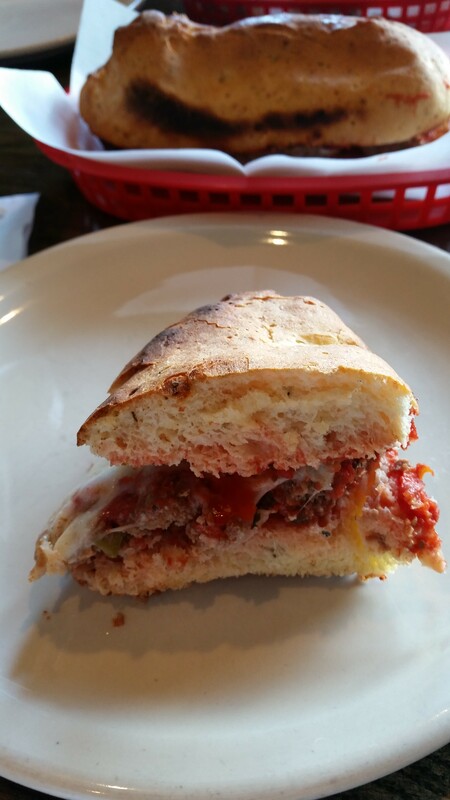 Such great flavor in the meatballs and the bread…oh, the bread! The crust was herbed and so incredible! I wondered if the pizza crust and the hoagie bread were made on site. So I asked! we will be looking into their products! 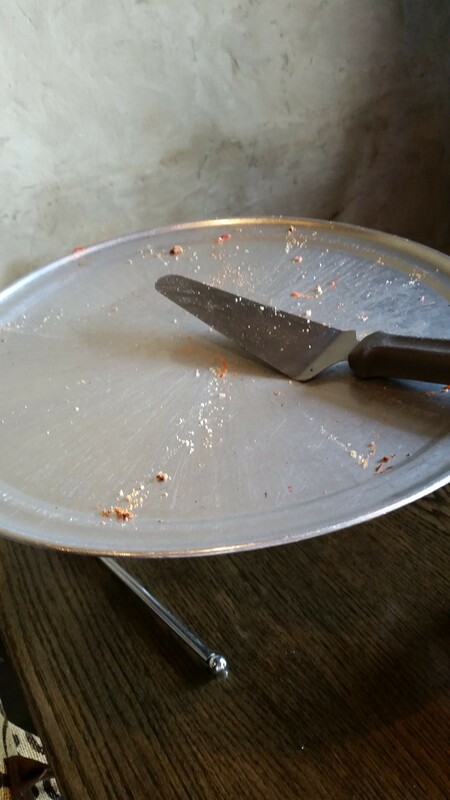 Do you think we enjoyed our pizza? 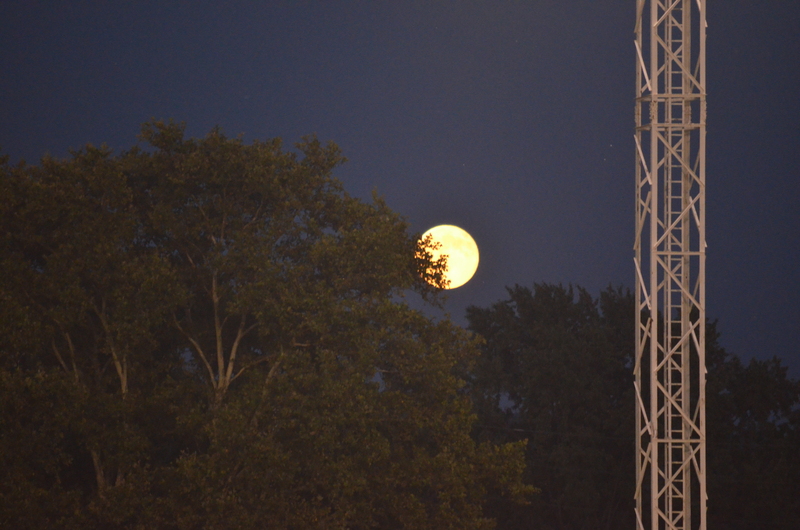 Our evening ended with Lewie seeing his favorite Pittsburgh Steelers and a beautiful “blue” moon to boot! 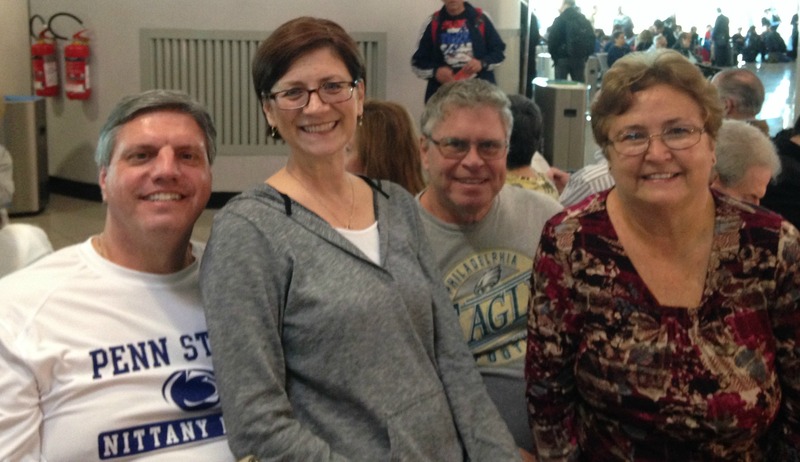 A great trip and tons of great gluten-free food! As I begin writing this post, we are in the midst of yet another snow storm to be followed by ice…March is certainly carrying the bad weather forward! I had a very busy end to February and luckily, it included some sun and a lot of fun! Yes, my sister and I went to “The Sunshine State” of Florida to visit some wonderful friends and get some much needed rest and relaxation. And even though Florida was experiencing some very cold weather, the last few days of our trip were in the 70s while our northern families and friends were in a deep freeze. So let’s just say we felt very blessed! While visiting the Seminole/St. Petersburg area, I was able to find some gluten-free goodies! Here are a few of my finds! Double Tree @ North Redington Beach had a gluten-free menu! 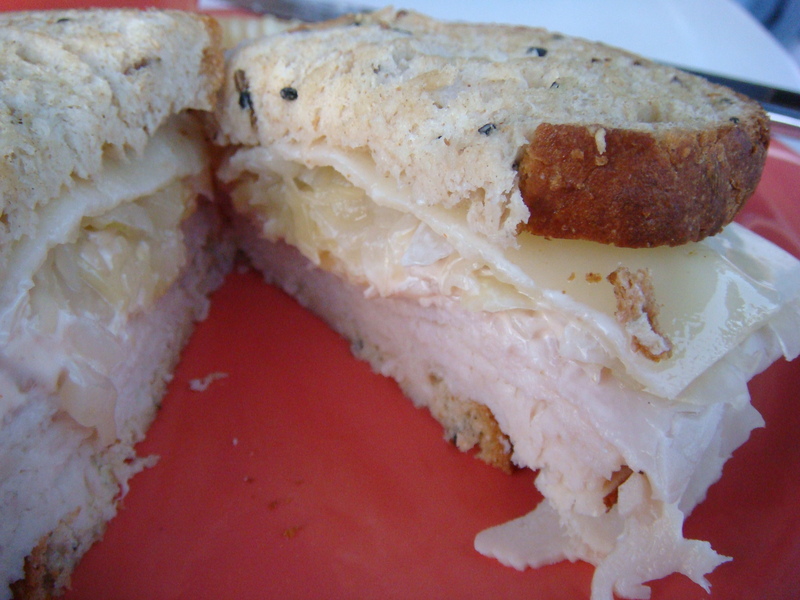 Turkey Reuben with roasted turkey breast, Swiss cheese, Thousand Island dressing and sauerkraut on toasted GF caraway seed bread! 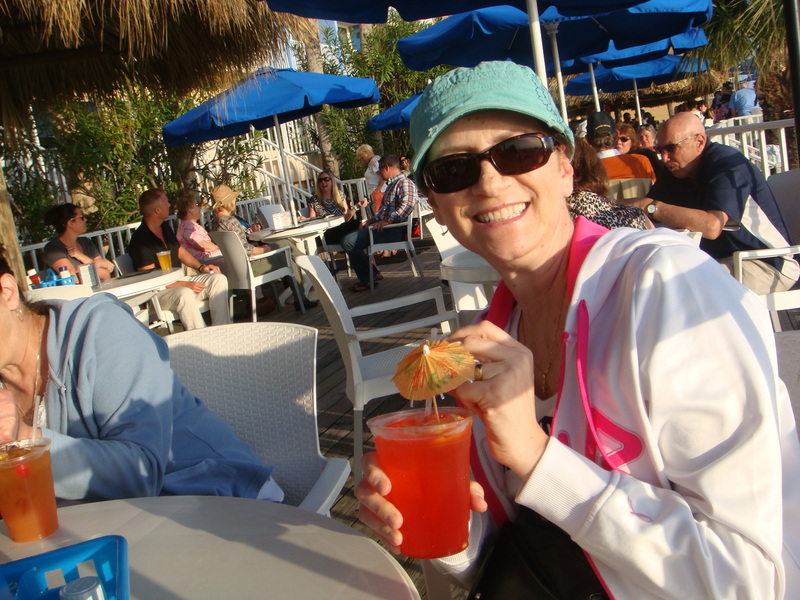 Accompanied with Strawberry Lemonade with beach umbrella….mandatory! 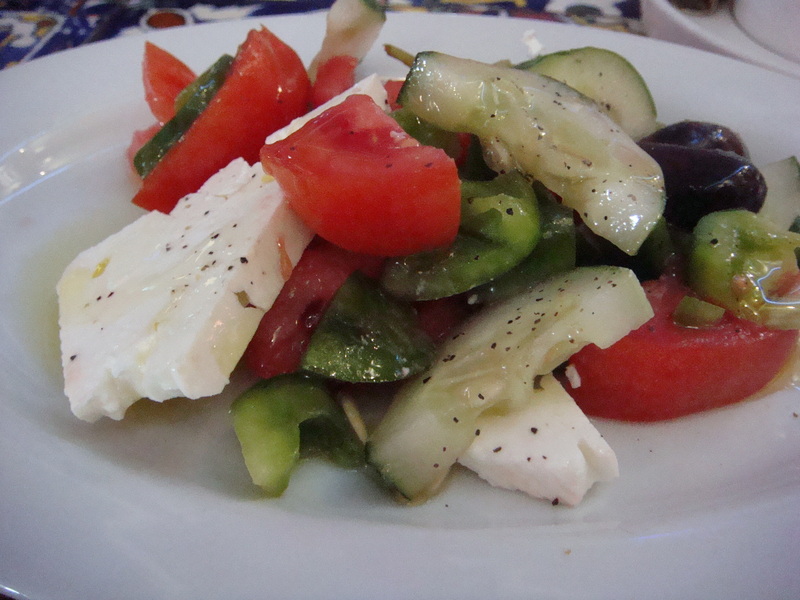 Horiatiki Salad @ Hellas in Tarpon Springs….garden fresh tomato wedges, cucumbers, onions, green peppers, Greek olives, and feta cheese. I had mine with oil and vinegar to be safe. The “best Gyro in town” without the pita @ Hellas! 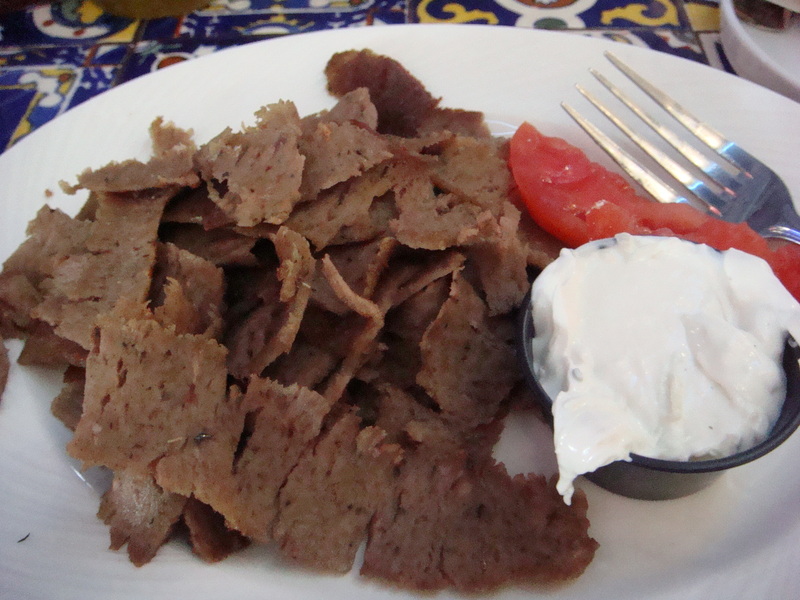 A blend of lamb and beef, broiled….melted in my mouth with tzatziki sauce! Delightful! 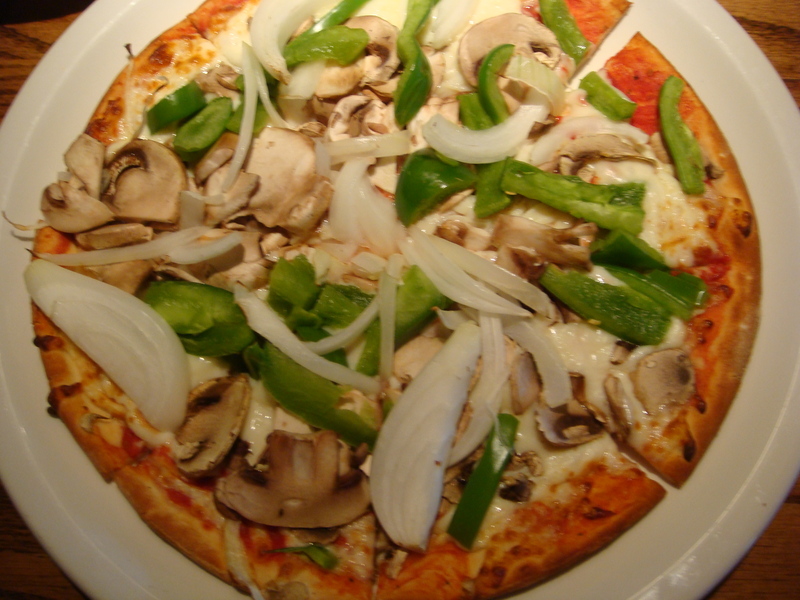 We had to go to Florida to find a Pizza Hut that carried gluten-free pizza….was a treat but didn’t have the taste I remember! 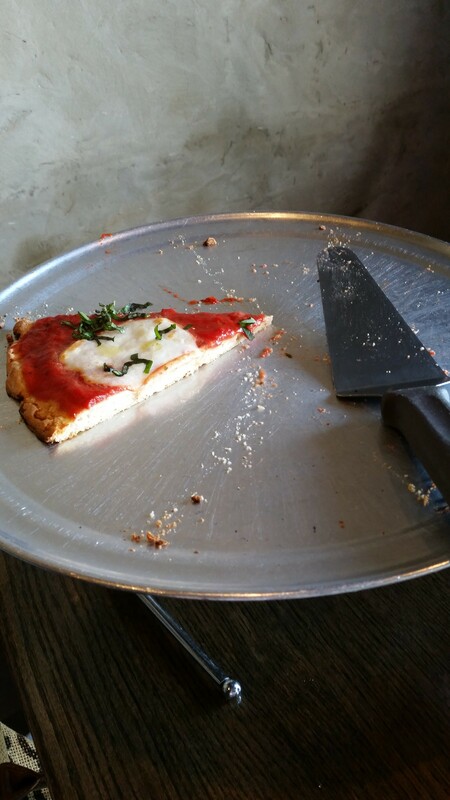 I guess I was really missing that gluten-filled crust….oh well! 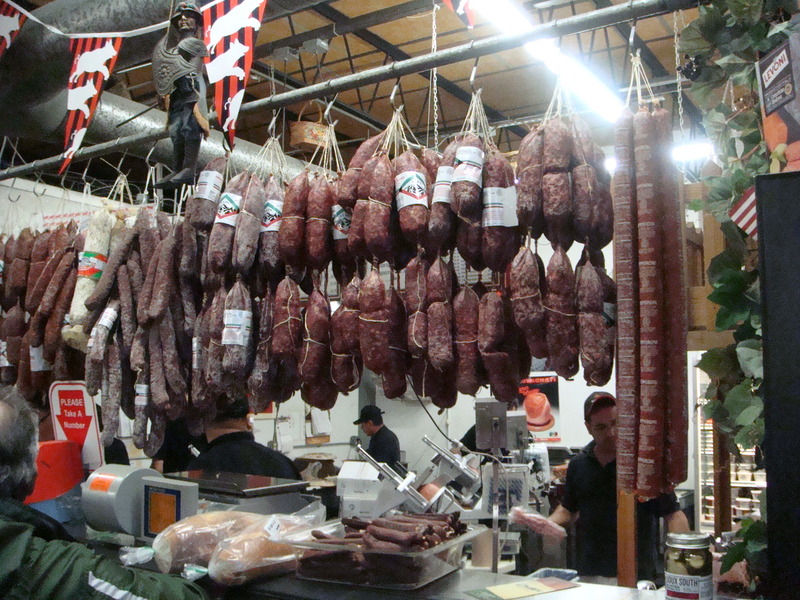 A visit to the Mazzaro’s Italian Market in St. Pete was the best place yet! We could have wandered in this place all day! Everyone was hustling and bustling about….great fun! Of course, I had to have dark chocolate gelato and look at these Italian salamis and pepperonis! February ended on a very high note when Lewie and I attended the wedding of our dear friends’ son, Ian who married his high school sweetheart, Sarah. Lewie and I (also high school sweethearts) celebrated our own wedding anniversary just a week prior and were so happy to be invited to this celebration! And the weather cooperated! Ian’s mom, Dori, and I first met when I was hired as an elementary librarian at a school district in the Poconos where her children attended school. She was hired as my library assistant and our friendship was cemented right off the bat! We had so much in common and have been close ever since….19 years and counting! 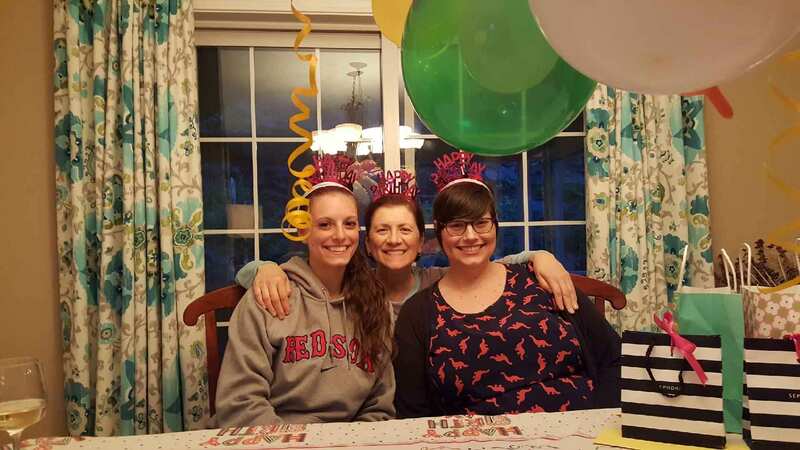 Later, when I transferred to the high school, I was again connected with Dori’s children….just loved having them! 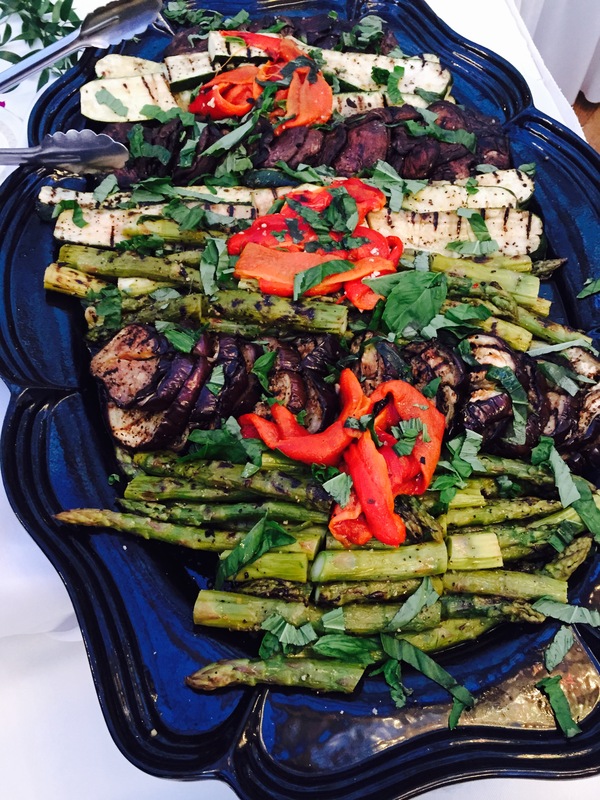 Luckily our husbands are good friends too….Mike and Lewie have a lot in common as well….both LOVE food and are great cooks! 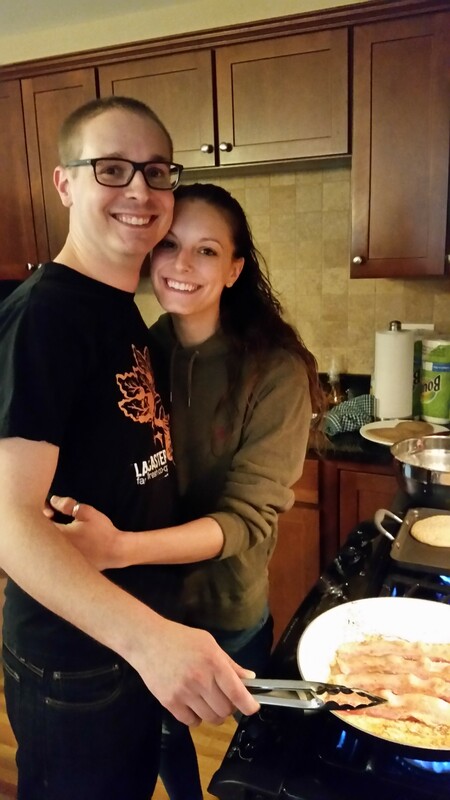 Lucky us….although we aren’t too bad in the kitchen, either! 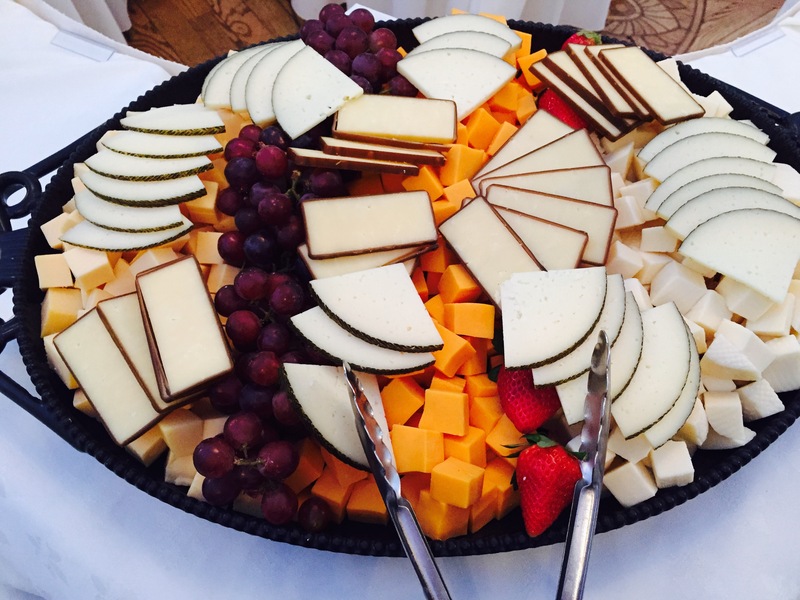 Anyway, Ian and Sarah chose what proved to be the absolute best place to have their wedding reception….The Brownstone in Paterson, New Jersey. It was stunning in every way! 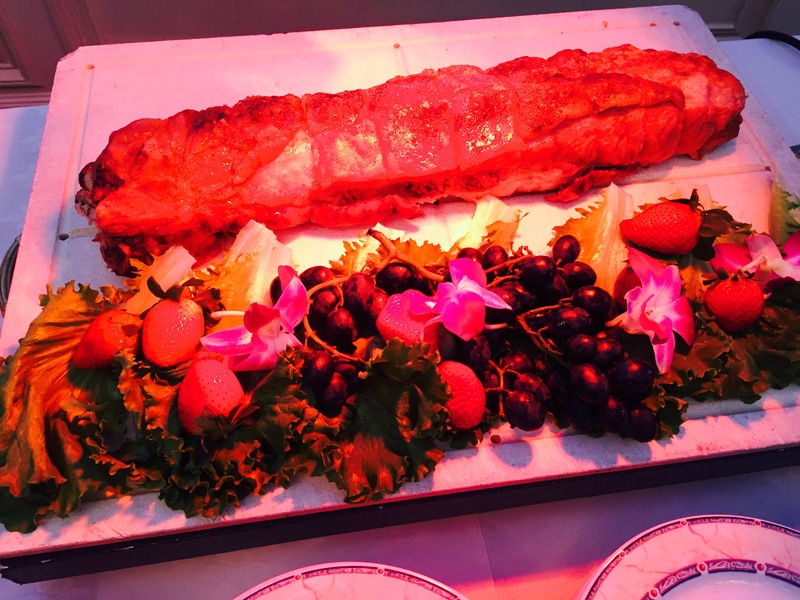 The food was phenomenal….by far, the best wedding reception food we’ve ever eaten! It truly did not taste like mass-produced food at all….it was fine dining! And even if I couldn’t eat some of it…I admired the smells and beautiful presentation of the appetizers, the drinks, the salads, the entrées, etc. To say that we were “stuffed” is an understatement! 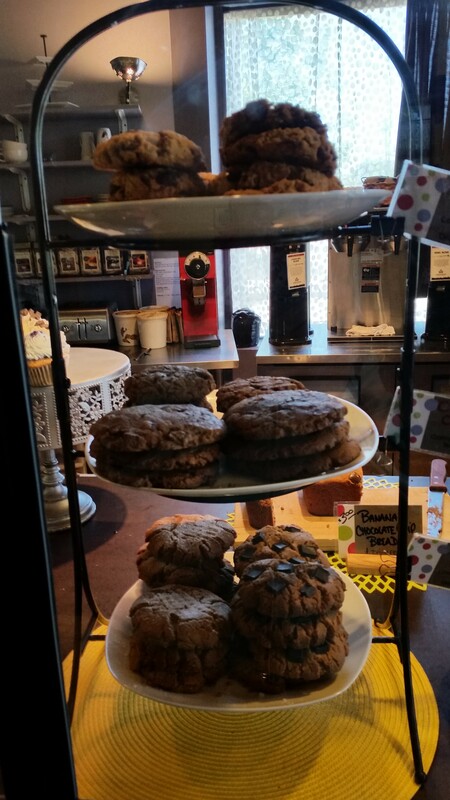 You just couldn’t help yourself….so much to eat and so little time! Thank goodness for the wonderful DJ and dancing! The evening began with appetizers too numerous to recount but here are a few of my gluten-free favorites! 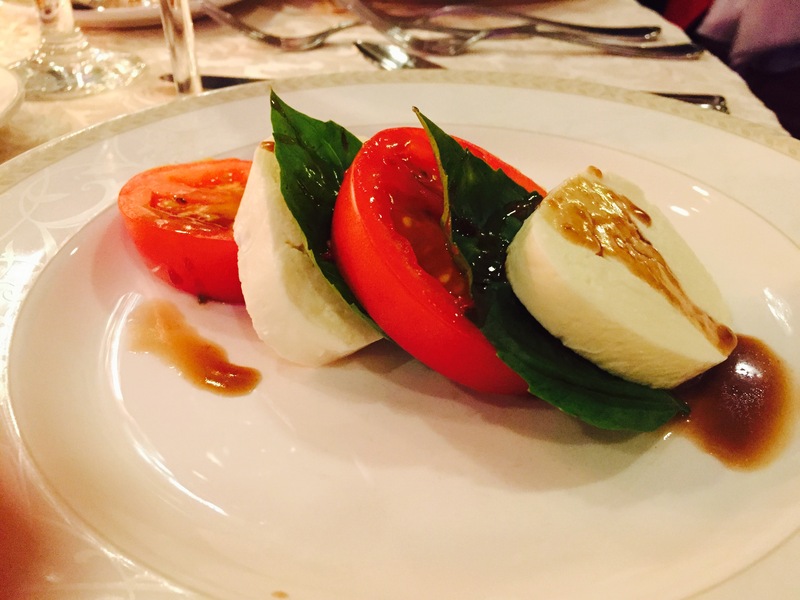 Our dinner was a Mediterranean dream….the wait staff asked you to choose your salad, pasta, and entrée. I did not choose pasta for obvious reasons, but here are my other choices. 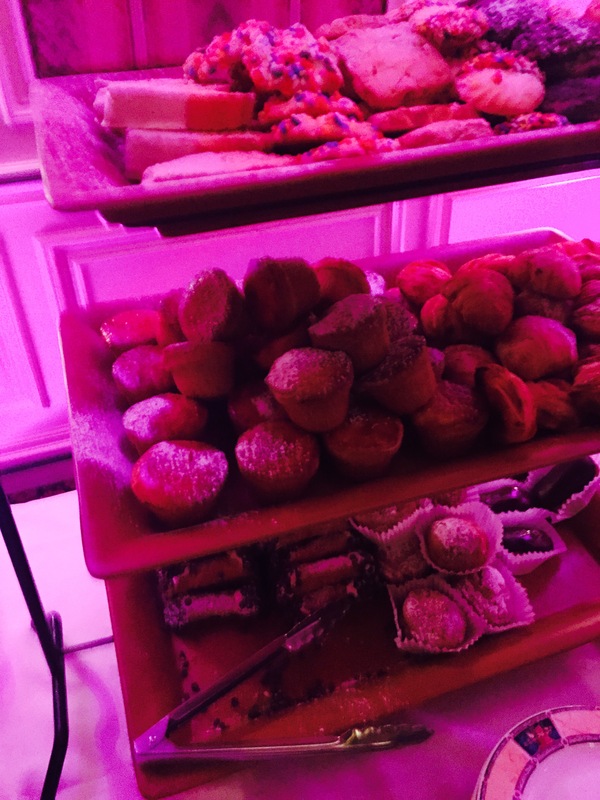 And c’mon…..how about this dessert table? 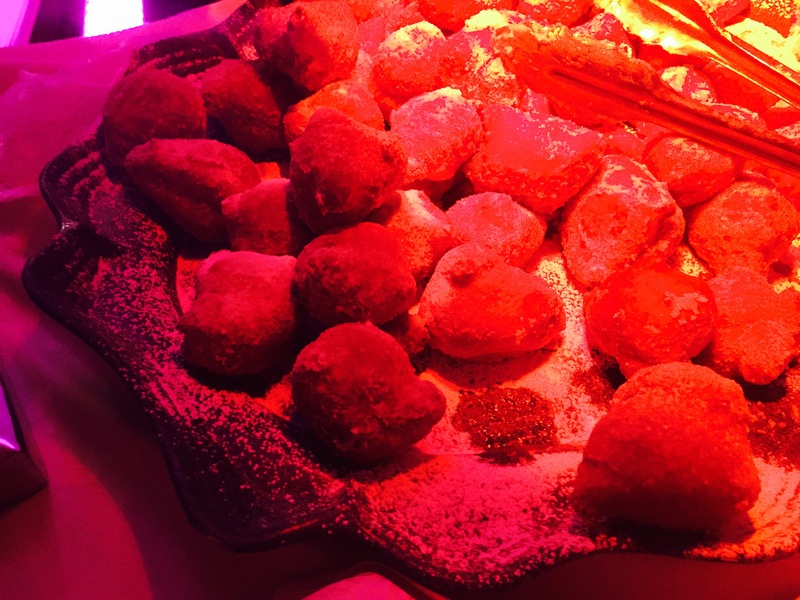 Italian zeppole (doughnuts), wedding cake that tasted like strawberry shortcake (or so I was told by Lewie), Italian cookies, fruit, and coffee (with your choice of liquor) that was so pretty, you just didn’t want to drink it…but I was told it was incredible! Even though I could only choose fruit, it was delicious and satisfying! 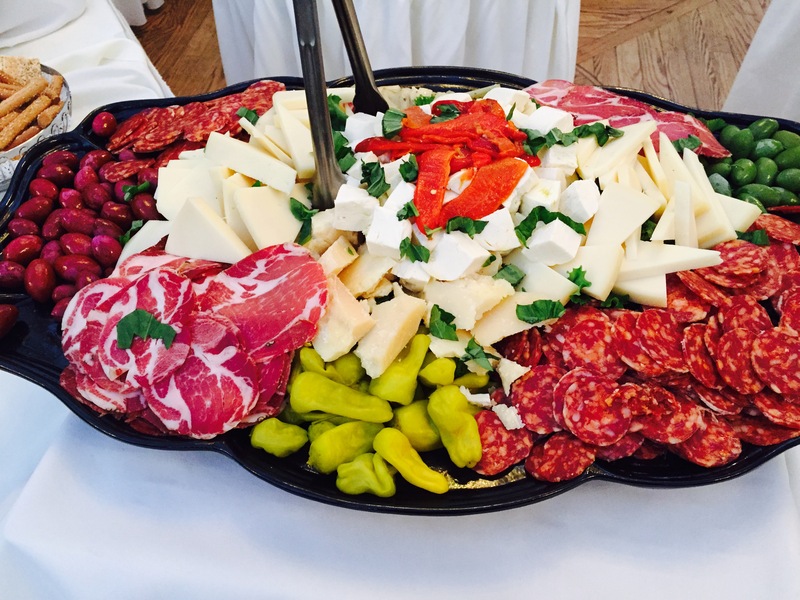 Let’s face it…there’s nothing like an Italian wedding! If you’ve never been to one….I hope you get invited to one of these amazing celebrations! Just love this picture of Mike, Sarah, Ian, and Dori! 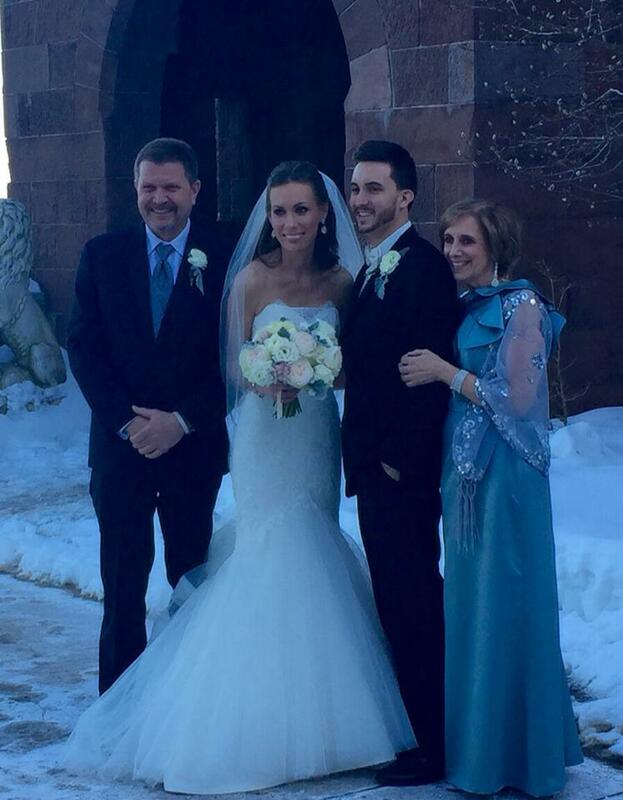 Much happiness for Ian and Sarah! Thank you for letting us share this glorious day with you! The “birthplace of American democracy” is so rich with history. You feel like you’ve actually stepped into a history book…it’s that amazing! How lucky we were to be travelling from Pennsylvania to Williamsburg on a clear and sunny day! 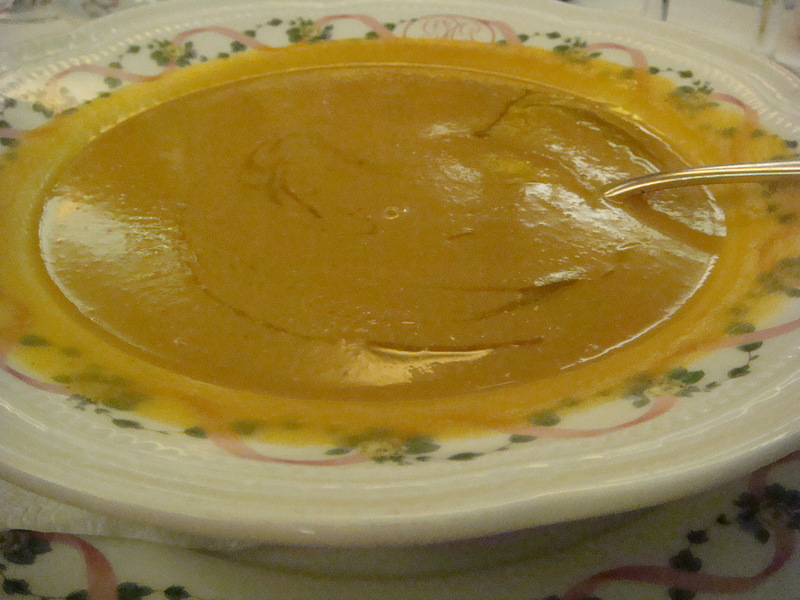 We stopped for lunch about 2 ½ hours into our trip at a wonderful little place called Pure & Simple in Greencastle, PA. This little gem tries its best to only use natural, organic, and locally produced ingredients. 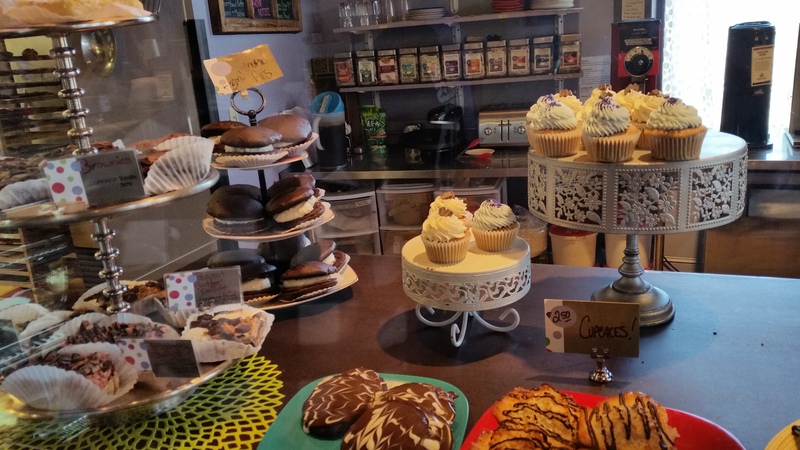 They have many gluten-free selections and it is just a joy to be there! I was so happy to order a roasted chicken salad (pastured local chicken, mixed greens, tomato, tarragon, vegenaise, olive oil, and pine nuts) on a gluten-free teff wrap with black corn chips. Did I say how excited I was? So excited, that I forgot to take a picture! 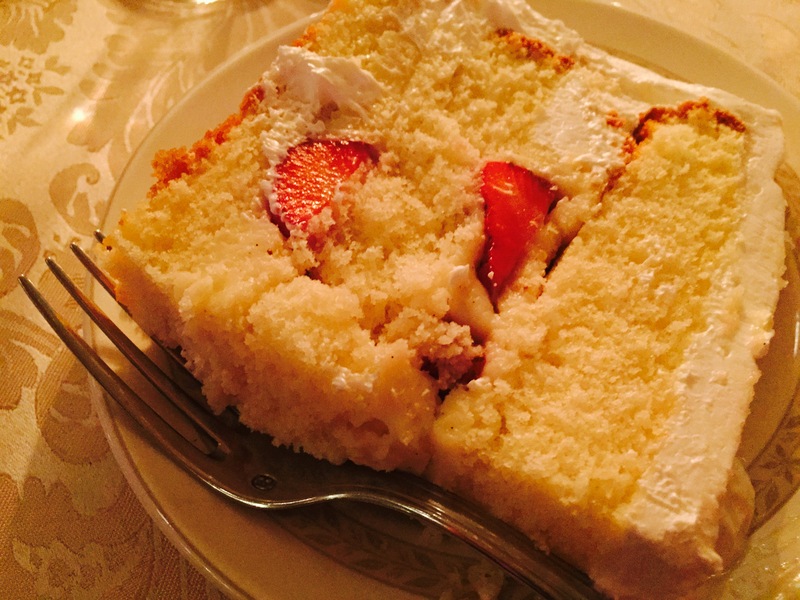 However when dessert arrived, I did not forget to photograph it….in fact, Lewie and I both had gluten-free desserts! 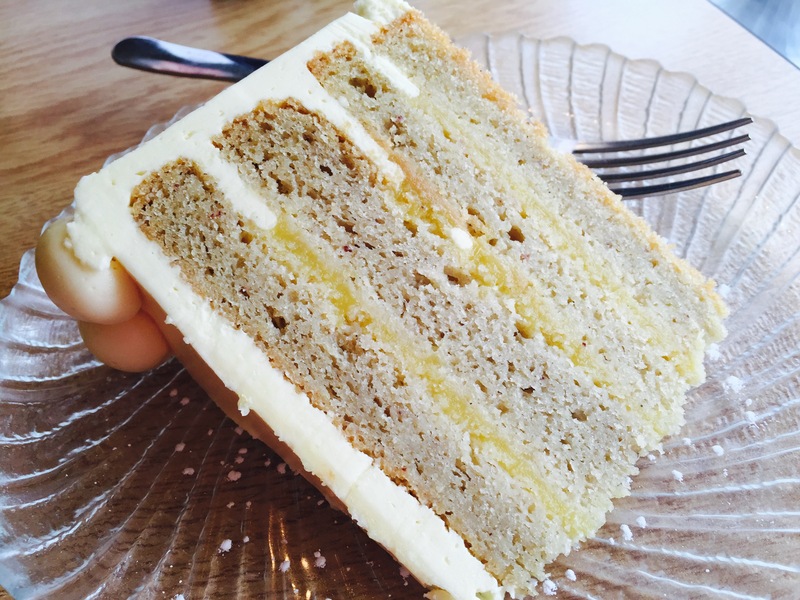 We shared a gluten-free chocolate sun butter cake with buttercream icing and a gluten-free lemon meringue cake with lemon curd and buttercream icing. All made on the premises! It was so great that I not only was able to order lunch, and then to order dessert! It felt like heaven! When we arrived in Williamsburg, we were happy to find a Trader Joe’s. 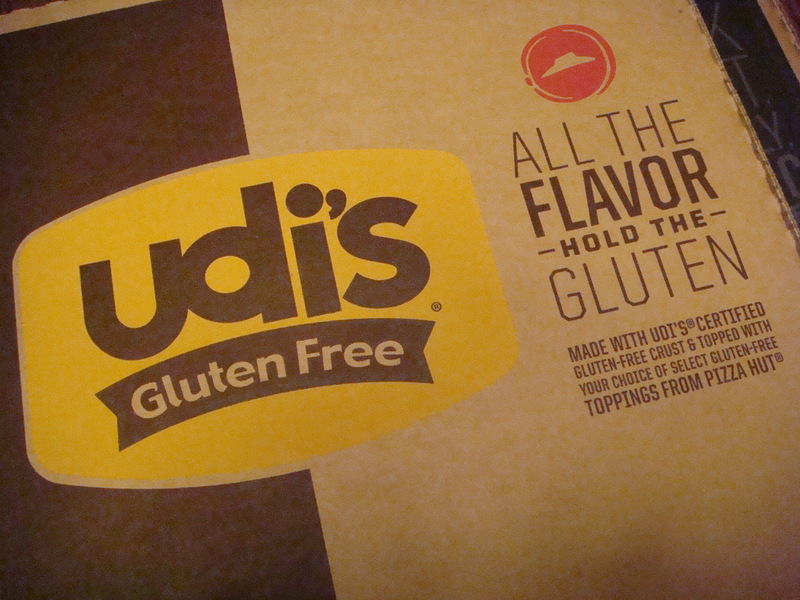 Since they carry many gluten-free items that I like, we stocked up on some of those for the week. 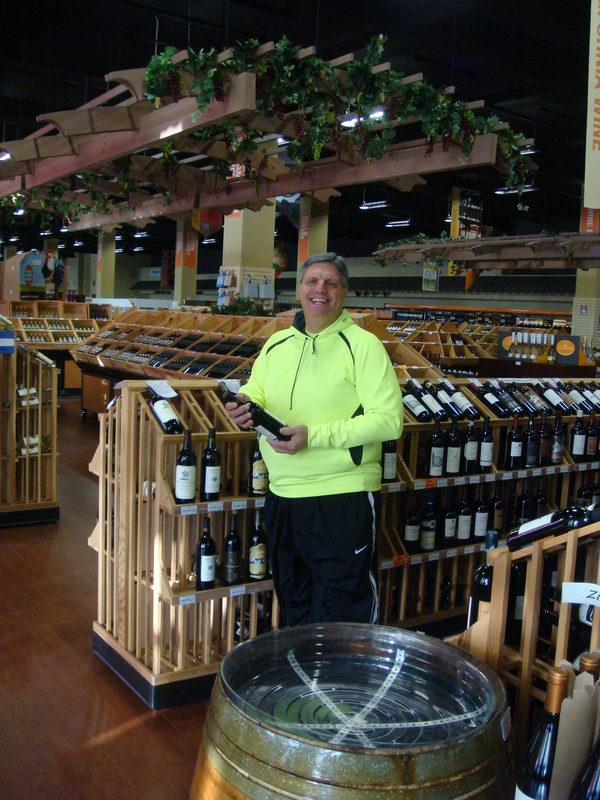 And did you know that the famous Charles Shaw wine, 2-Buck Chuck, is still a steal @ $3.29 a bottle? 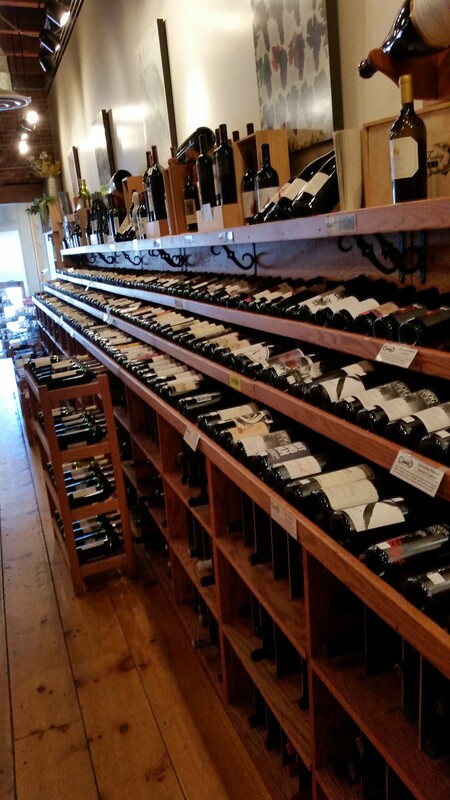 Needless to say, we purchased some wine, too! It’s gluten-free! 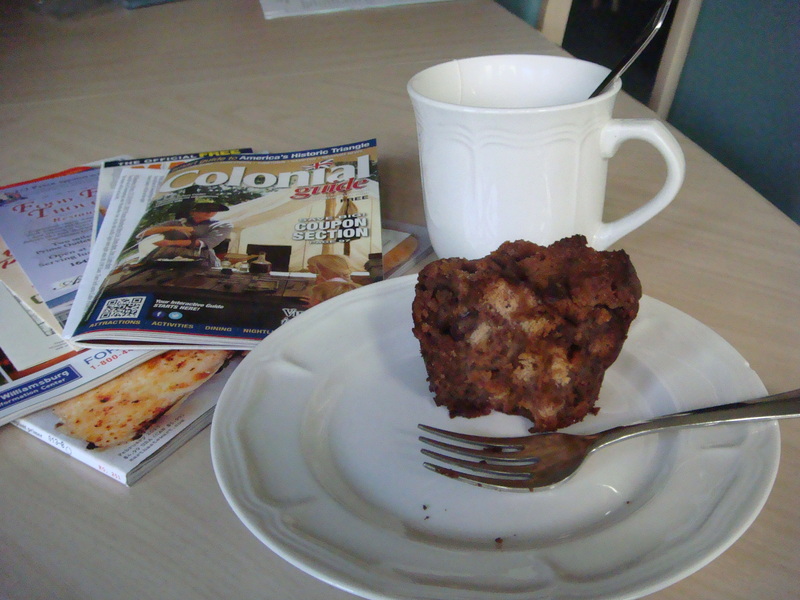 Next morning I enjoyed a gluten-free bread pudding made by my blogging partner, Daria. 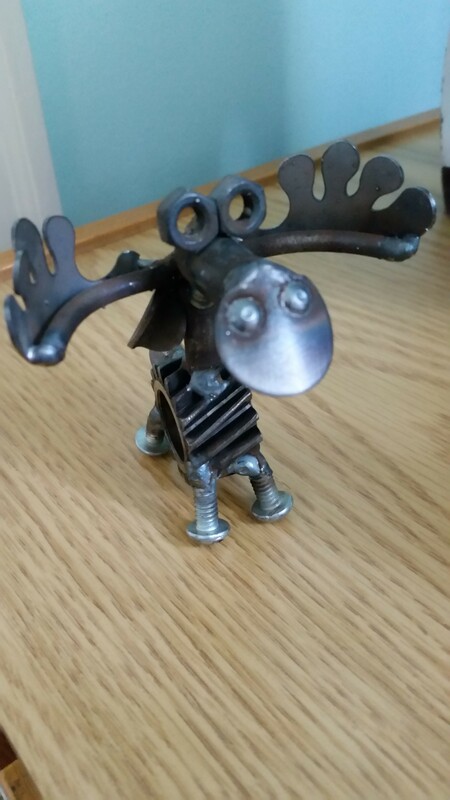 We had surprised her and stopped in Hershey to see her along the way, and she gave me this little beauty. 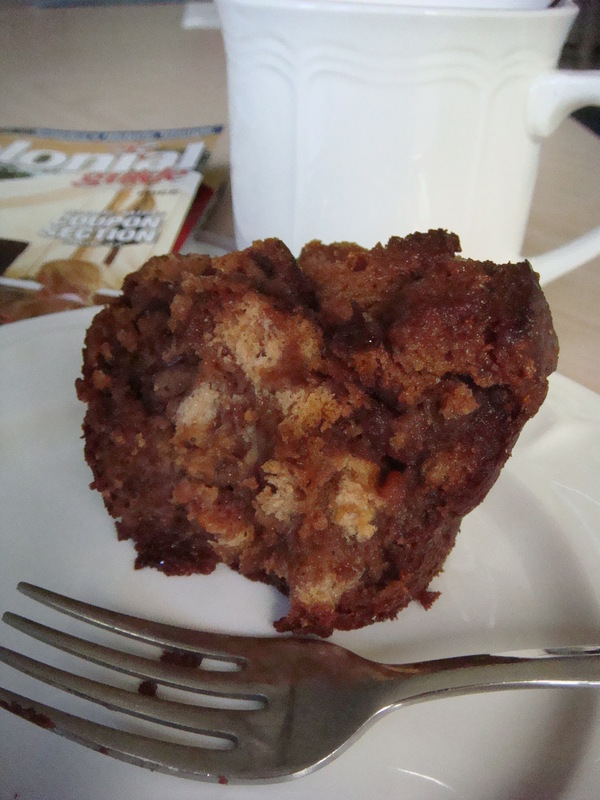 It was delicious with a cup of tea…must get the recipe from her! After familiarizing ourselves with the area, we wanted to eat pizza. There are so many places that have gluten-free pizza in Williamsburg that I could actually choose the place to go! We settled on Olde Towne Pizza on Olde Towne Road, since there was a great article about the chef in one of our welcome magazines. The place did not disappoint! 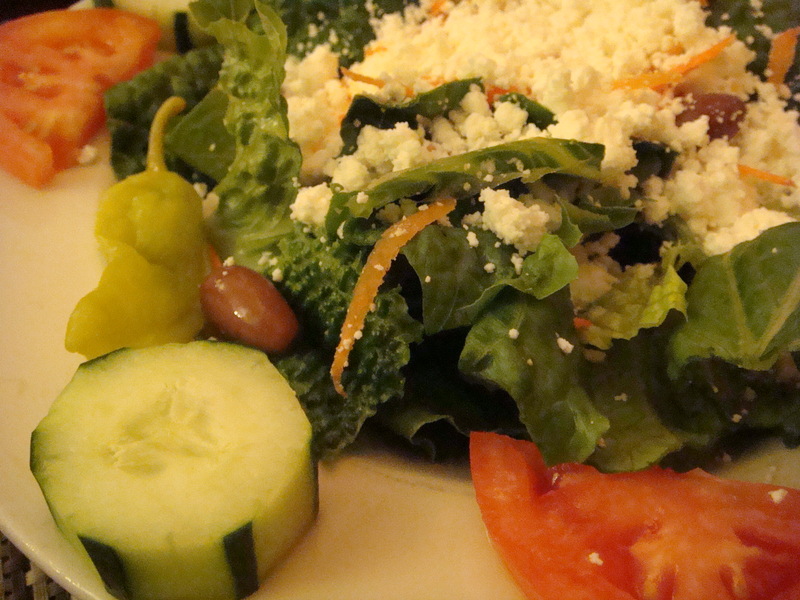 First, we ordered a Greek salad with feta, olives, tomatoes, and cucumbers. 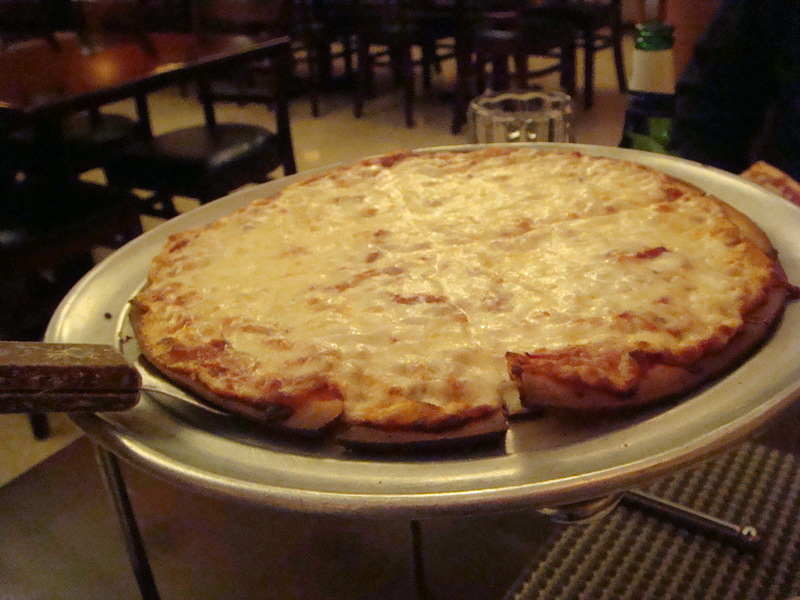 Next, came the gluten-free pizza with traditional sauce and cheese. The cheese was so gooey and good! Happiness!! Visits to the Antique Mall of Williamsburg (over 300 antique dealers) and the Williamsburg Pottery (with three huge marketplaces) were on our list for this day, since it was raining and we knew we wanted to be inside. 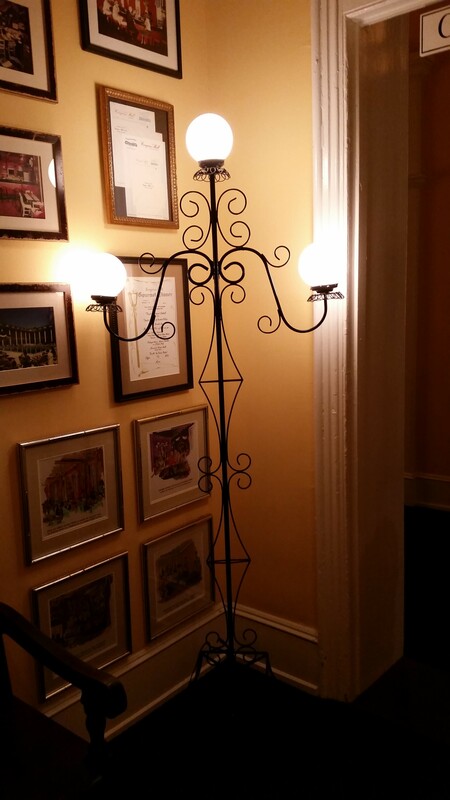 Both places are great to see if you are an antique lover like me! Our favorite part of the Williamsburg Pottery was, of course, the Gourmet Kitchen Marketplace. We found such good things! 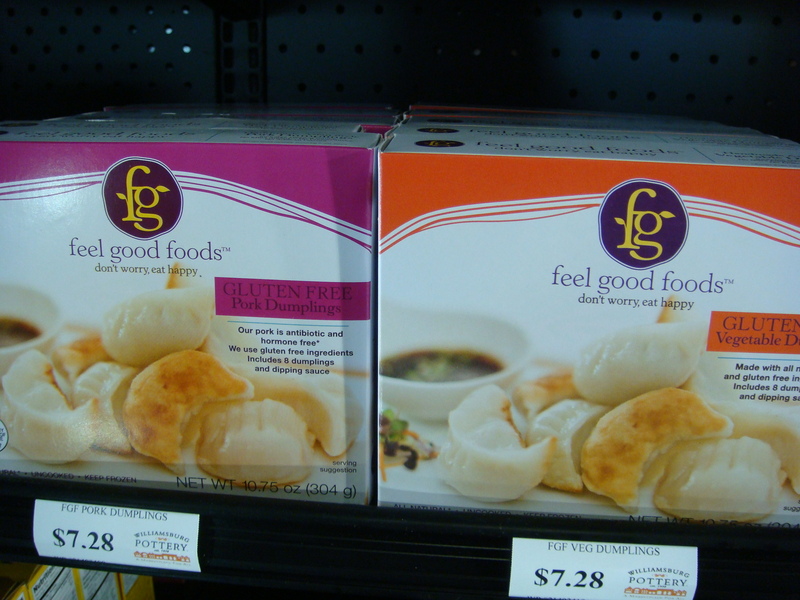 And so many gluten-free items that we do not have in northeast PA! We had brunch to begin our day and Lewie was in charge. 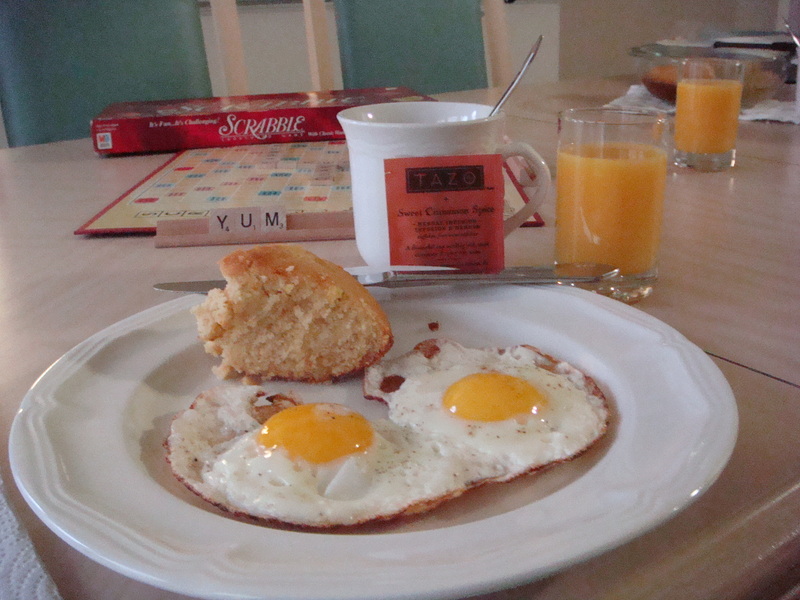 He baked some gluten-free cornbread (Krusteaz brand), cooked sunny-side up eggs, poured orange juice, and steeped Tazo sweet cinnamon spice tea. Perfect way to get started! The day was full of walking and walking and walking! It was really fun and we worked up an appetite! Since Thai food is one of our favorite cuisines, and a regular “go-to” we were delighted to find a place in town called Bangkok Garden Thai. The menu was so extensive that it was hard to decide what to eat! 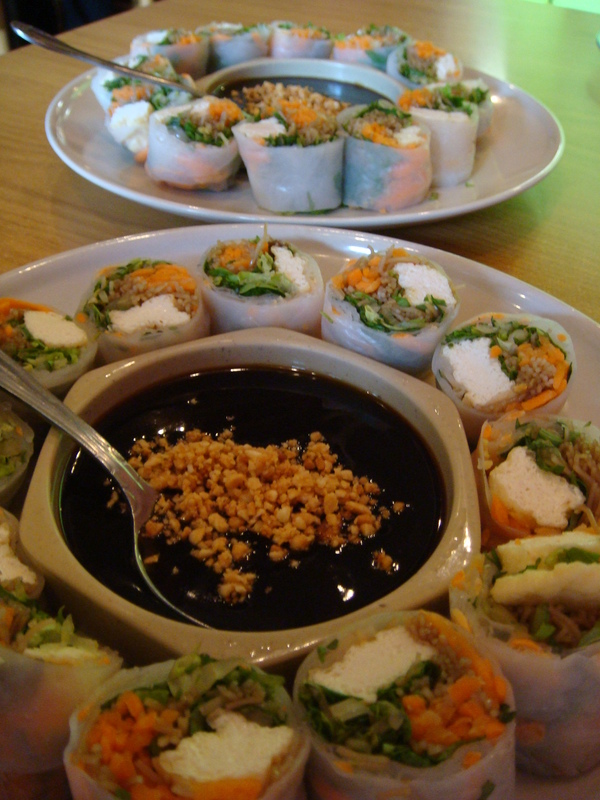 I settled on an appetizer of steamed shrimp rolls served with sweet and sour sauce and ground peanuts. 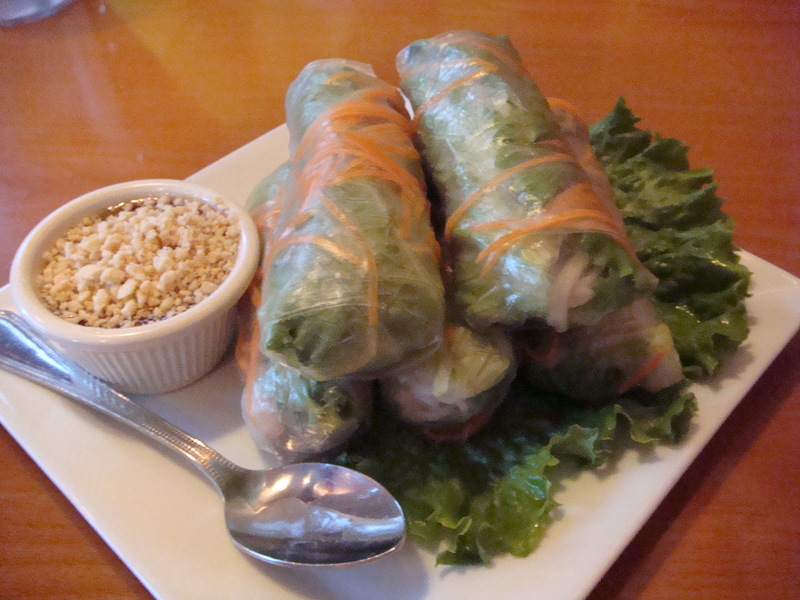 These rice paper rolls were so delicious! 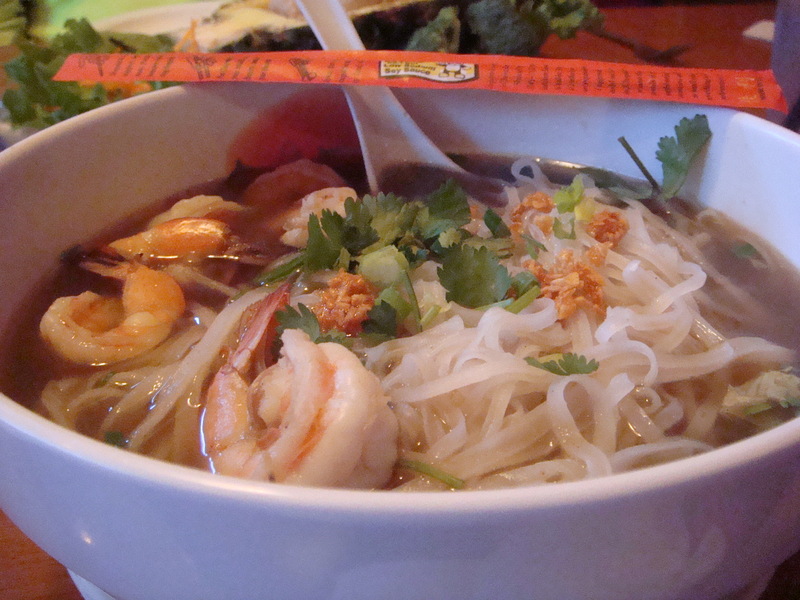 My entrée was “Ocean Noodle Soup” which had fresh rice noodles in a broth with bean sprouts, green onions, garlic, cilantro, and shrimp. It was the perfect food for a rainy day! 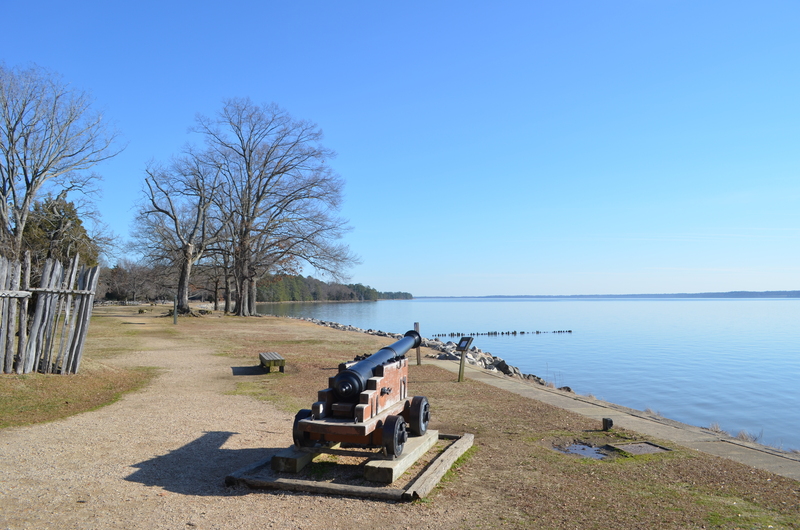 Our next adventure took us to Yorktown, the site of one of the most critical of all Revolutionary War battles. 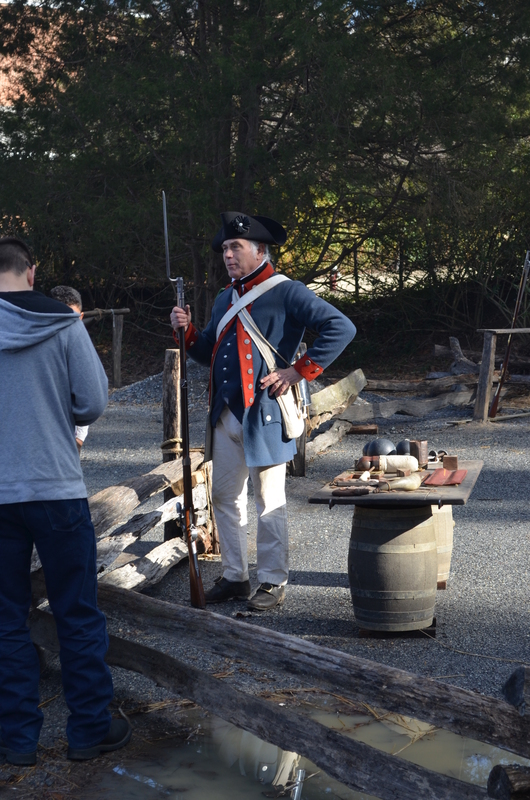 We toured the Victory Center (a new one is under construction) and went “into the field” to speak with re-enactors who explained everyday life as it was during this time. And I made a friend on the way to the museum! The victor in the 1781 battle….General George Washington! Again, all of the walking and sightseeing set off our appetite alarms and we landed at the Riverwalk Restaurant. Maybe my favorite place of the week! 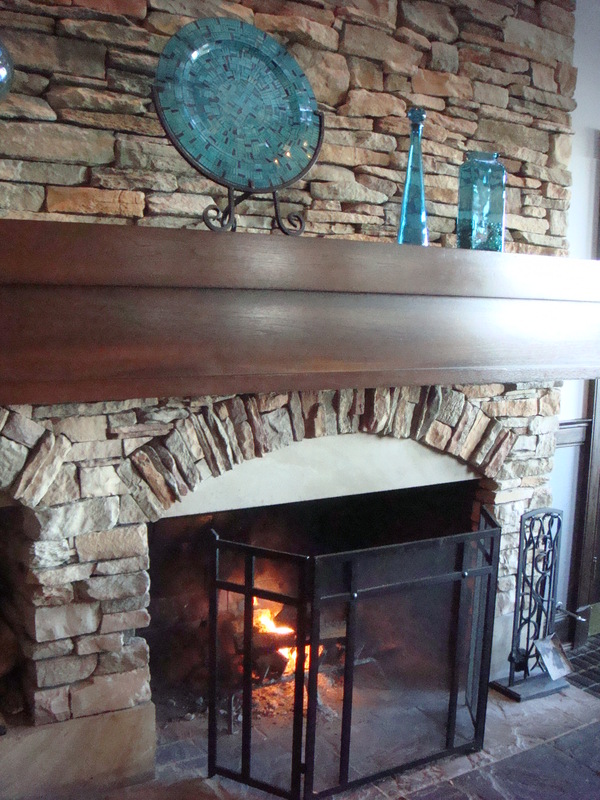 We were seated by the fire on this damp day and the atmosphere was just right! 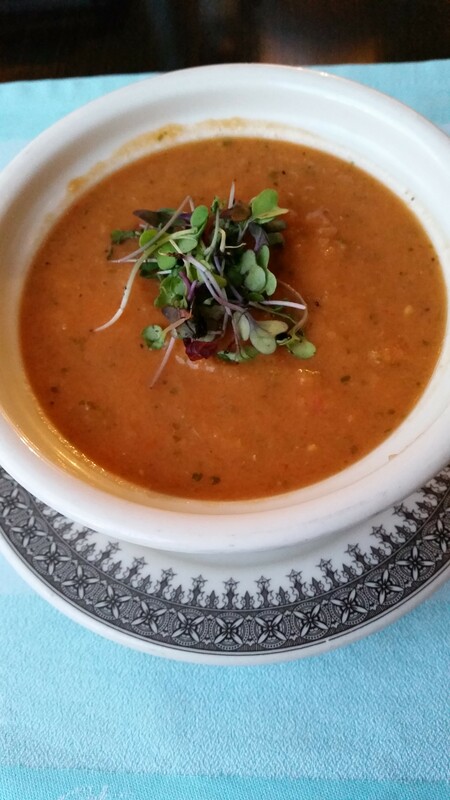 Our early dinner began with a tomato basil crab bisque that was to die for! 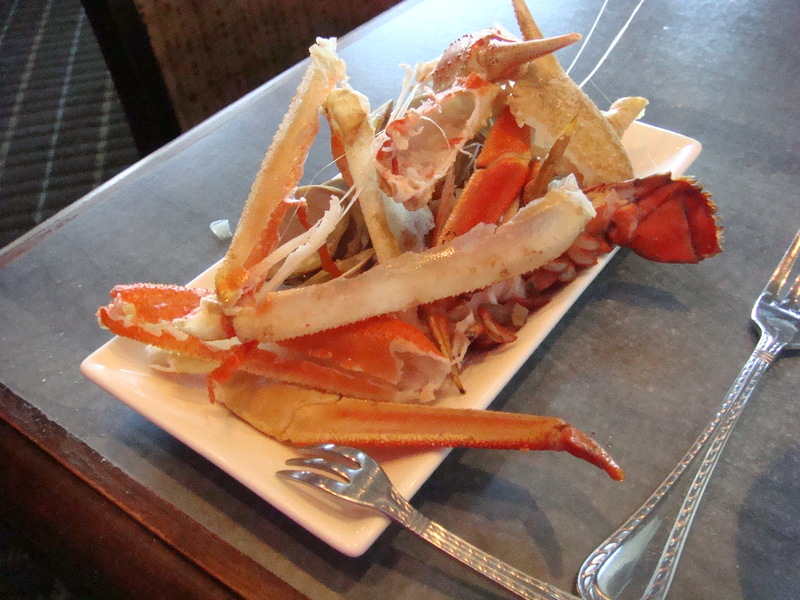 It was so creamy and the crab was so plentiful that you had crab in every spoonful! 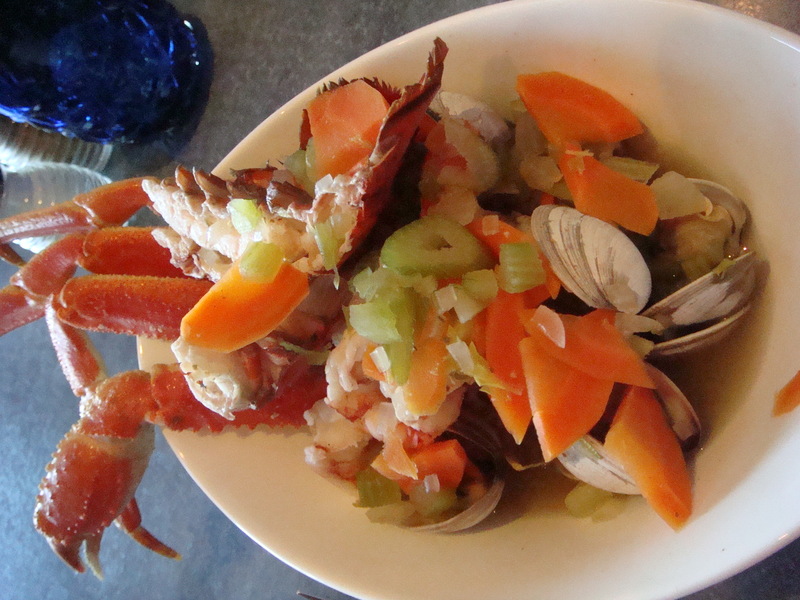 We followed this with the special of the day, the “Seafood Boil.” OmG…it was outstanding! 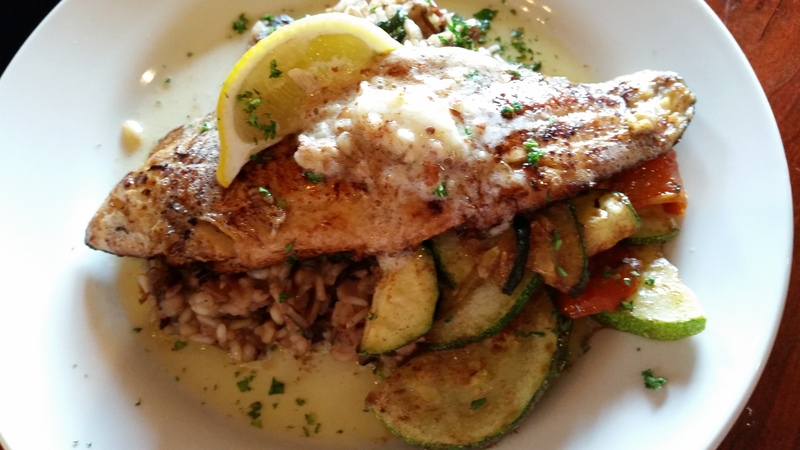 If you love seafood, this is the entrée for you! Isn’t it gorgeous? 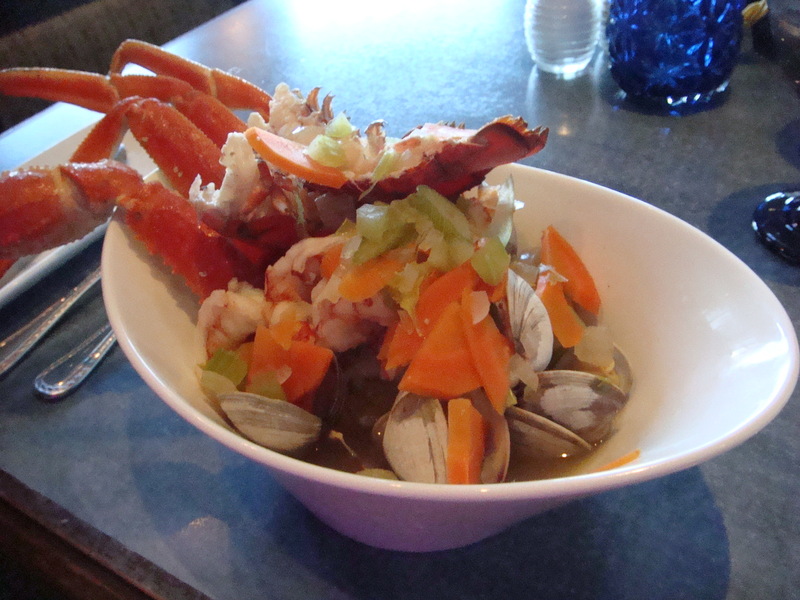 The fresh clams, shrimp, lobster, and Alaskan King crab legs, are all steamed in a broth with carrots, celery and fresh herbs…I could still smell the wonderful aroma! We ate it all up! I’d go back in a second! 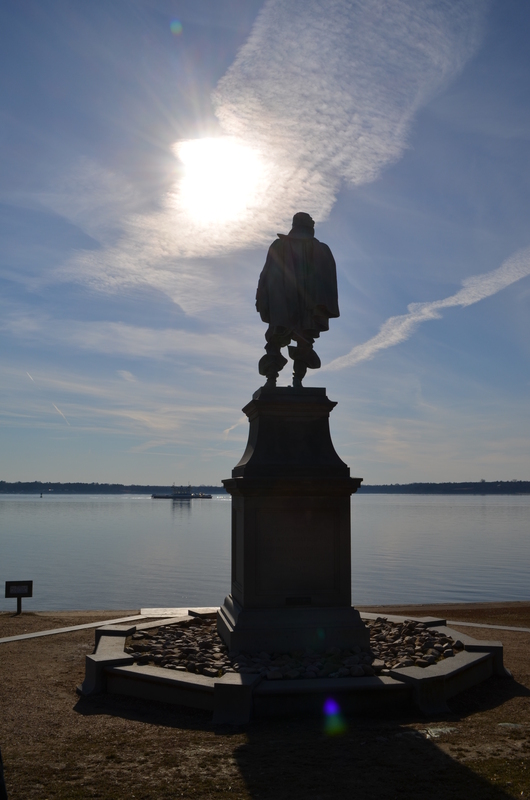 The next day we decided to venture to Jamestown where over 400 years ago, 104 men and boys selected a site on the James River which became America’s first permanent English settlement. 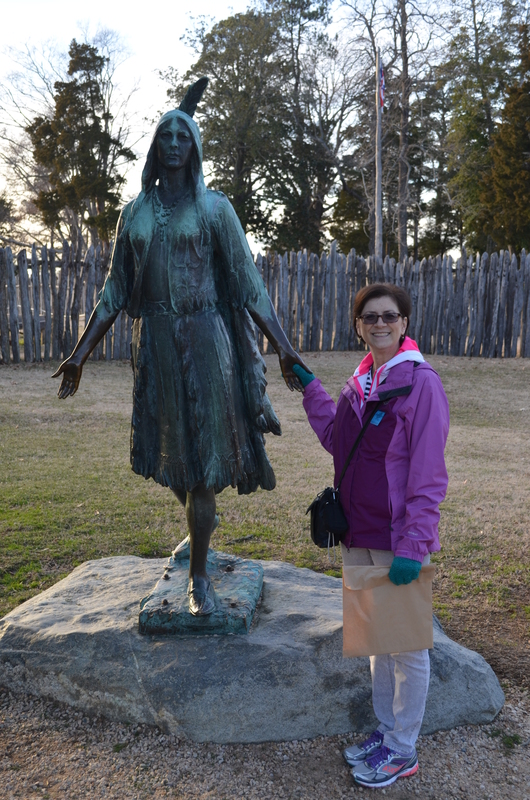 Having taught in Virginia in the early 1980s, I brought my class to Jamestown for a field trip. However, since my visit, there have been archaeological findings in 1994 that have changed the whole understanding of the settlement. In fact, these archaeological digs are still continuing. Our tour guide was so knowledgeable and funny…we learned so much! This may have been my favorite all-time tour because of our guide, Mark Summers! And I made another friend! Pocahontas…she was the daughter of Chief Powhatan, who by marrying John Rolfe, united the English and Powhatan tribes for several years of peace between the two. 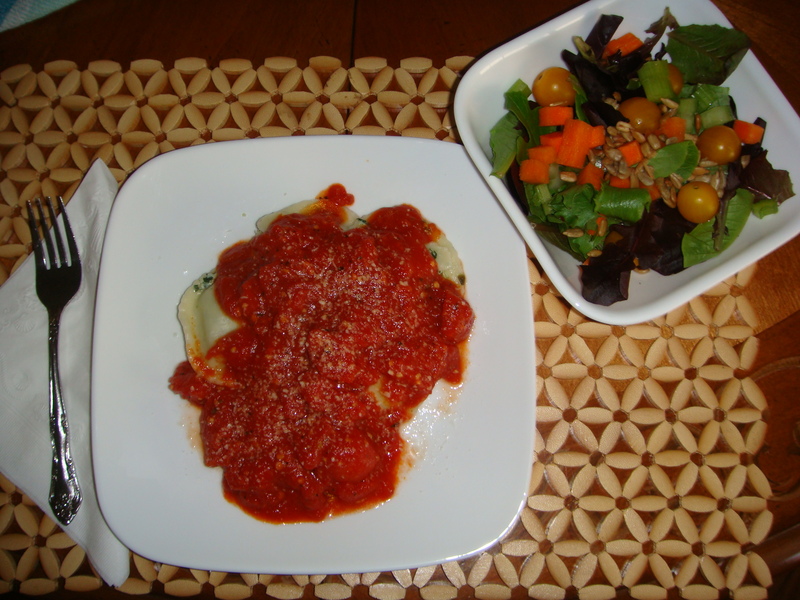 When we were done touring Jamestown, we decided to cook “at home” and enjoyed Conte’s gluten-free ravioli with marinara sauce and a salad. When we were at the Williamsburg Pottery mall one of the previous days, they had a gourmet foods section and we found this! 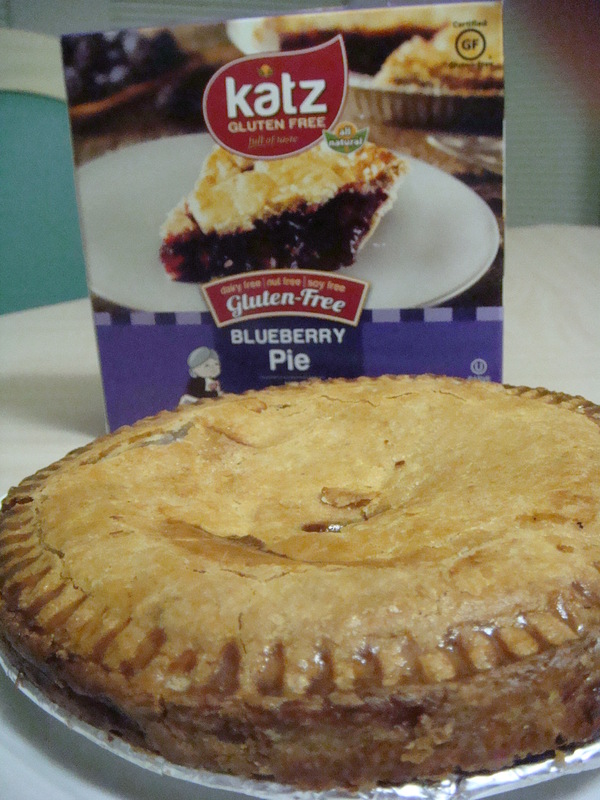 A cute, little gluten-free pie in the frozen foods! Of course, I picked blueberry! A great dessert to end a great day! 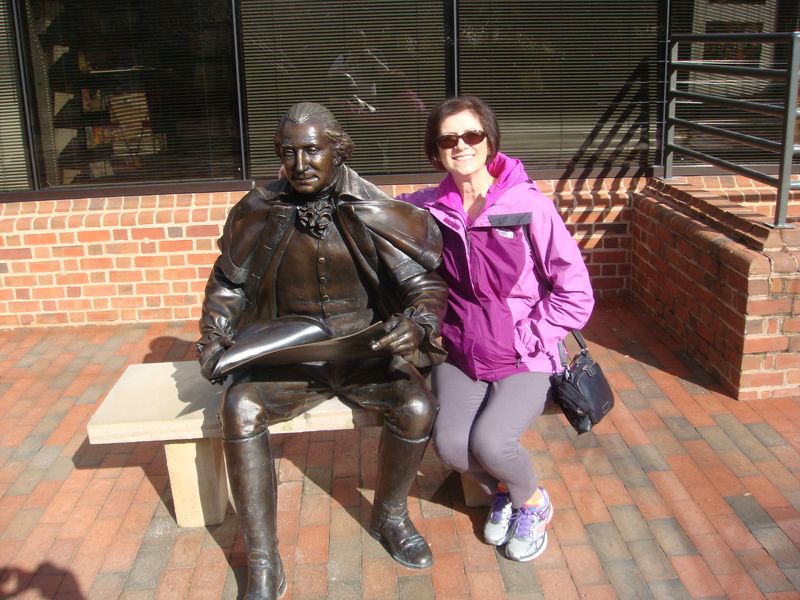 Our last day was upon us….and we decided to visit Colonial Williamsburg! We have been here several times, as we lived in Richmond in the early 1980s and in 2006, Daria did her pastry externship at Kingsmill in Williamsburg. But, we had never been to the Art Museums of Colonial Williamsburg! So off we went! The museums house the Public Hospital of 1773, the first of its kind in America where it attempted to treat those suffering with mental illness; the DeWitt Wallace Decorative Arts Museum which houses collections of furniture, metals, ceramic, glass, and more; and the Abby Aldrich Rockefeller Folk Art Museum which houses colonial and contemporary folk art. We were fortunate to have an almost private tour with a woman who led us through the museum. It was both fascinating and a feast for the eyes! After our tour, and when we were hungry, we headed to Merchants Square where there are more than 40 shops and restaurants, all nestled between the College of William & Mary and the Historic District. The Cheese Shop was our destination. We were familiar with its menu and had eaten there while visiting Daria back in 2006. We were not disappointed! 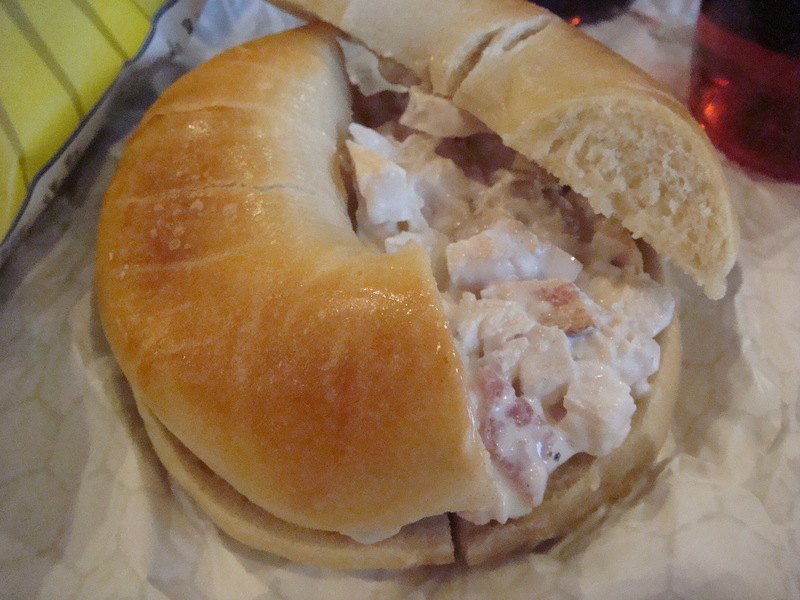 I ordered a gluten-free Udi’s bagel with homemade chicken salad (chunks of chicken with celery, onion, bacon and mayo). 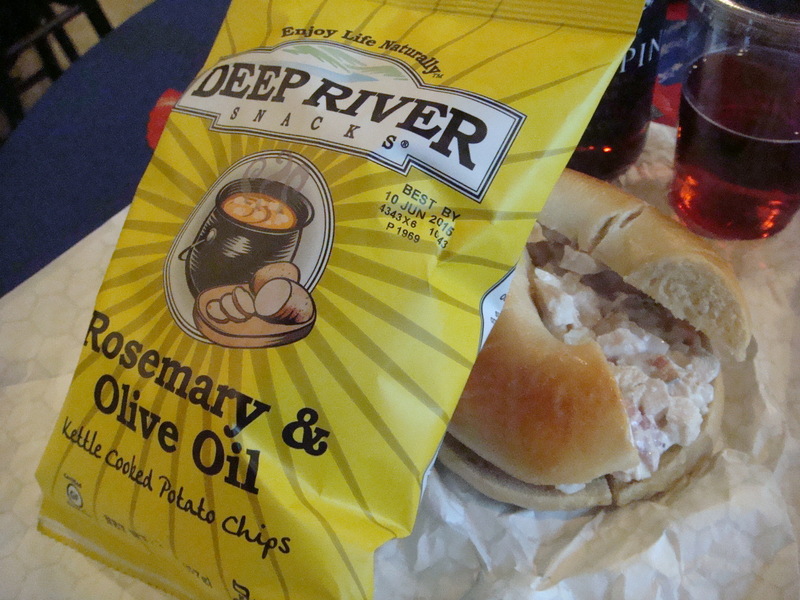 Of course, you need something crunchy to go along with your sandwich, so I chose Deep River chips. So good! 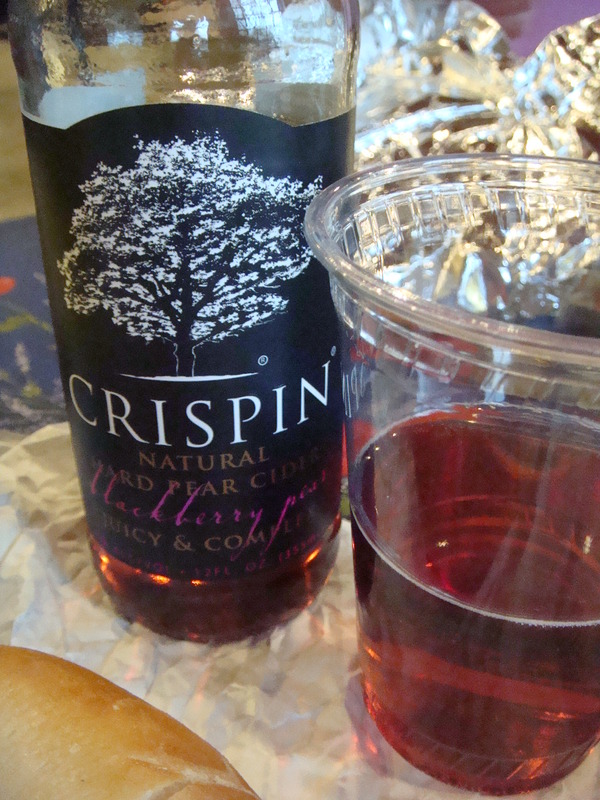 To wash it all down I had a Crispin Hard Cider (Huckleberry pear). Very tasty! We visited several shops and of course hit the William & Mary campus store. It was all in all a fun day! Our last dinner proved a bit disappointing. We had gone to the Bonefish Grill a few times when Daria was a student at the Culinary Institute of America, since there was one in Poughkeepsie near the school. Of course, Williamsburg has a Bonefish Grill, too. So we headed there! Our favorite appetizer is the Mussels Josephine; this appetizer features the mussels in a tomato, red onion, garlic, basil and lemon wine sauce. The mussels were delicious, however, even before we were done eating them, the wait staff brought out our entrées and as a result, the food started to cool down considerably. 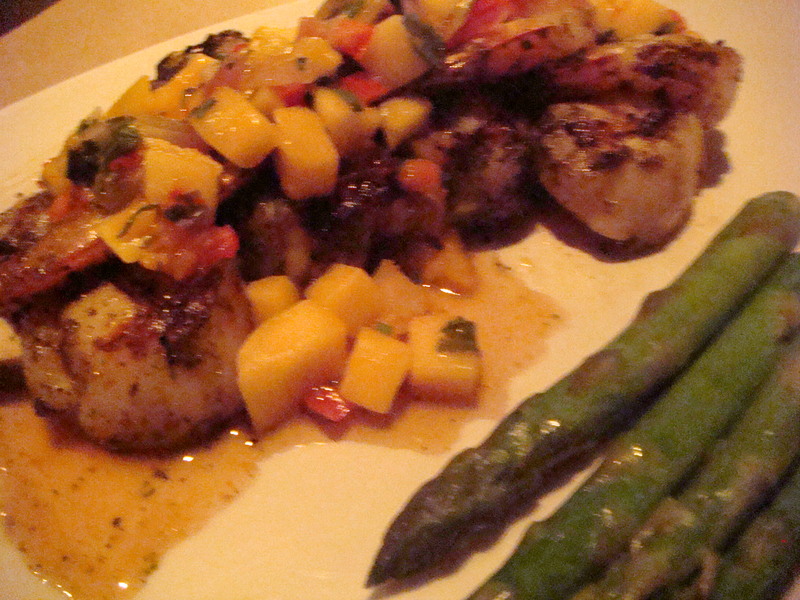 I had ordered from the “Gluten Free Menu” and decided on the wood-grilled sea scallops and shrimp with mango salsa. My side order was steamed asparagus. 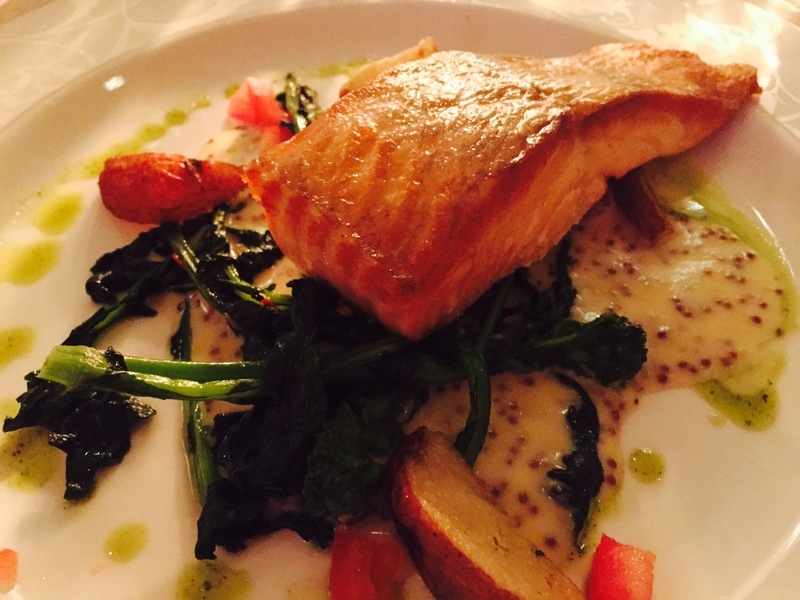 Nowhere did the menu mention “blackened” fish….and yet, when it arrived at the table, it looked peppered! I should have sent it back the moment I saw it, however, I didn’t and my indigestion upon eating it, stayed with me for many hours and hours! It was my fault for not speaking up…next time! Overall, I would recommend visiting the Historic Triangle to anyone who is gluten-free! We found nearly every restaurant to be accommodating….and the grocery stores carry many items that we do not have in our area yet….hoping soon! 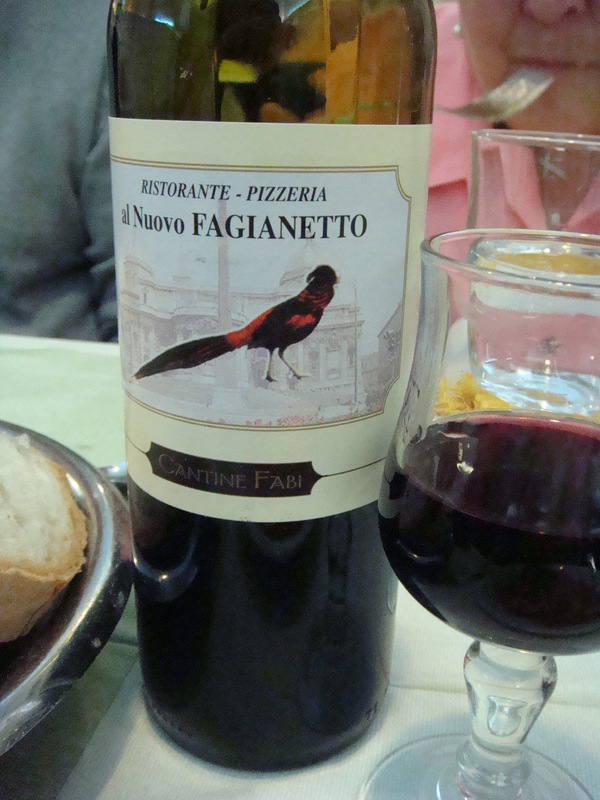 My husband, Lewie, and I were so fortunate to go on our ‟dream trip” to Italy a few weeks ago. We travelled from the US to Lake Como and then worked our way south to Rome on a tour with TravelWorld. 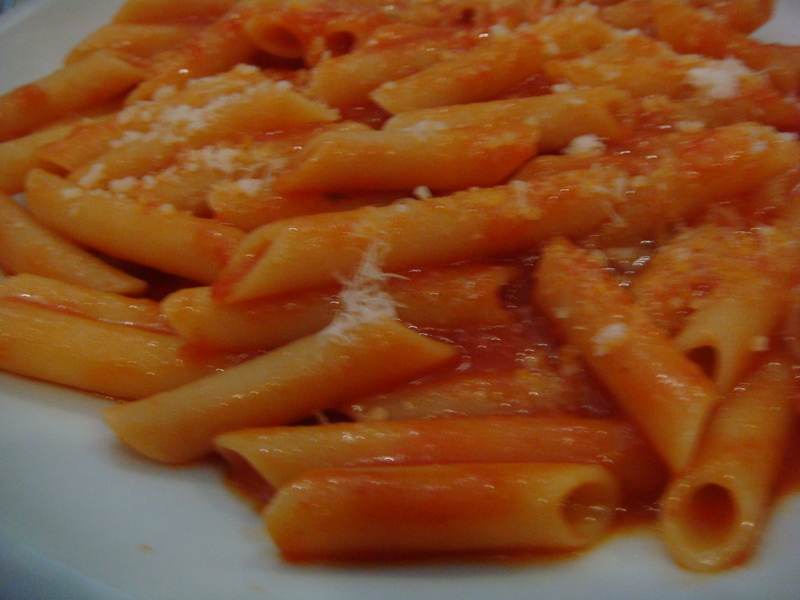 How can you visit the great land of pasta and be gluten-free? Overall, I can say I was well taken care of…since we were part of this tour, we had several group dinners included. These were wonderful! The chefs at each of the venues took such great care of me, it was almost embarrassing! They were so attentive and the food was delightful! While on our own, it was much more challenging! 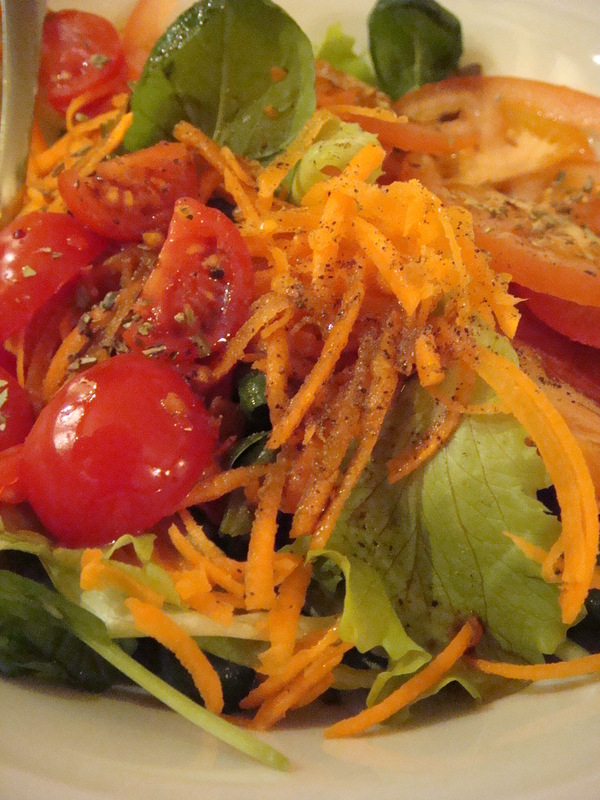 Especially during lunchtime….I mostly existed on salads! And I was hungry most of the time, while everyone else filled up on pizza, cannoli, Panini sandwiches, etc. This was really tough for me! All I wanted to find was gluten-free pizza!! If we had been on our own, we most likely would have been able to chart out where to go for lunch beforehand, but because we were always on a time crunch and couldn’t take the time to get a taxi to find gluten-free food, it was upsetting. So I had salad, salad, and did I say salad? Our first day in Lake Como was so incredibly beautiful but very windy. We were unaware at the time that the hurricane winds from Bermuda were funneling over Europe. 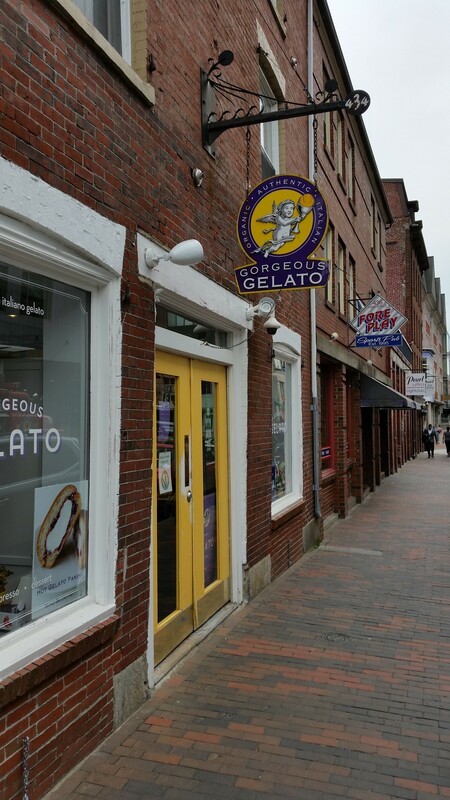 We wore our gelato after eating lunch! 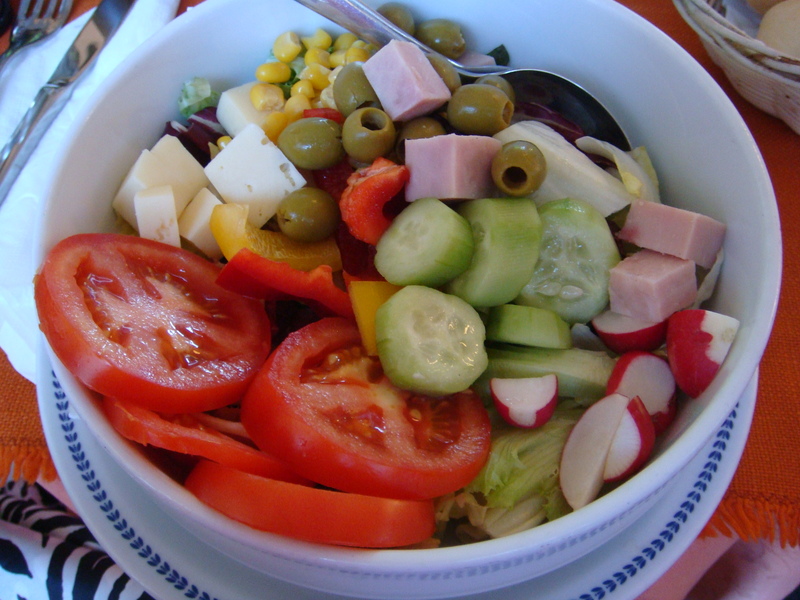 Here is a picture of my lovely ‟insalata”! The greens were so fresh, they tasted like they were just picked out of the garden! 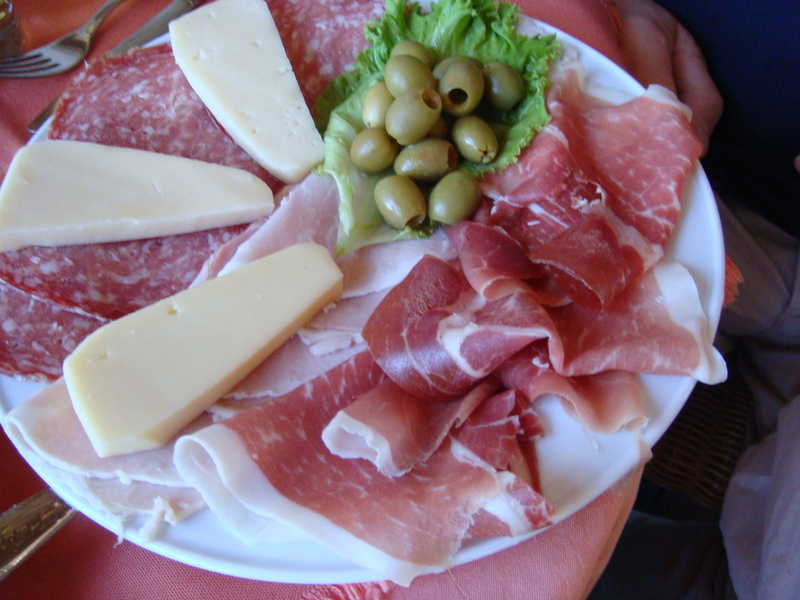 And this was an antipasti ordered by our traveling companions, Marge and Tom….the cheese was incredible….melted in your mouth! Our evening meal at the Palace Hotel was amazing! 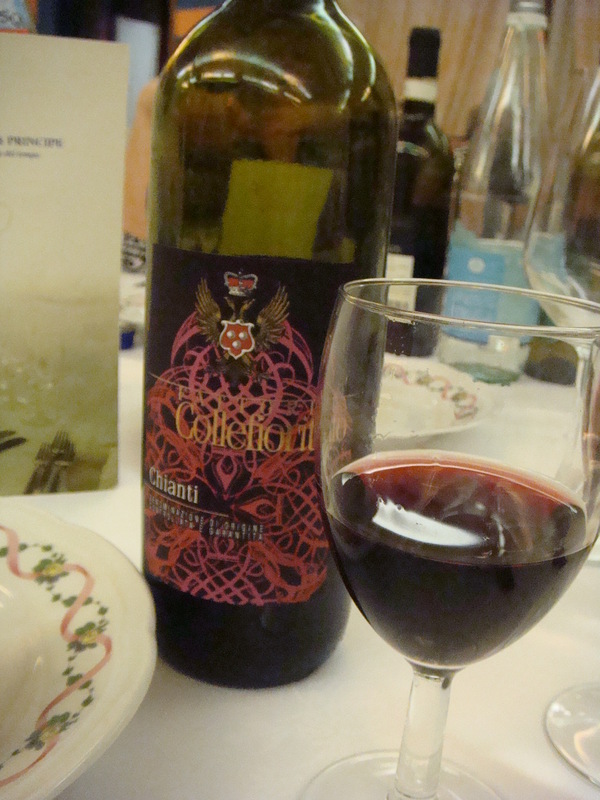 We tasted wines from each region with our dinners, and this one was a winner! 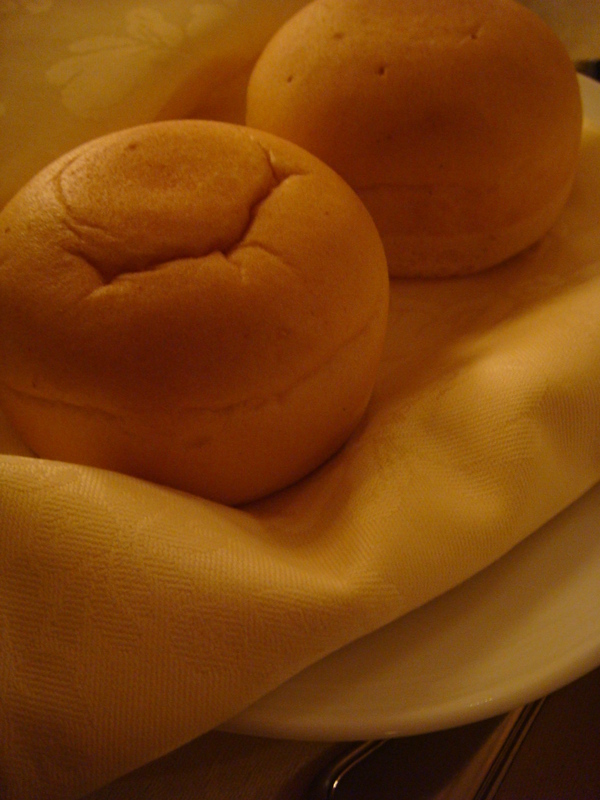 What we found out right away was that you needed to be very hungry when dinner was planned, since there were several courses, including gluten-free rolls for little old me (which were so yummy!). 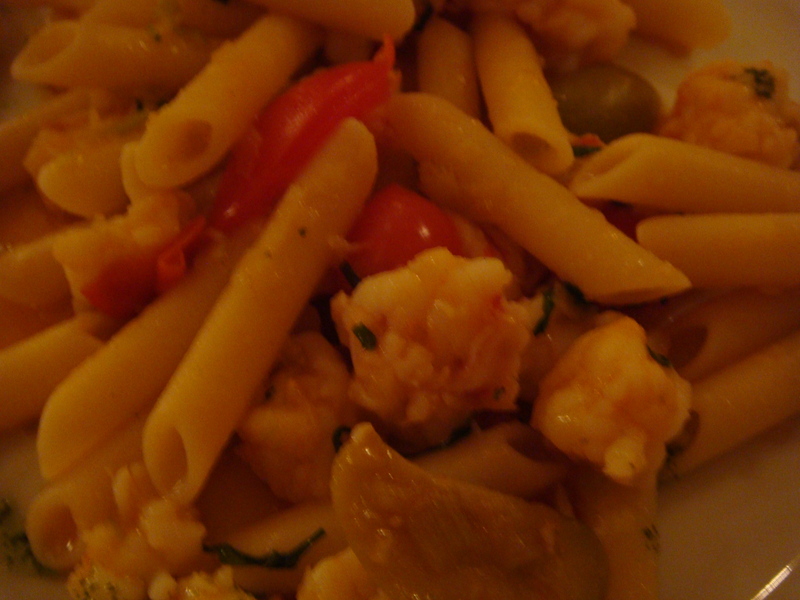 The gluten-free ‟orecchiette” pasta here was served with prawns, olives and cherry tomatoes and was a perfect al dente. How do they do it? 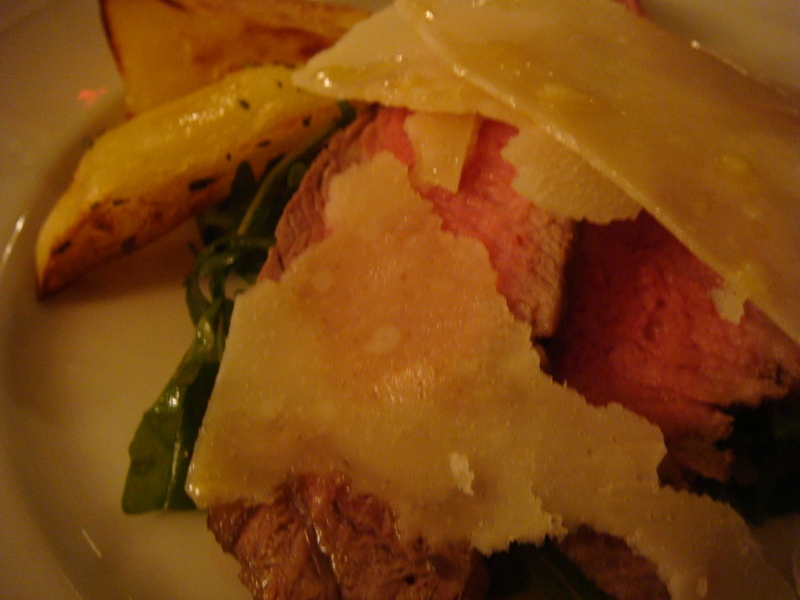 The main course was a pan-cooked sliced entrcôte steak with rocket salad, parmesan cheese flakes and roast potatoes….oh dear! Just melted in your mouth! 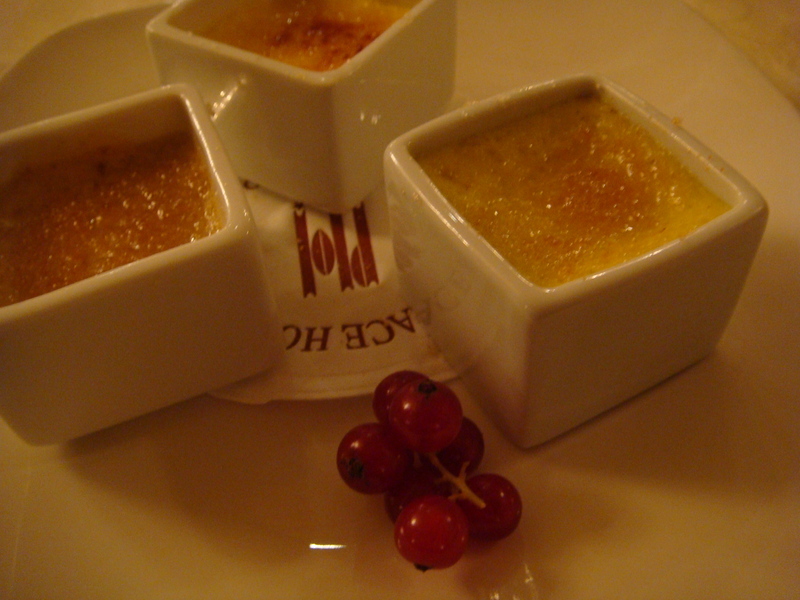 A selection of crème brûlée was served for dessert….mine without the crunchy hazelnut biscuit….to ensure that it was gluten-free! Delightful! The next morning we were off to Venice by way of Padua, and before we left, I enjoyed a great breakfast. It’s a good thing because once again, I had a salad for lunch! But when we arrived in Venice, we were so amazed by the ‟floating city,” food was the last thing on our minds….until much later, when we had a group dinner at Ristorante Noemi , where I had an antipasti, gluten-free pasta with mushrooms and a ‟special dessert” made just for me! 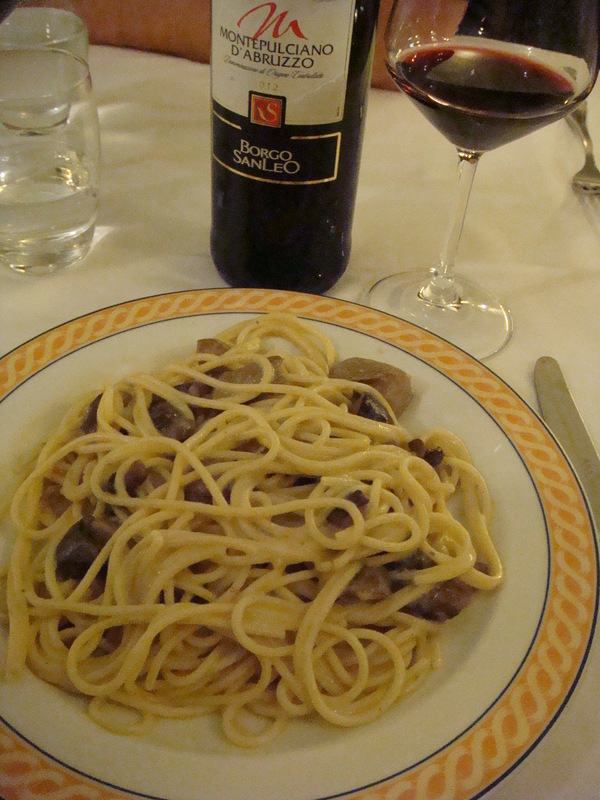 This pasta was the best that I tasted in Italy….it was perfectly cooked and since I love mushrooms, I was in heaven! 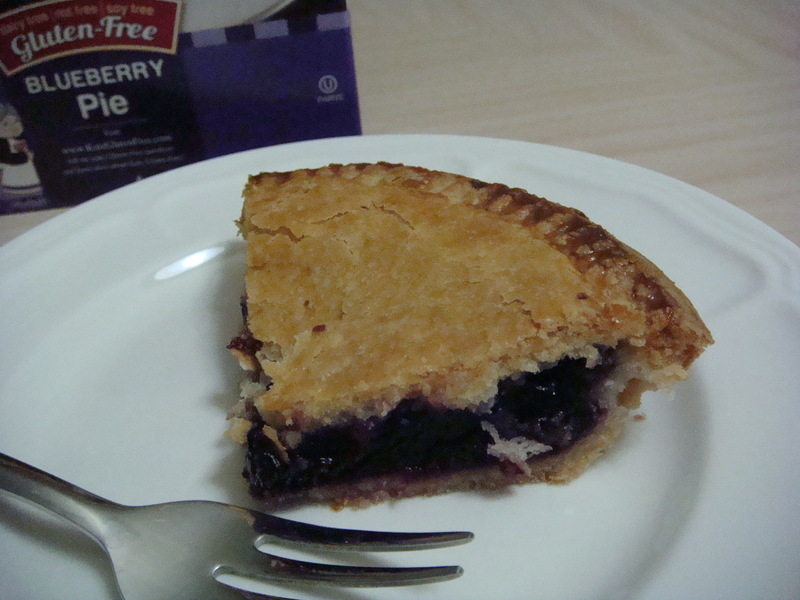 And my dessert….cherries jubilee! It paid to be gluten-free that night! The next morning we had a morning walking tour of Venice and there was very little for me to eat at our hotel, Hotel la Fenice et des Artistes, for breakfast. 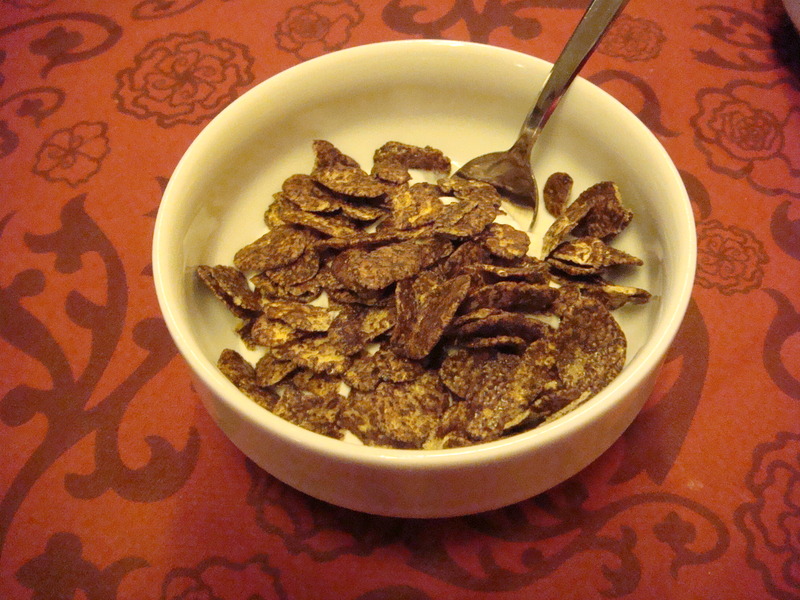 I grabbed some vanilla yogurt and added some cocoa krispy flakes to flavor it….wasn’t too bad! 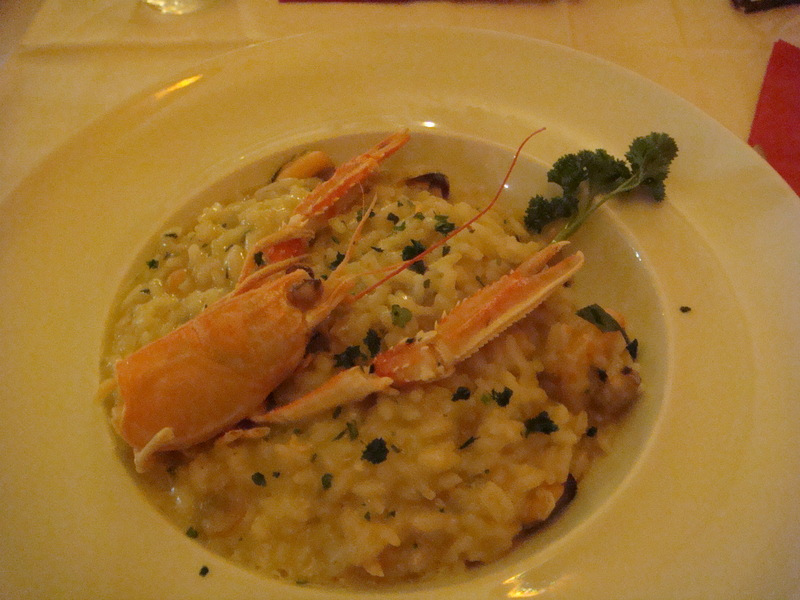 After the tour, we were on our own and luckily found a great little place called Beppino, where I found a great seafood risotto. 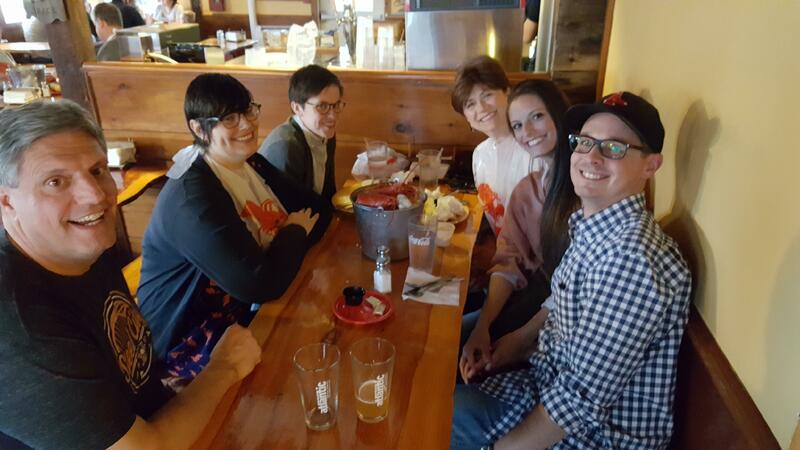 We were able to have a great sit-down lunch and enjoy our food! 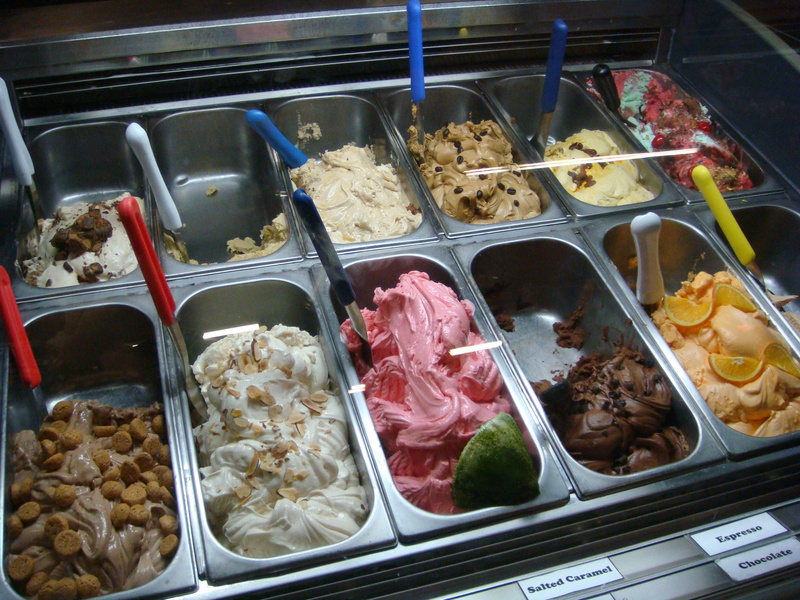 Our afternoon and early evening were sightseeing and tasting gelato….we had gelato nearly every day! You just can’t seem to pass up those places….they are like magnets! See what I mean?? When dinner time arrived, I just wanted something a little lighter. 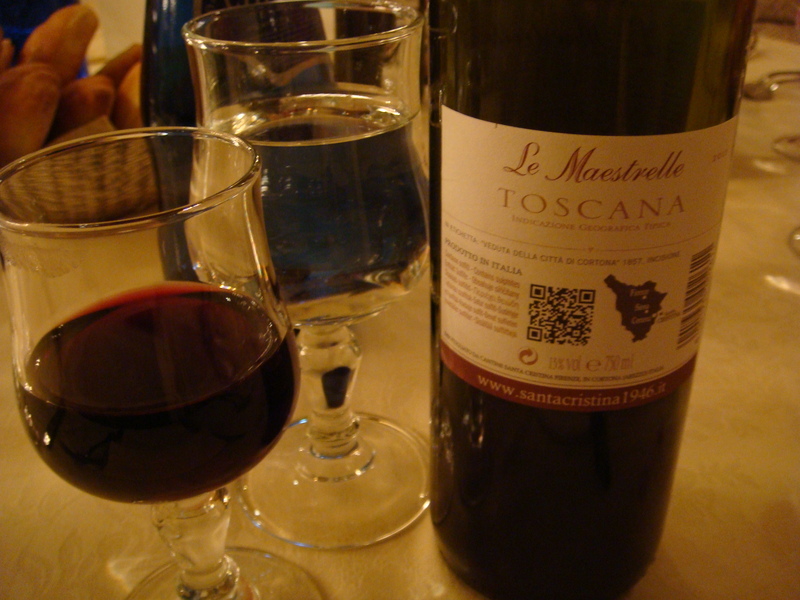 We found a quaint little place, called Ristorante Trattoria Cherubino. Our waiter looked like a friend of mine and it felt so homey there! 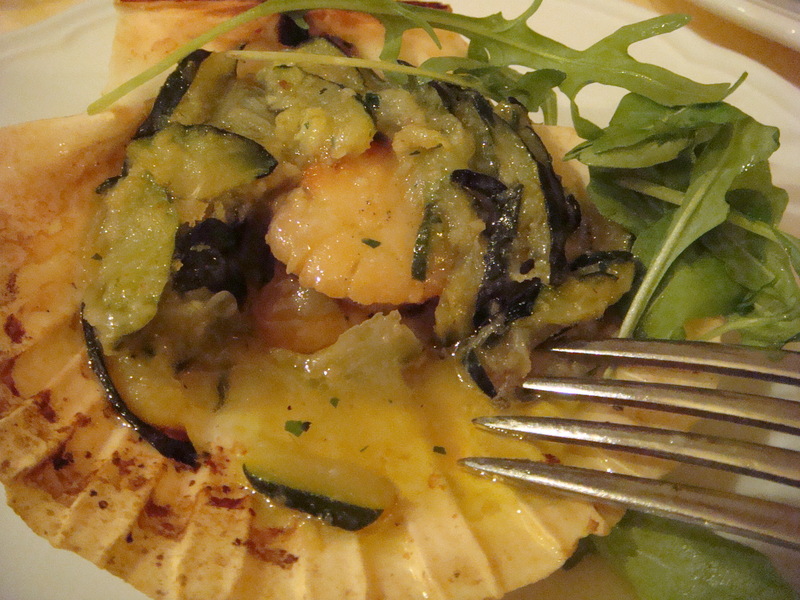 We all ordered scallops on the half-shell with zucchini ribbons. They were to die for! I seriously could have eaten just these….tons of them! 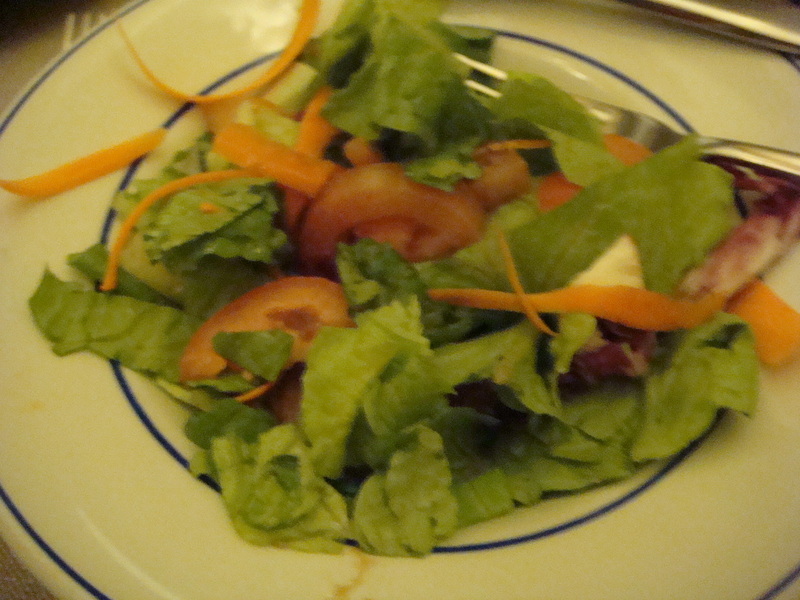 Next, I had a great insalata, followed by veggie soup. Everything tasted so fresh and delicious! 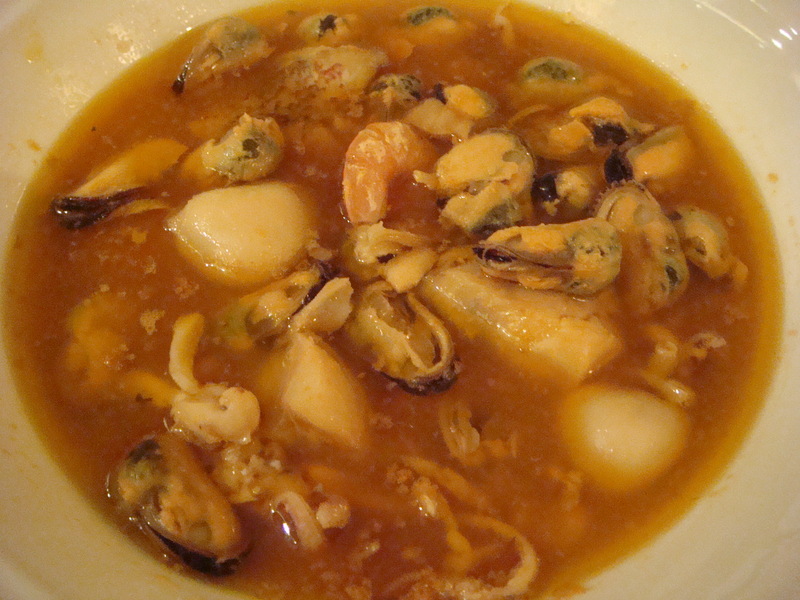 Lewie had the same dinner except he ordered the seafood soup….which I could have ordered, too! Looks good, huh? The next morning, we were on our way to Tuscany, particularly Montecatini Terme. This place could take your breath away….it was so beautiful…one little village after the next with olive trees, lemon trees, and lime trees. Again, I had yogurt for breakfast and when we arrived in Tuscany, we went for a walk to find some lunch and what did I have? Of course you know! A salad! For dinner we had a wonderful meal at our hotel, Grand Hotel Tamerici Principe, and I was treated royally! 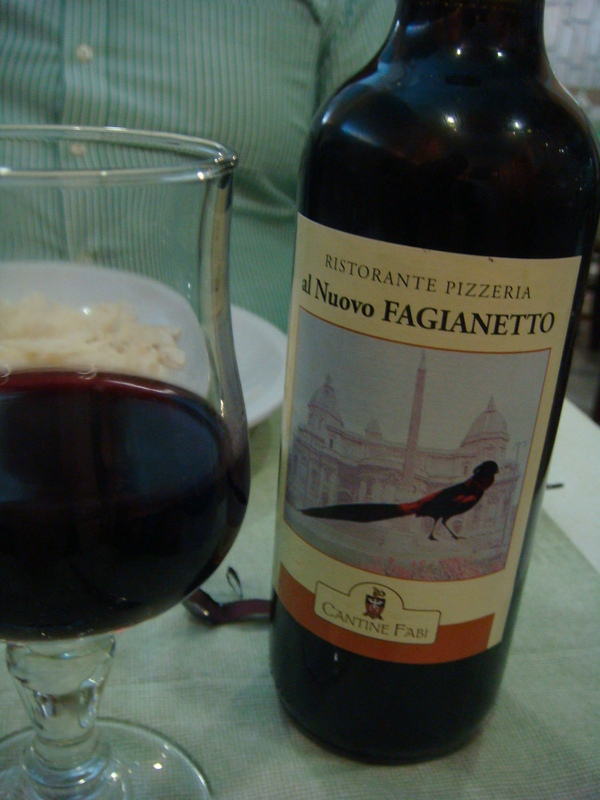 Our wine of the region was a delicious Cianti, which went well with my insalata and gluten-free roll. The chickpea soup with fennel was smooth and pleasant. Mine was made just for me (minus the pasta)! 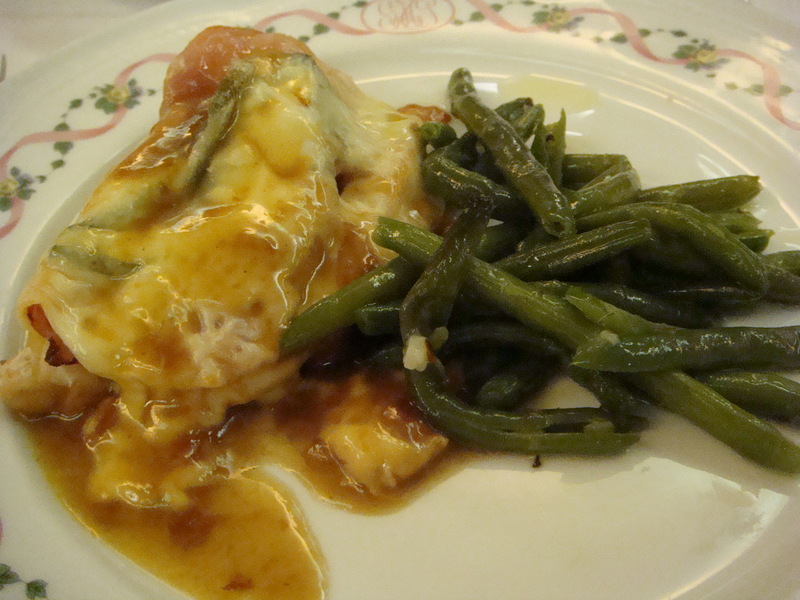 The main course was breaded veal with ham and cheese, so the chef made me chicken with ham, cheese and sautéed string beans. No la spuma di patate (potatoes mousse) for me tonight! No dessert for me tonight! Don’t think I could have fit it anyway! Our next day began with eggs, bacon, and fruit for breakfast! Then we were on to Florence to see the world’s most famous sculpture, Michelangelo’s David at Galleria dell’Accademia. We had such a busy day and of course, I had a salad for lunch. 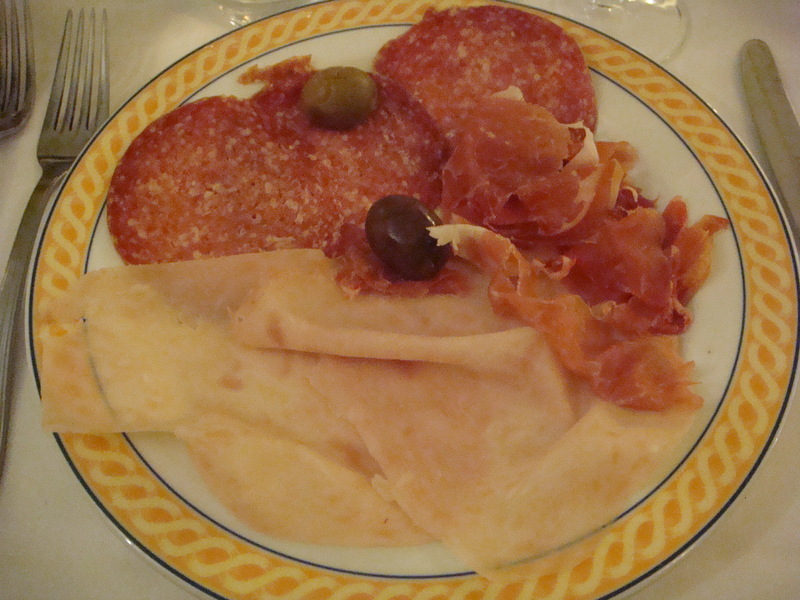 When we returned to Montecatini Terme, we found a great little place for dinner called Trattoria il Vicolo. 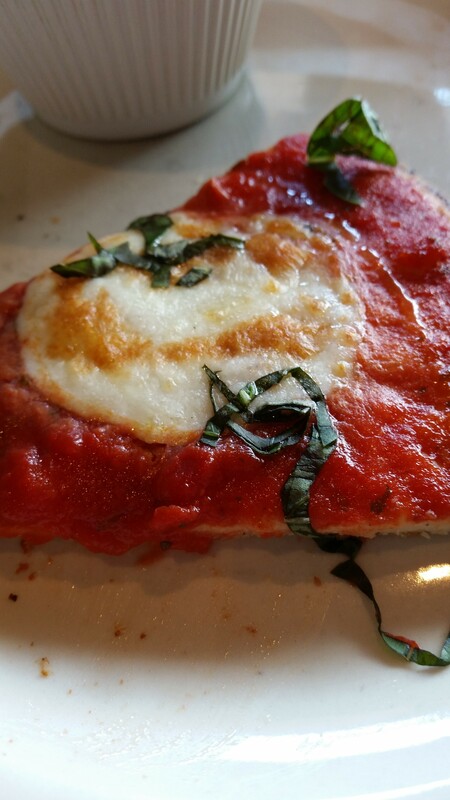 The staff was very familiar with ‟senza glutine” (no gluten) and I was very happy! 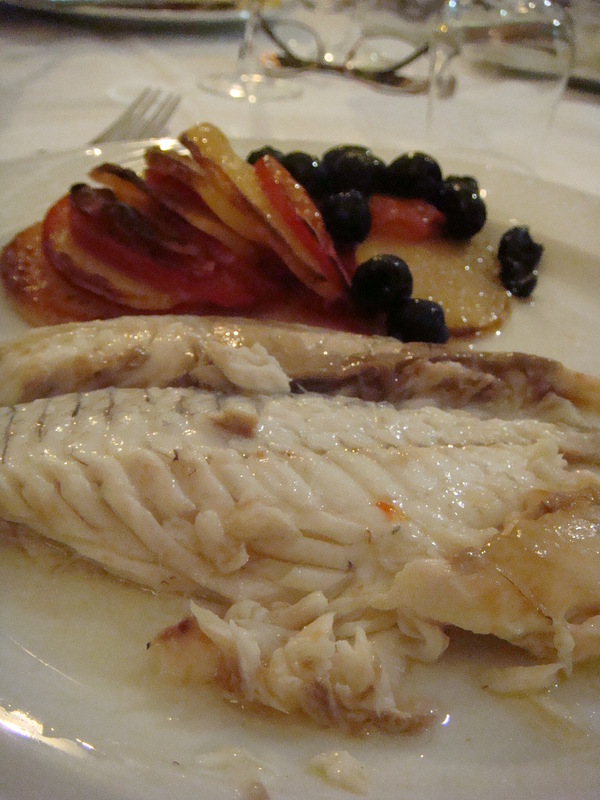 I ordered branzino (sea bass) and it was complemented with a tomato/potato flan….accented with black olives. The fish was perfectly cooked….yummy! 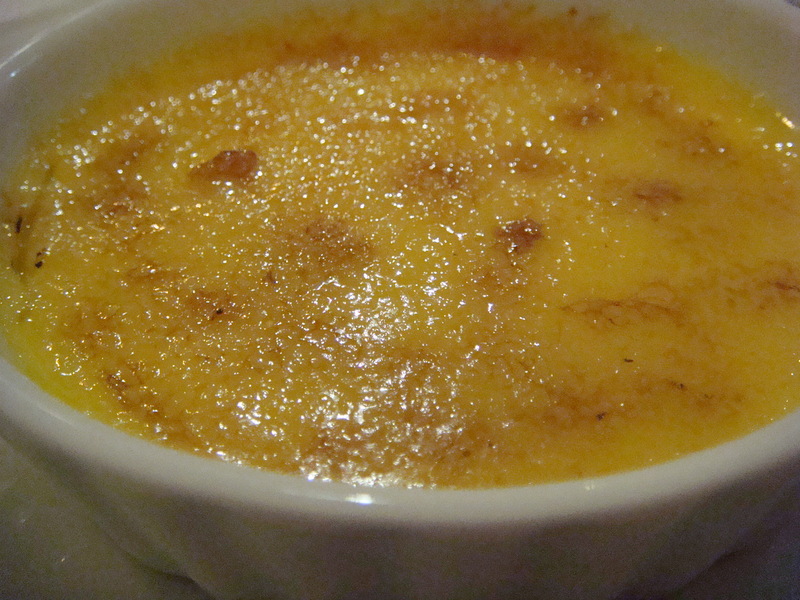 To top off the meal, I ordered vanilla bean crème brûlée….it had such a great texture! And it was so tasty! 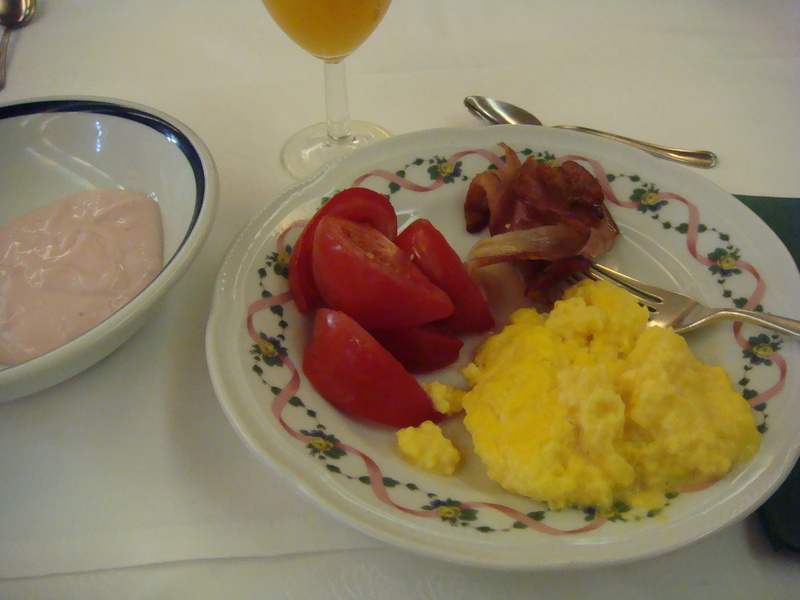 I had a repeat breakfast from the day before and then we were off to Rome, by way of Siena. Siena was such a great stop along the way….we loved this medieval city! And it was here that I actually had a lunch of porketta and cheese with balsamic vinegar (minus the bread, of course!). 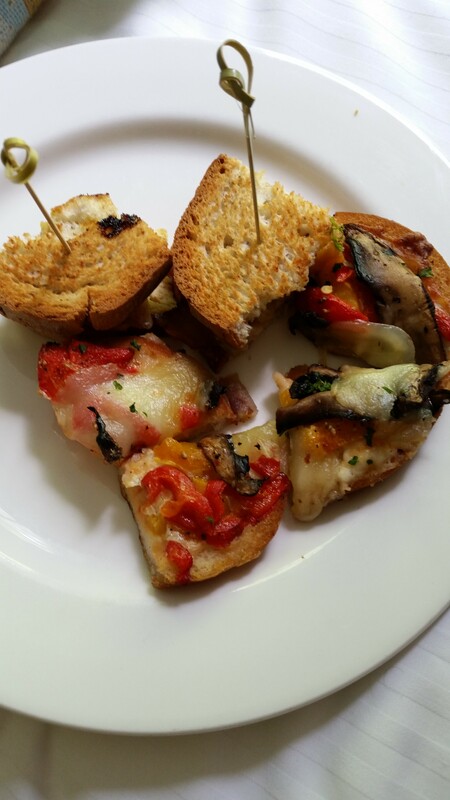 The enoteca (wine bar) was located right off of the Il Campo and it was so delicious….I am just so sad that I forgot to take a picture of it! We had so little time to eat lunch that day! 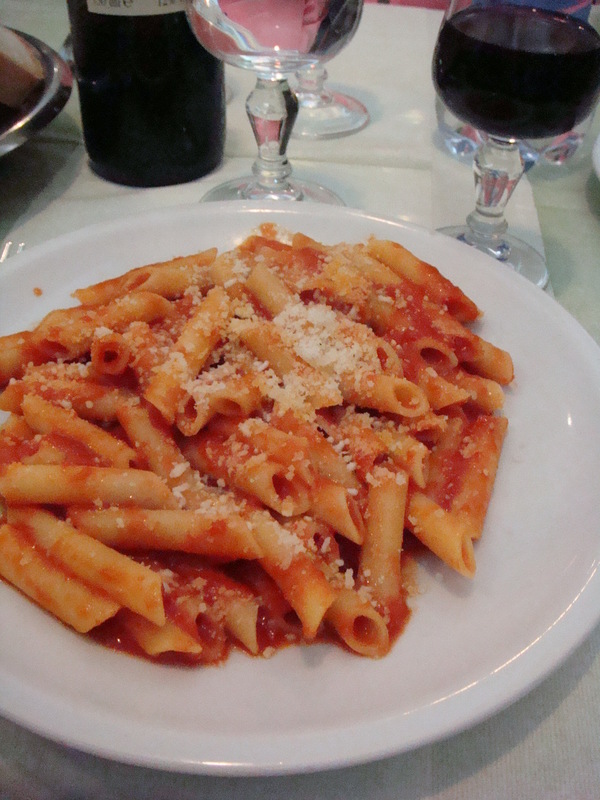 When we arrived in Rome later that day, we had a group dinner at al Nuovo Fagianetto where I enjoyed some wine and gluten-free penne pasta with marinara sauce. 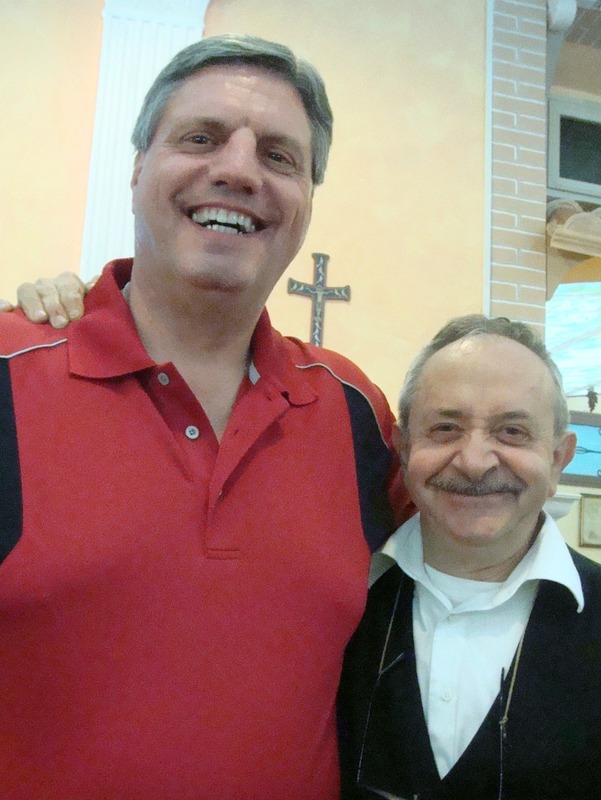 My Lewie, ‟Luigi,” met Mario, the owner, and they hit it off immediately….see what I mean? 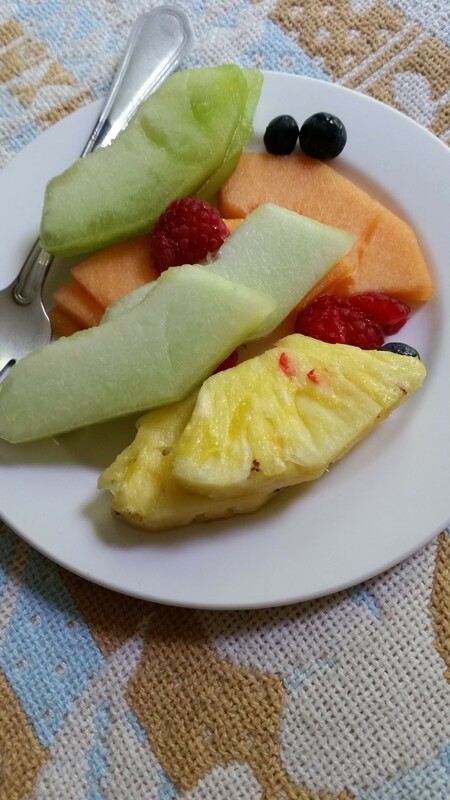 To end my simple meal, I had some fruit….simple and delicious! 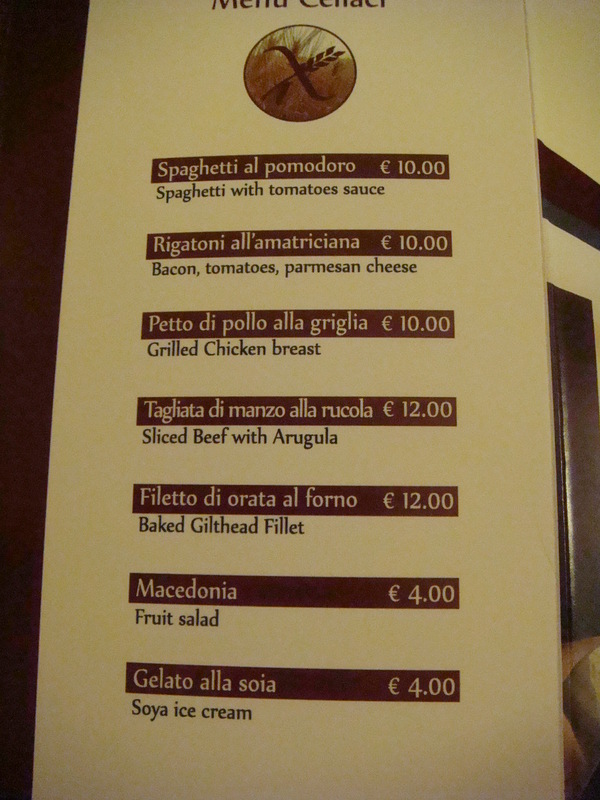 It was so nice that our hotel in Rome, called the Best Western Hotel Universo, had a gluten-free menu. 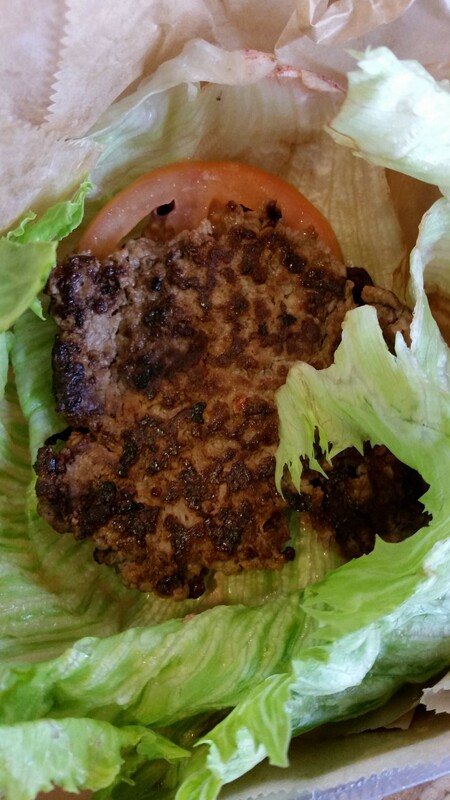 I ordered a sandwich-to-go for lunch and it was fair….meat a bit too fatty for me! No picture….forgot to photograph it! After our day of sightseeing in Rome, we had dinner on our own. We were exhausted and decided to try a restaurant nearby the hotel. 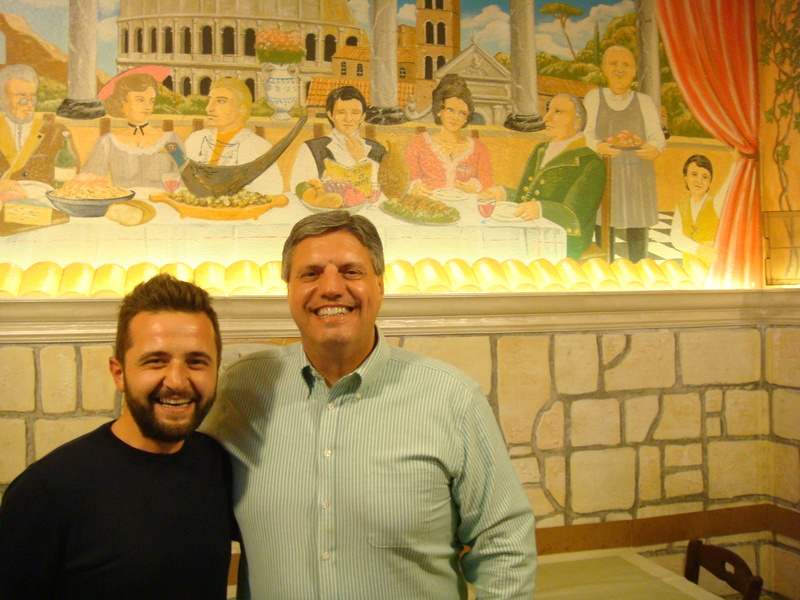 It was called Trattoria Grotta Amatriciana and turned out to be a fun place! 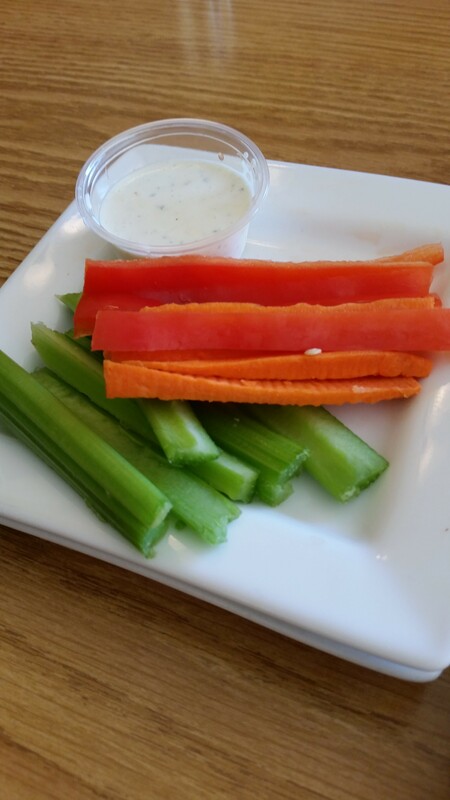 I was able to have a salad….of course! 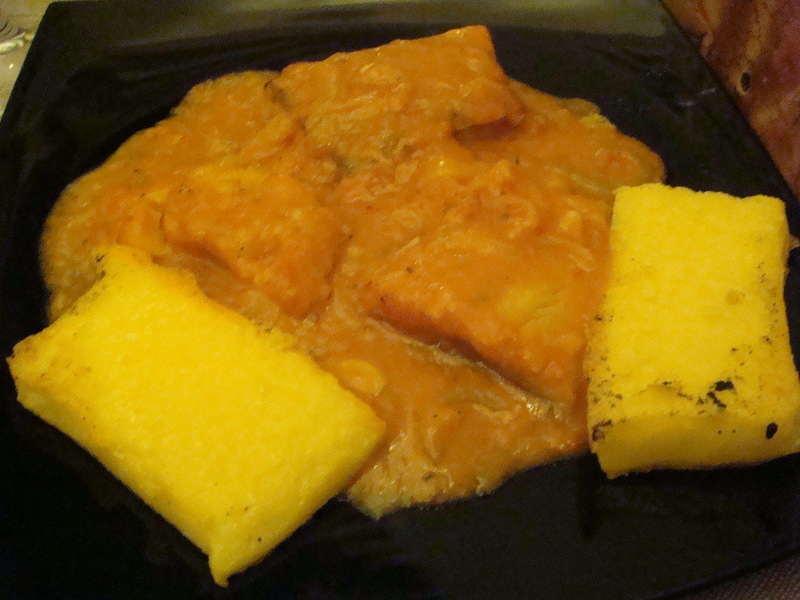 And then I ordered baccalà (cod) with polenta in marinara sauce…..this picture doesn’t do it justice….it was very good! 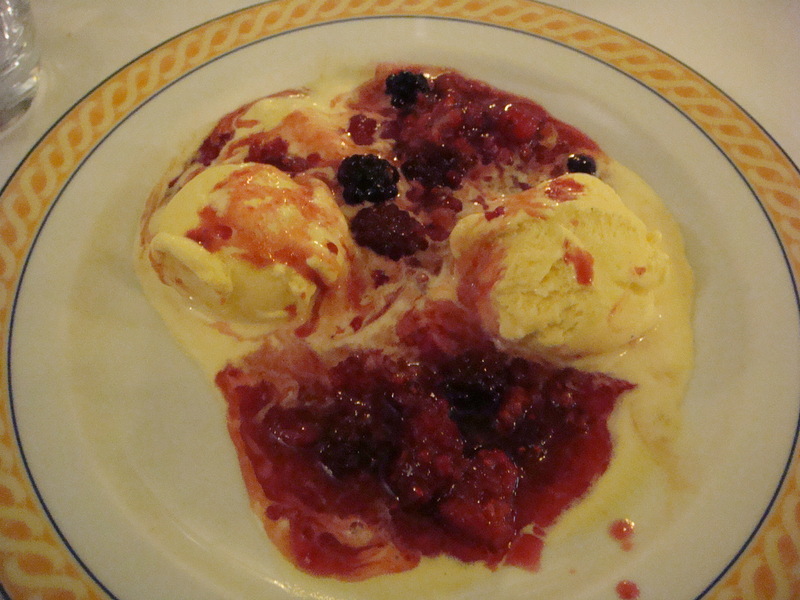 Vanilla ice cream with raspberry swirl topped off the meal but didn’t get photographed! I was too excited to eat it! 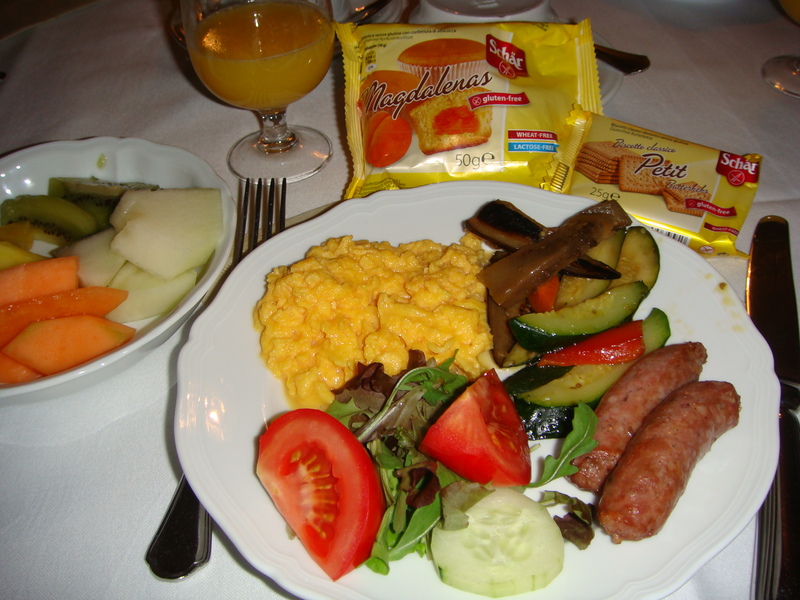 Our next morning began super early and luckily I had stockpiled some gluten-free items from the Hotel Universo’s kitchen. 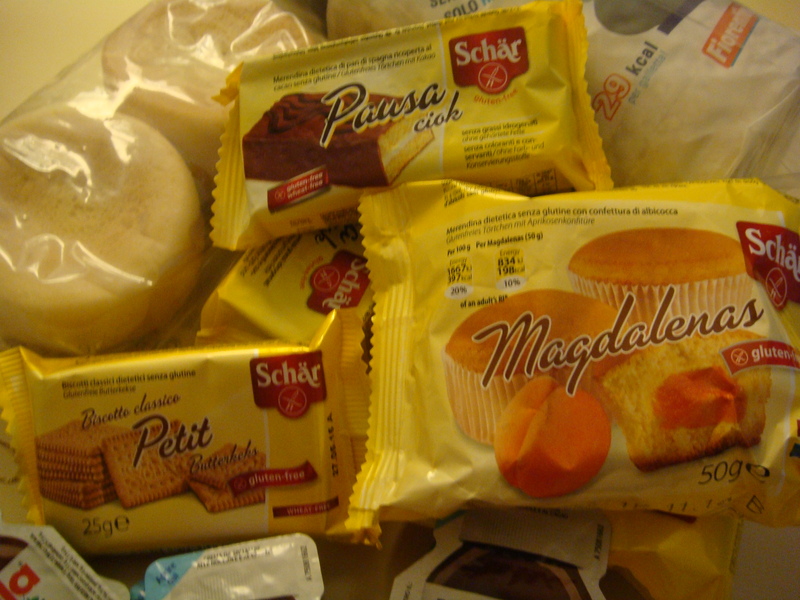 I started the day with some gluten-free crackers and Magdalenas….thank goodness for Schär products! We were off to see Pope Francis and we could hardly contain our excitement! What an honor to be part of the Papal blessing in St. Peter’s Square….something we will never forget! It was the most uplifting event we ever attended! Upon leaving the Papal blessing, we headed toward the Vatican Museums. 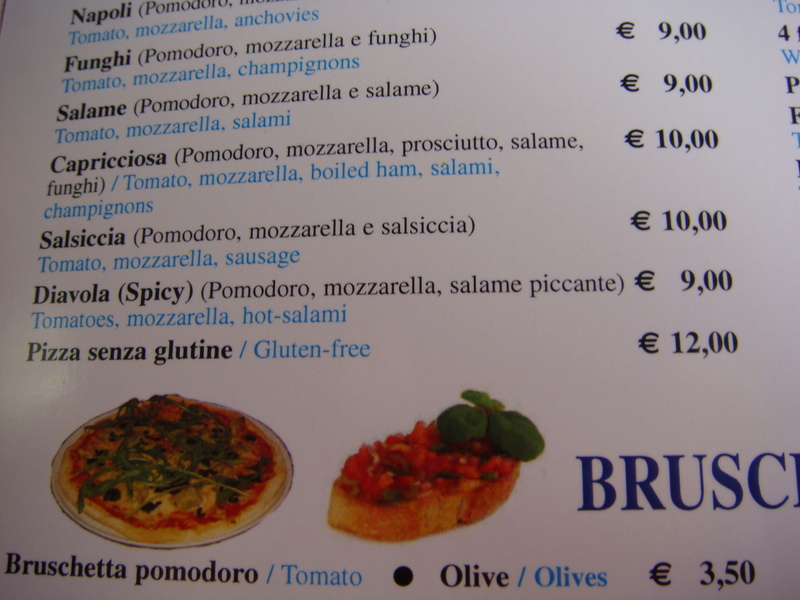 One of the women on our tour told me she had spotted a sign for gluten-free pizza the previous day. We had to check it out….it was our last full day in Italy and I still had not found pizza! I can’t tell you the elation when we found this sign!! And, how about this menu? The man who took my order was all smiles, as was I…..he must get this reaction most days! 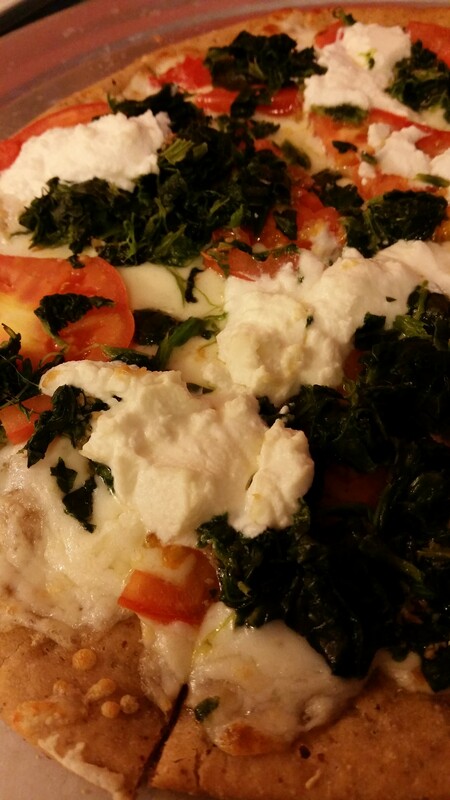 And, I am not kidding….when my gluten-free pizza arrived and I tasted it, I was in heaven! 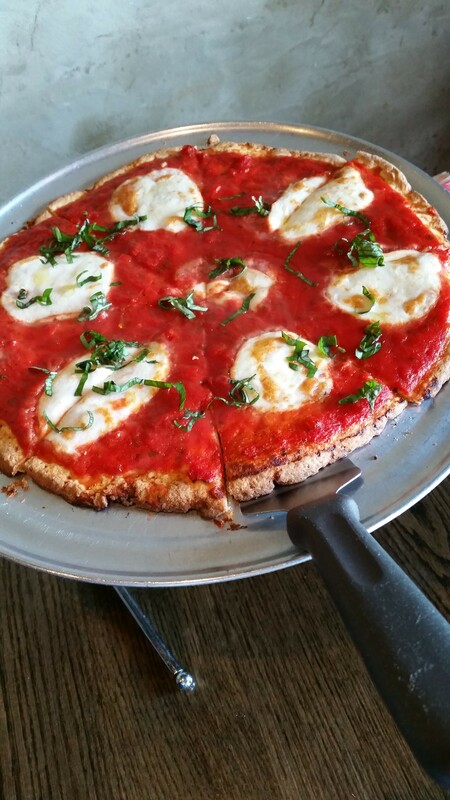 It seriously was the BEST gluten-free pizza I had ever had! 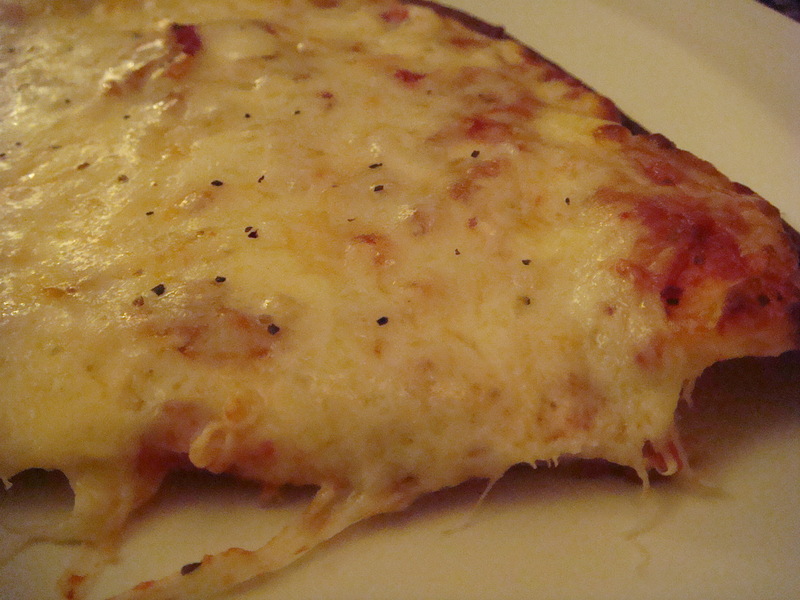 The crust was so wonderful (the closest to ‟regular” wheat crust) and the cheese was gooey and chewy! Oh how I wish I could order a takeout right now!! At least I have my memories, right? After I ate ¾ of the pizza….no kidding….we walked and walked and walked….and got lost and lost and lost….thank heavens we had a map (albeit a small, ‟need your bifocals” map)! Between our finding the Trevi Fountain (which was under construction) and the Spanish Steps, we stopped for gelato at Gelateria Siciliana. 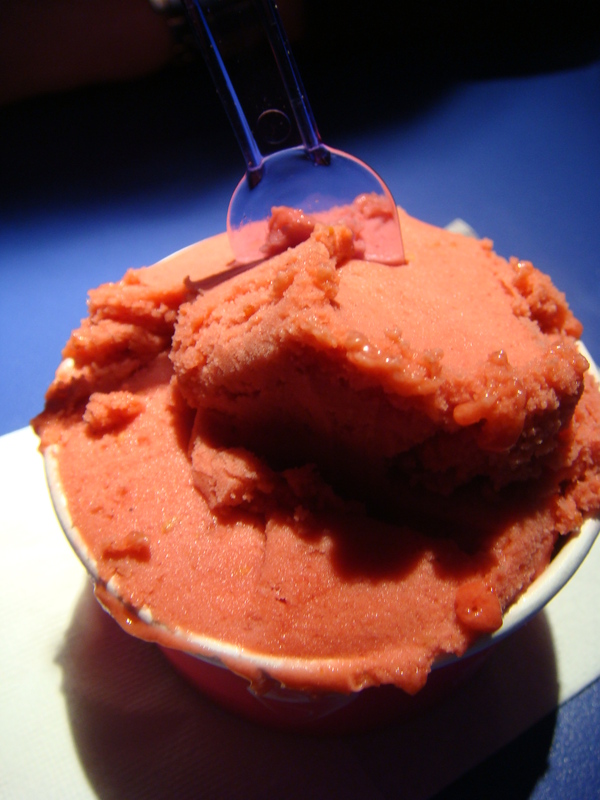 Mine was raspberry….turned out to be my least favorite of all of my Italy gelatos. We got a taxi back to the hotel since we were so tired and on the way back, we witnessed a motorcycle and taxi accident! Both parties were yelling Italian obscenities at each other and everyone around them chimed in …..quite the scene! For dinner our group returned to al Nuovo Fagianetto and since the owner, Mario, wasn’t there, his second-born son Marco, had to provide my gluten-free dinner. He didn’t speak much English but did his best to accommodate me. I had a repeat meal of gluten-free pasta and chicken with peppers (but forgot to take a picture!). Notice the painting behind them….father, Mario, is on the far right! 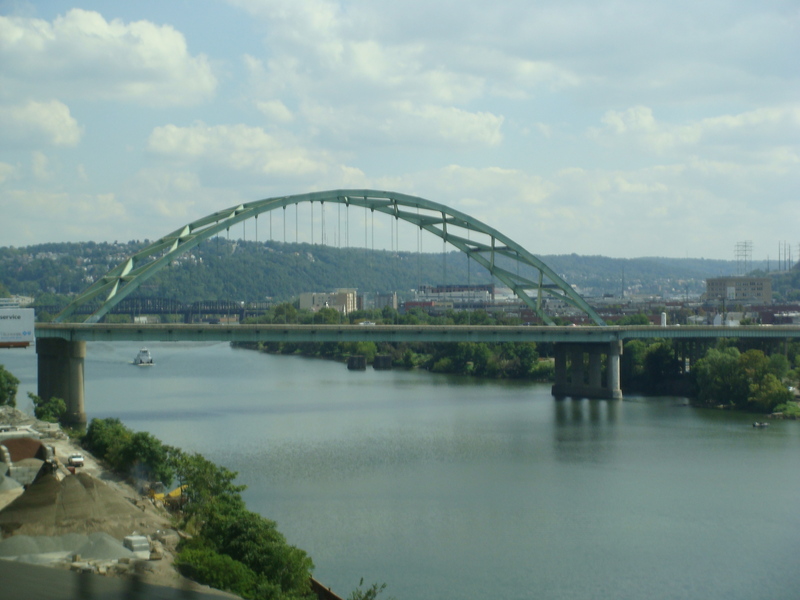 It’s such a great city….so many beautiful bridges, churches, cultural events, and sports teams! 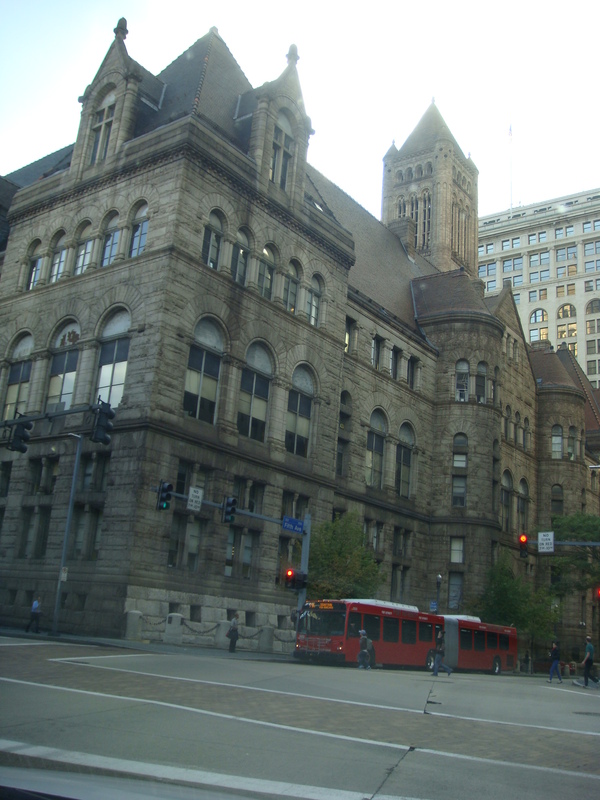 I love the city…so much hustle and bustle! 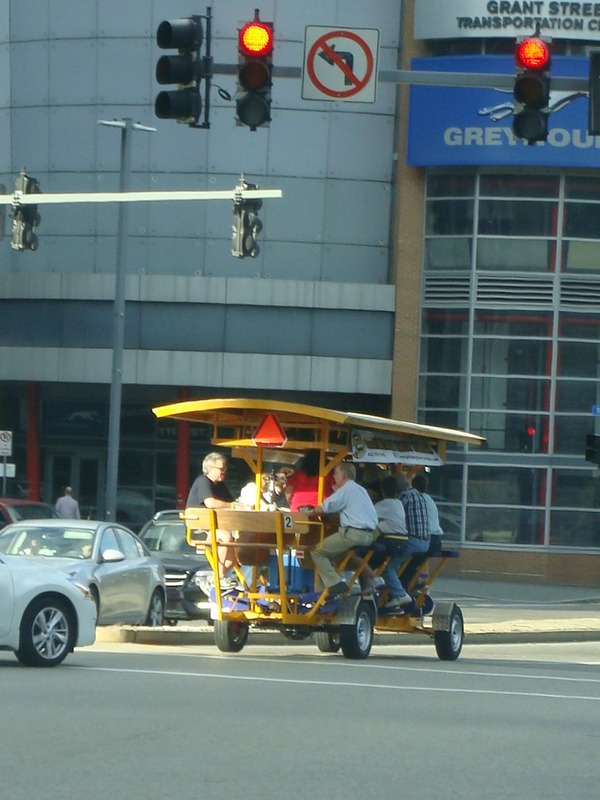 Heading over to the famous Strip District, we saw a group of people riding on what looked like a bike for multiple people….found out it’s the Pittsburgh Party Pedaler! Looks awesome….doesn’t it? My husband was in Pittsburgh on business. He goes out to the “Steel City” fairly often, but this time I was able to accompany him. I hadn’t been out in a few years so I was happy to go! Yay! We arrived at the Strip District (only a half-mile strip of land) which is nicknamed “Foodie Heaven” where you can find ethnic grocers, restaurants, and local merchants selling everything “Pittsburgh!” Since I needed a Pirate shirt to wear to the upcoming baseball game, we grabbed that first, shopped up and down the street, and then needed to find some lunch. Thai food is usually a good choice for someone needing gluten-free options, so we were lucky to find Little Bangkok right on the main street. The lunch specials were appetizers and soups, so since we knew we were going to be eating a huge dinner, we decided on Bangkok summer rolls and two bowls of Tom Yum soup. 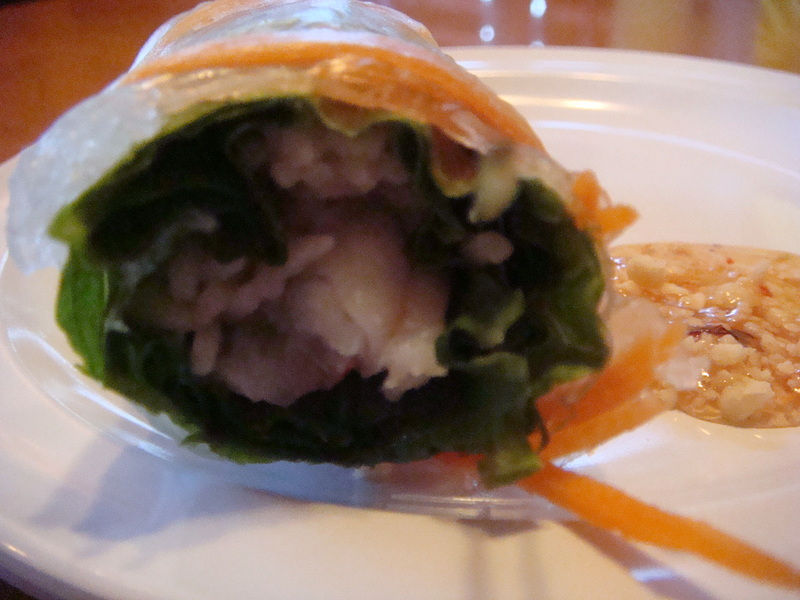 The summer rolls feature rice paper filled with veggies, fried tofu, mint, Thai basil and rice noodles. 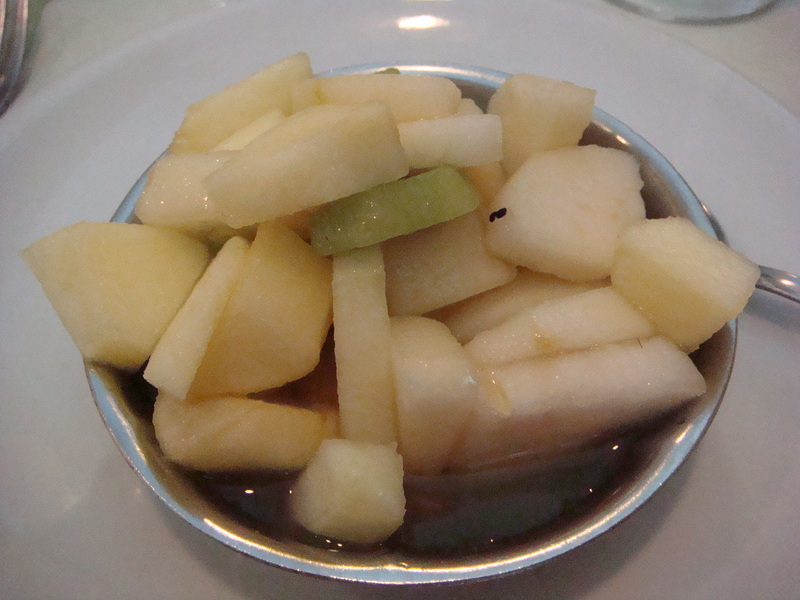 These were served with peanut dipping sauce (which I asked to be made with my organic tamari wheat free soy sauce). I carry it in my purse always!! 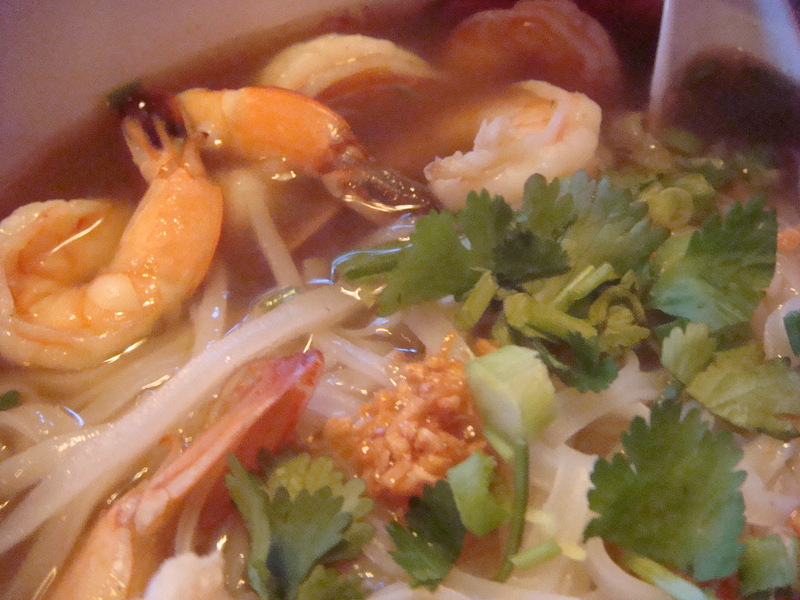 The Tom Yum soup is a traditional spicy soup flavored with lemongrass, kaffir lime leaves and Thai chilies. Oh Yum!! It is the best! After lunch, we needed to walk around a bit to digest and then back to the hotel to get ready for our dinner at Lidia’s. Lewie was honoring a colleague on her retirement and I was invited, too! When we sat down to order, our server pointed out the many options that I had and told me that all of the gluten-free entrées were prepared in separate pots, pans and areas of the kitchen. 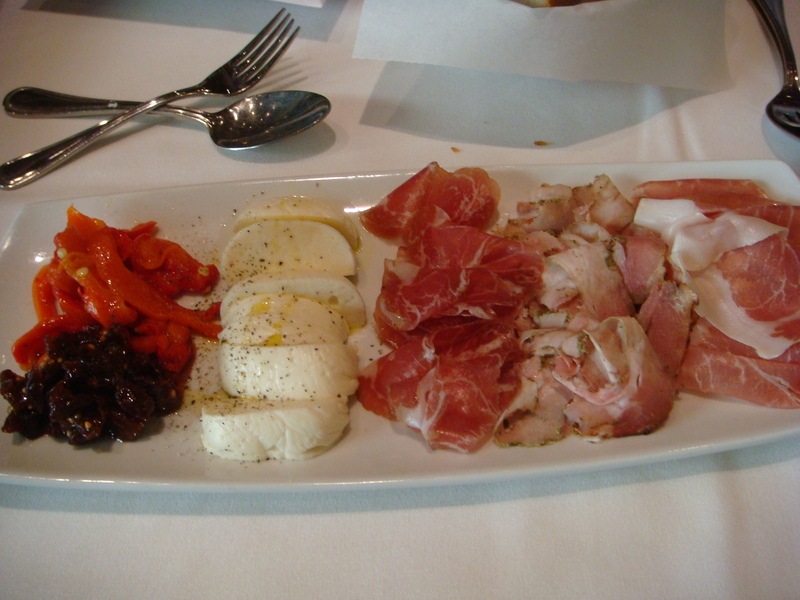 Chef Jeremy even made sure that we were provided with an appetizer of fresh mozzarella, olives, prosciutto, and Italian meats. Delightful! 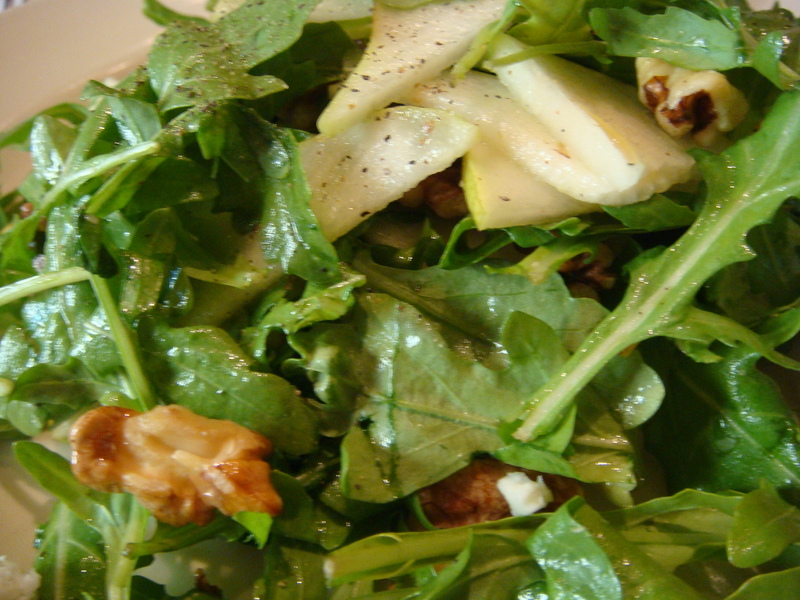 First I had a salad “insulate di rucola” which was arugula with shaved pears, walnuts, and gorgonzola crumbles. Best way to start a meal! 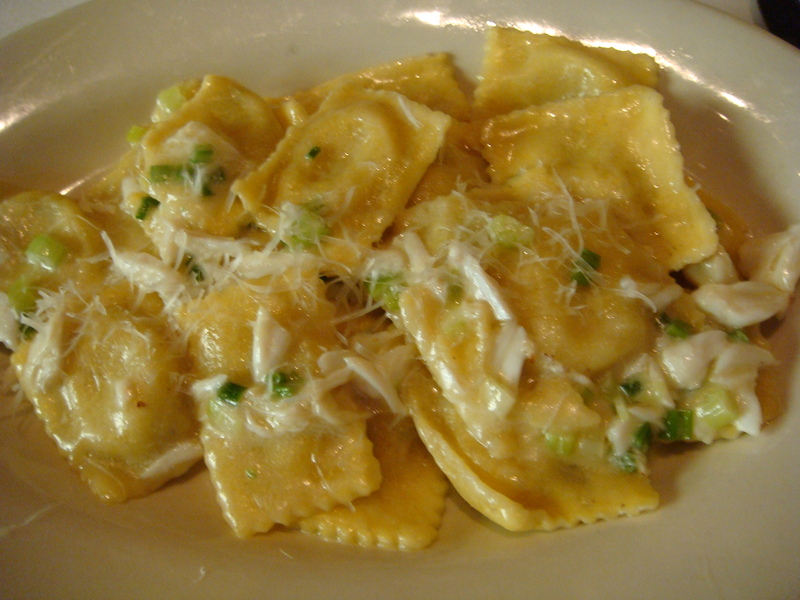 Next, I decided on the “ravioli di mais” with scallion butter and jumbo lump crab for my entrée and I was not disappointed. It was homemade gluten-free corn pasta and was prepared al dente which was perfect! So delicious and filling! For dessert I had Nutella ice cream but was so excited that I forgot to take a picture! Forgive me! 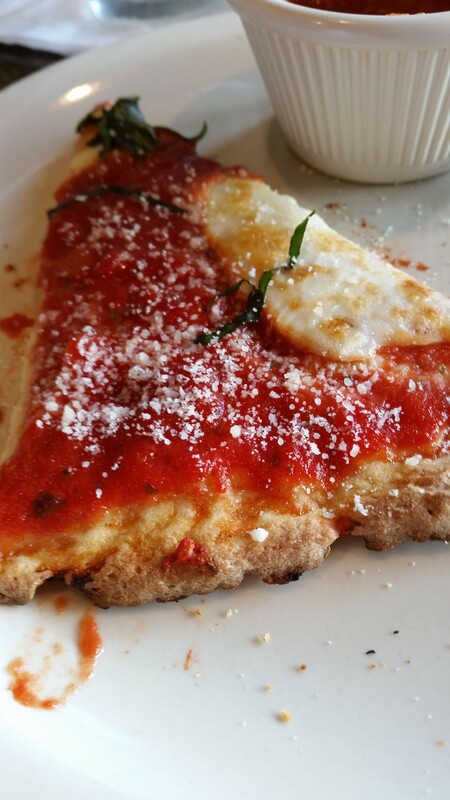 The next day, during our walk, we stopped for lunch at Uno Chicago Grill for pizza. 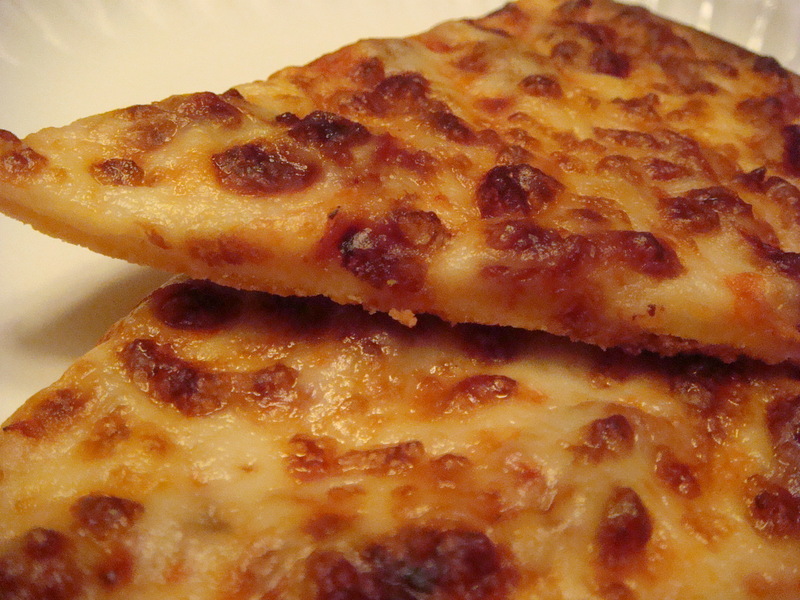 I just LOVE pizza and this is probably the food that I miss most. During the first year after my diagnosis, if I smelled pizza, I would immediately feel like I could cry! I know it sounds crazy but only a fellow celiac can understand this! 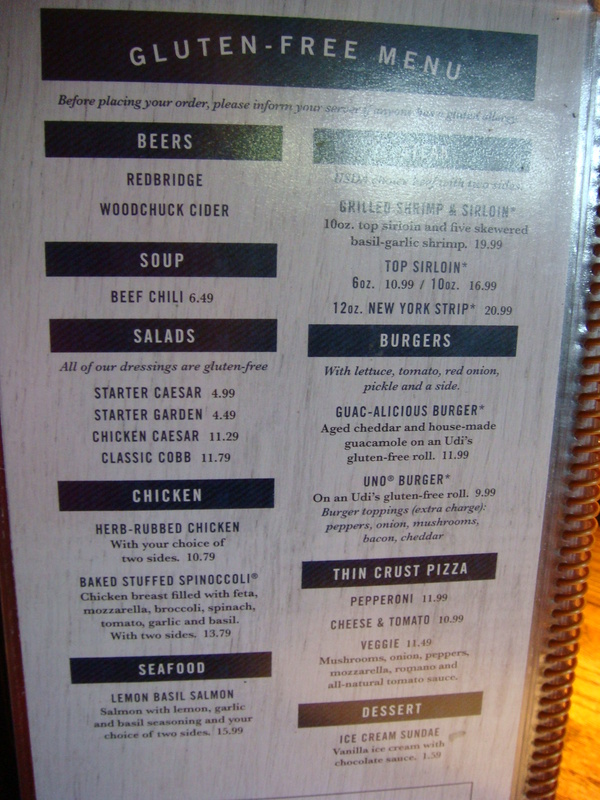 Anyway, Uno has a gluten-free menu and tries to accommodate those living gluten-free. If you are extremely sensitive, I would not recommend this restaurant, due to the cross contamination in the kitchen. I am able to eat here without too much distress and I did enjoy my veggie pizza. 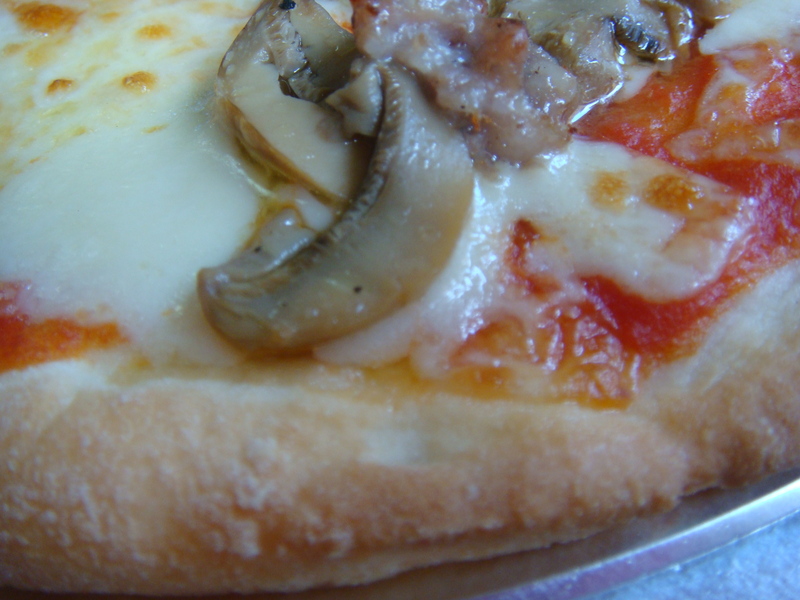 The crust on most gluten-free pizzas is still not anywhere near “regular” pizza and I am still in search of a gluten-free pizza crust to die for! If anyone knows of one, please let me know….thanks! 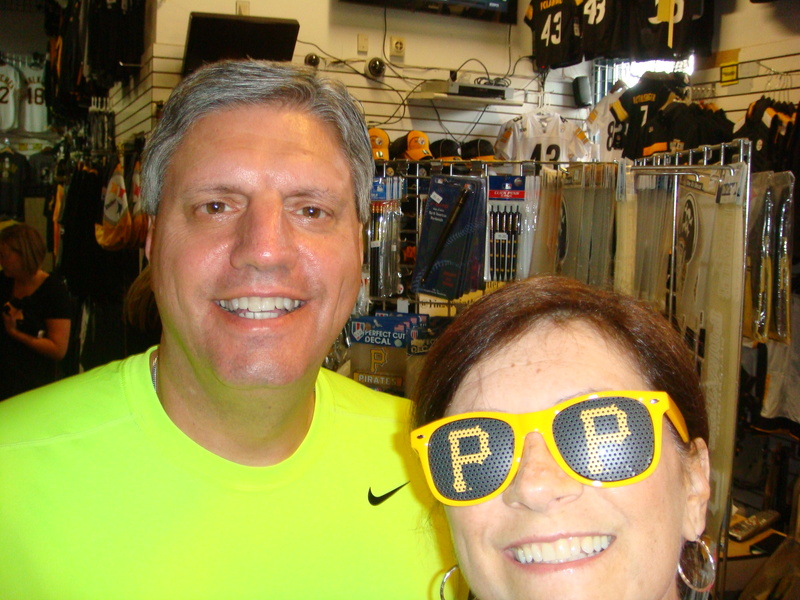 My husband Lewie has been a Pittsburgh sports fan since he was a little boy. 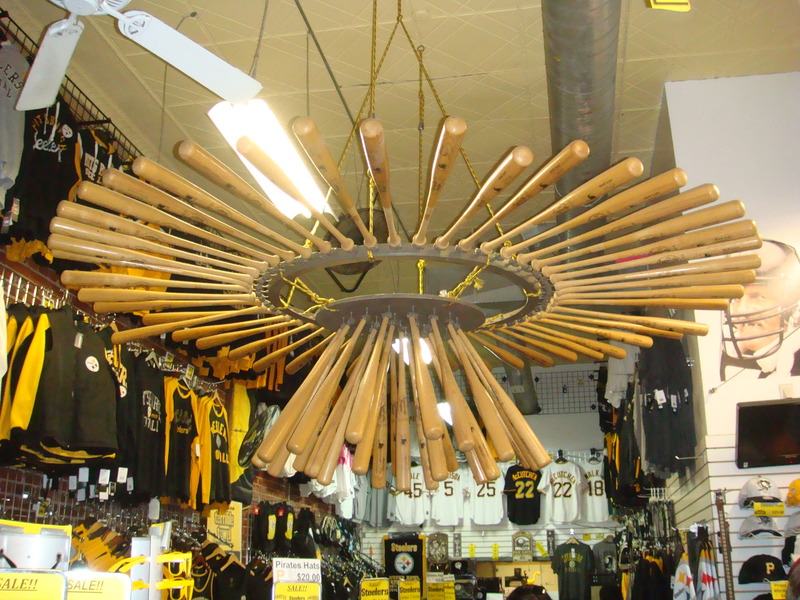 He especially loves the Pirates baseball team and when we visit, we usually get tickets to a game. 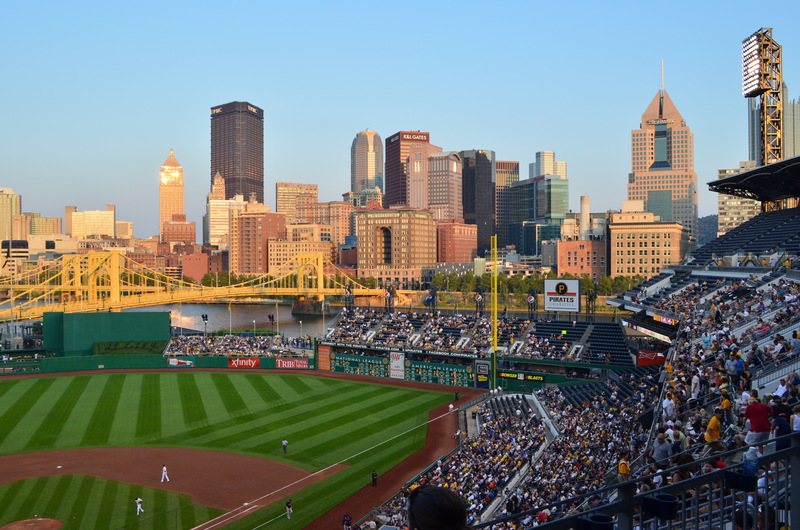 In fact, he tries to plan his visits to Pittsburgh when the team is home! 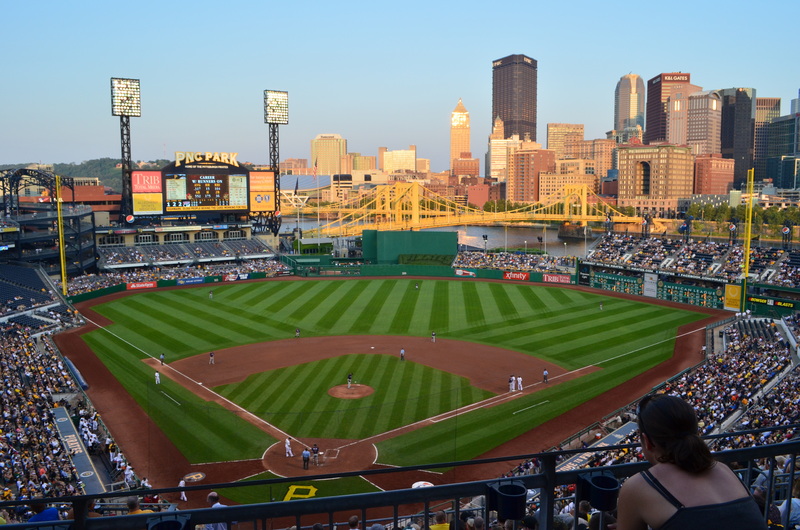 So how excited was I to find out (ahead of time) that PNC Park (where the Pirates play) has a food stand in the stadium that has gluten-free options. YES! 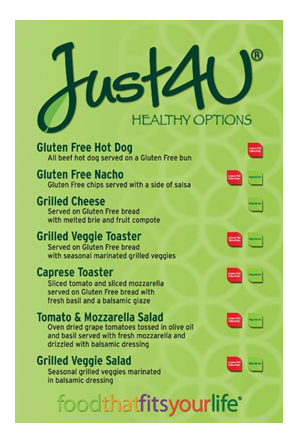 It’s called Just4U Healthy Options and serves “baseball-type” food for people with celiac disease, food allergies, and who are vegetarian or vegan! When we approached the stand, the line was several people deep, and I was so happy to see gluten-free buns for kosher and gluten-free hotdogs, as well as gluten-free tacos with healthy salsa. But when I smelled gluten-free pulled pork on a gluten-free bun, I knew what my choice would be! I also had a side salad which was delicious, too. No pictures, though….forgot my camera! Who knew gluten-free people could enjoy food at the ballpark?? Thanks, Aramark Sports and Entertainment! 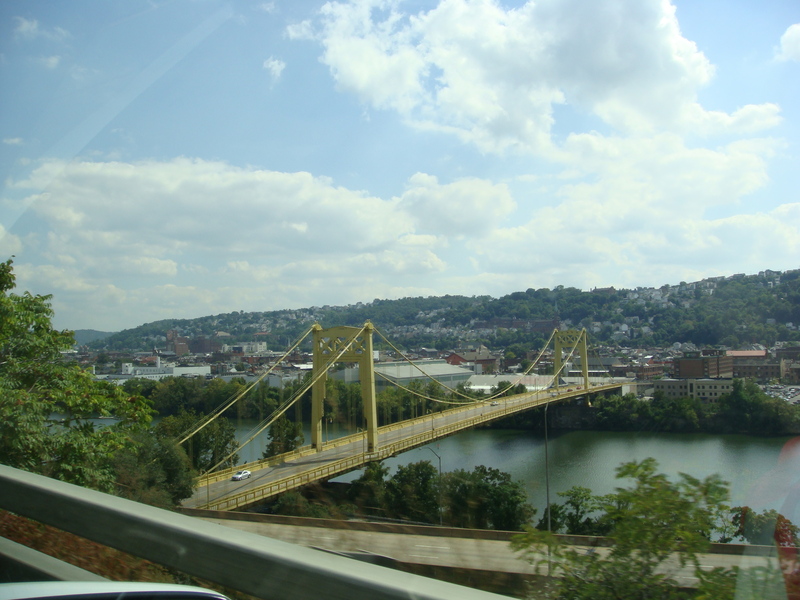 I hope you enjoyed my visit to Pittsburgh!